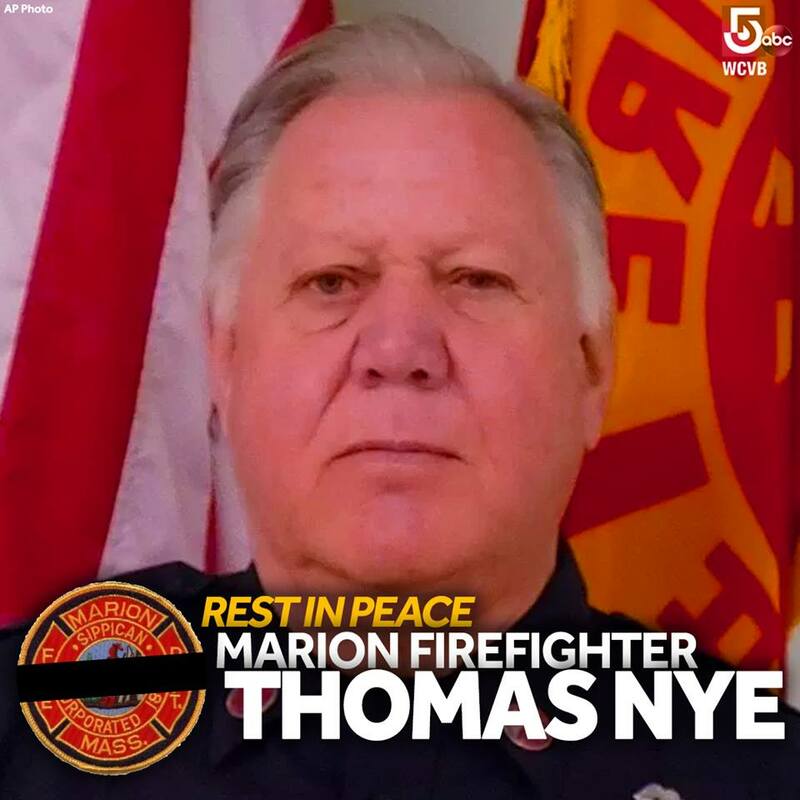 The Marion FD regrets the Line of Duty Death of longtime call Firefighter Thomas Nye, age 72, on Wednesday February 27, 2019, who served Marion FD for 45 years. He responded to a chimney fire on Feb 26, 2019 and was found unresponsive within 24 hours after at home. Attempts to revive him were not successful. FF Nye was an Army Vietnam War Veteran, member of Marion FD since Jan 1974, married 53 years, father of 2 sons, grandfather of 5, and great grandfather of 2. Rest in Peace sir! Lieutenant / Paramedic / EMS Officer Jimmy Roberts has announced his pending retirement due to his battle with a rare cancer known as "Gustav." He has served in fire and EMS for more than 32 years. Best wishes to you Jimmy in your battle and your retirement. Job well done! 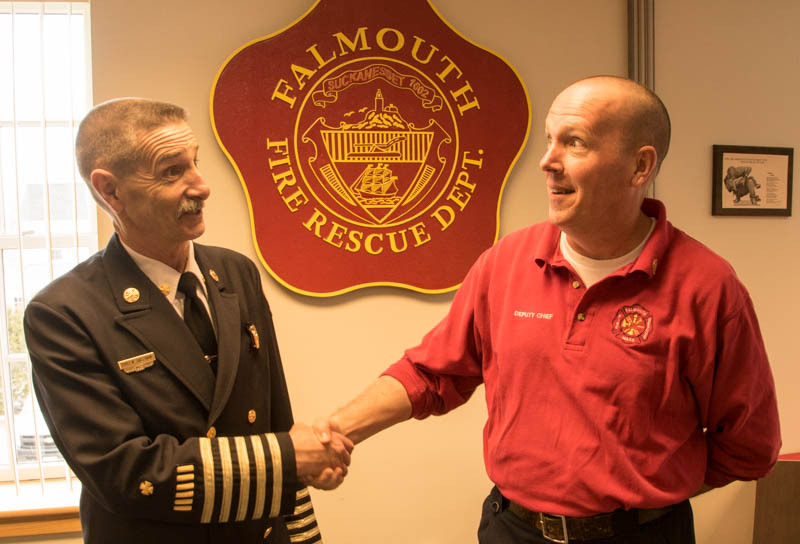 Falmouth Firefighter Paul Forsberg retired after more than 30 years of service. Congrats! 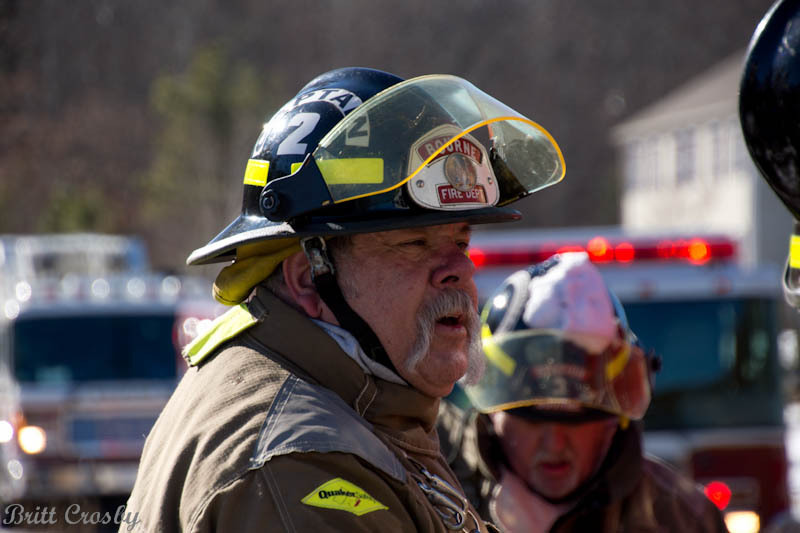 Retired Sandwich Firefighter / Paramedic Chris A. Uggerholt, Age 64, passed away on Jan 9, 2019. 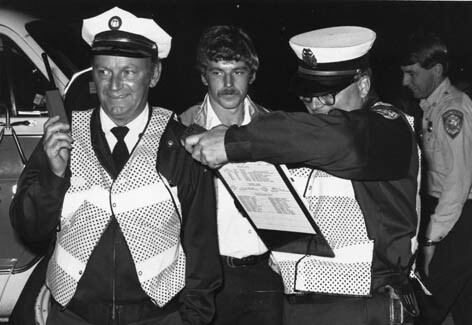 He was a fulltime member and one of the early paramedics serving in the 1970s and 1980s. 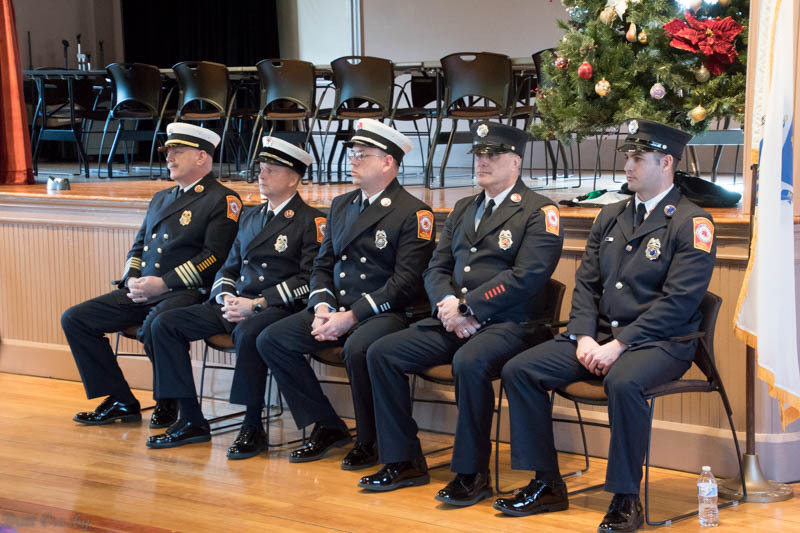 Members of the Sandwich Fire Department were officially recognized for their recent promotions in a ceremony held at Sandwich Town Hall on December 13, 2018. Left to Right. New Deputy Chief Timothy McMahon, Captain Peter Pozerski, Lieutenant Michael Harrington, Fire Prevention Officer Sean Miller, and EMS Officer Sean Gilrein. Congratulations to All! Firefighter Christopher Roy, age 36, died in the line of duty fighting a 5 Alarm fire on December 9, 2018. He was a proud member of Ladder 4 and served the department for about 2 - 1/2 years. Rest in Peace. 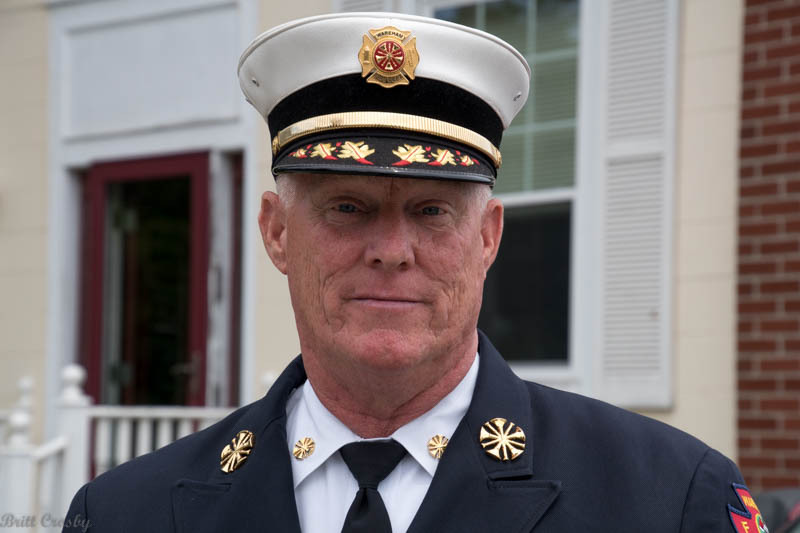 One of the most impactful Fire Chiefs in Cape Cod history passed away on Nov 27, 2018. Yarmouth Fire Chief (Ret) Dana Whittemore, age 96, served as Fire Chief for 23 years from Dec 4, 1952 to Dec 3, 1975. 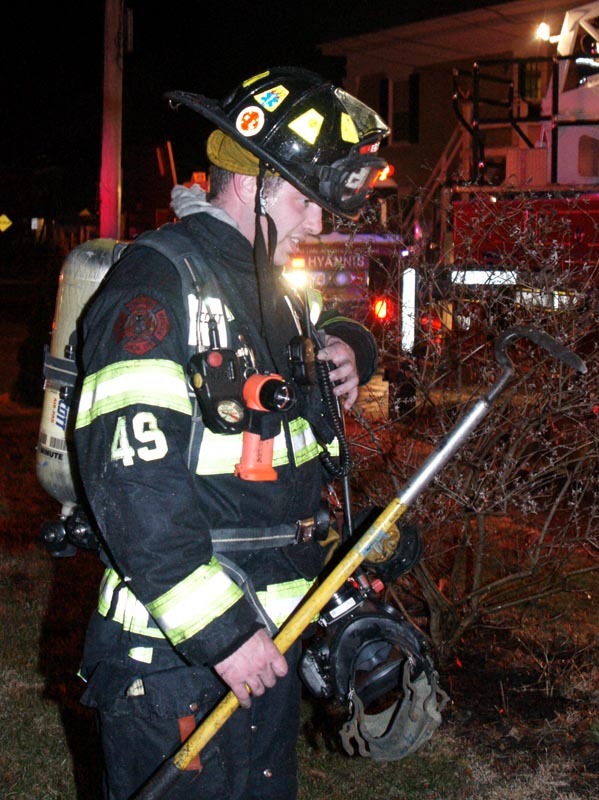 He began his service with the Dennis FD prior to joining Yarmouth FD. He was a very active player in the Cape Cod fire service history. In the early days of radio communications, mutual aid, and EMS, he had a major role in helping Cape Cod lead and develop as it did. Yarmouth FD was the original mutual aid center for Cape Cod and Chief Whittemore was very much a part of that happening. He was very active locally and statewide. 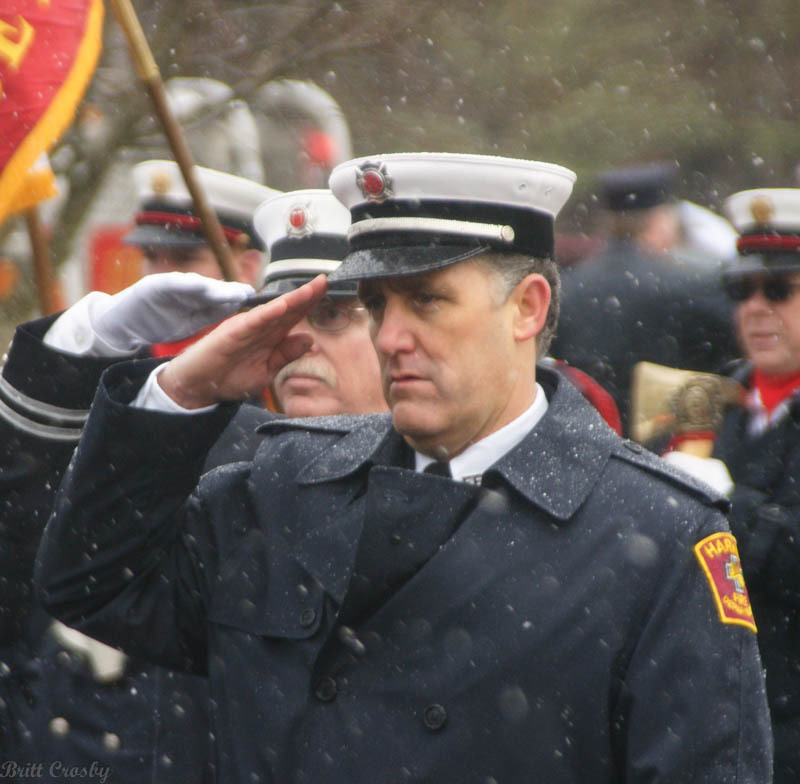 He was well respected and should always be remembered for his contributions to the Cape Cod fire service. Rest in Peace Chief. Plympton's new Fire Chief Stephen G. Silva. He begins service in Nov 2018. 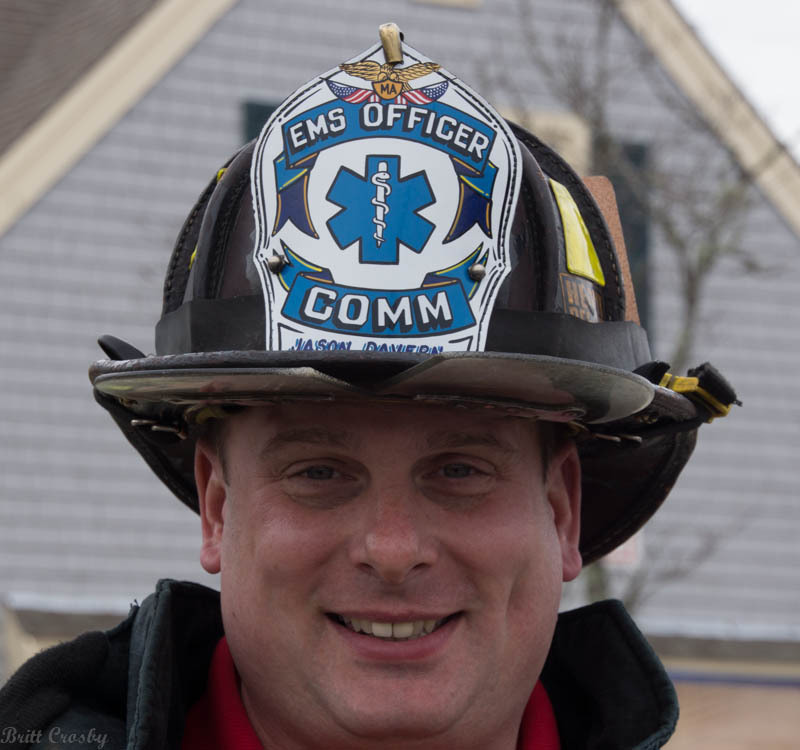 He was a member of Middleboro FD since 2002 and most recently served as Lt/Paramedic. The previous Fire Chief was Warren Borsari. 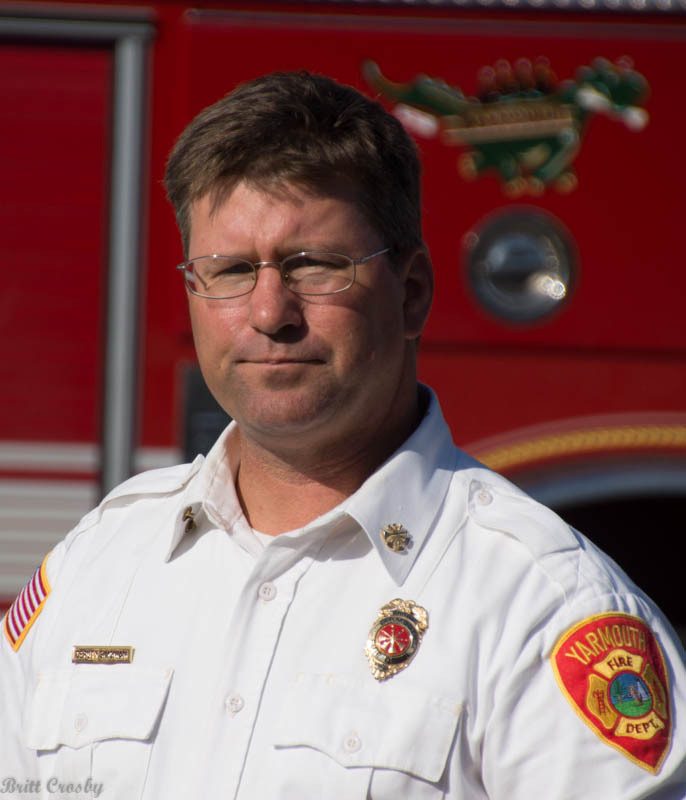 Lakeville's new Fire Chief Michael O'Brien began working in October 2018. He had previously served as a Deputy Fire Marshall in Rhode Island. Sad to report that Dr. David Elmer passed away on Oct 18, 2018. He had a rare, aggressive cancer. Dr Elmer was an OB/GYN who delivered over 20,000 babies. I had worked with him when both of us we ER Corpsman (ER Techs) at CCH (1978-1981). Rest in Peace Dave. Effective Oct 29, 2018, Capt Timothy McMahon will be promoted to Deputy Chief. He has been a member of the SFD for 35 years. Congrats! Lt Peter Pozerski will be promoted to Captain of Group 4. He has been a member of the SFD for 25 years. Congrats! FF Michael Harrington will be promoted to Lieutenant on Group 4. He has been a member of SFD for 17 years. Congrats and best wishes to all. Lt Brian Lawrence will be promoted to the Training Captain position upon the retirement of Capt Kenney. FF Paul Medeiros will be promoted to Lieutenant. Hyannis also recently promoted Lt Jeffery Huska to Capain, Peter Nagorka and Ryan Clough to Lieutenants. 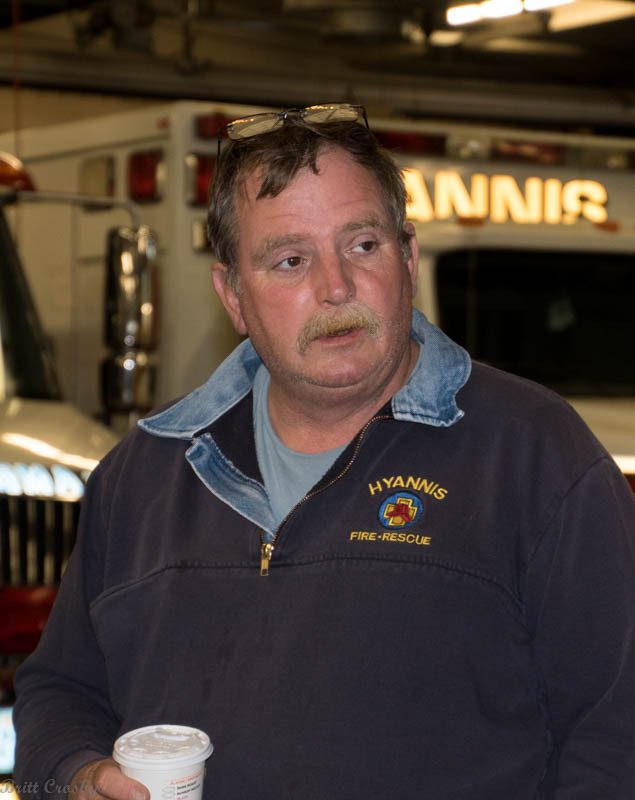 Hyannis Captain/Paramedic Thomas Kenney is retiring after more than 36 years with the department. His last day of work is Friday October 19, 2018 and all are invited to the Hyannis Fire Headquarters between 1000 - 1600 hours to share stories and wish TK well in his retirement. A retirement party has been planned for Nov 3, 2018. CONGRATULATIONS CAPTAIN KENNEY! Retired Yarmouth FD Firefighter Bill Smith passed away on Sept 25, 2018. Bill was a long time member of the YFD, charter member of IAFF L-2122 and one of the early paramedics on Cape Cod. 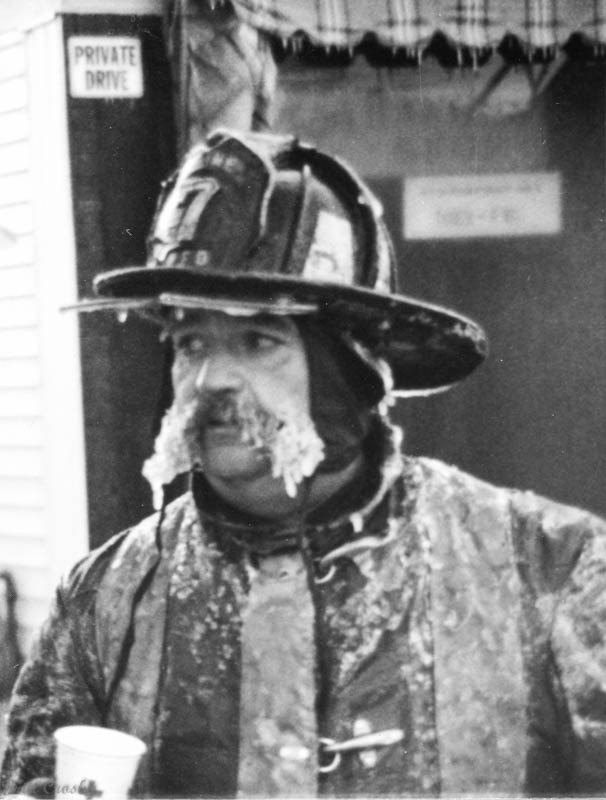 He was well known for his classic mustache, sense of humor, and commitment to the job. RIP. Lieutenant Daniel "Flippy" O'Connell is retiring in October 2018. 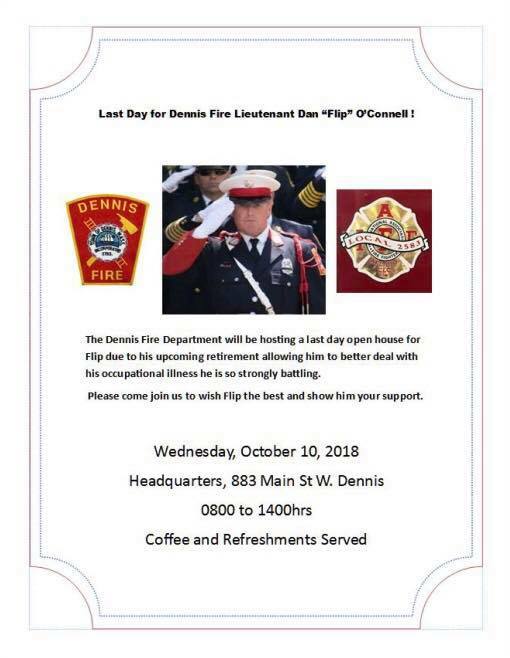 A send off will be held at the Dennis Fire Headquarters on Wednesday October 10, 2018 from 0800 to 1400 hrs. All are invited. 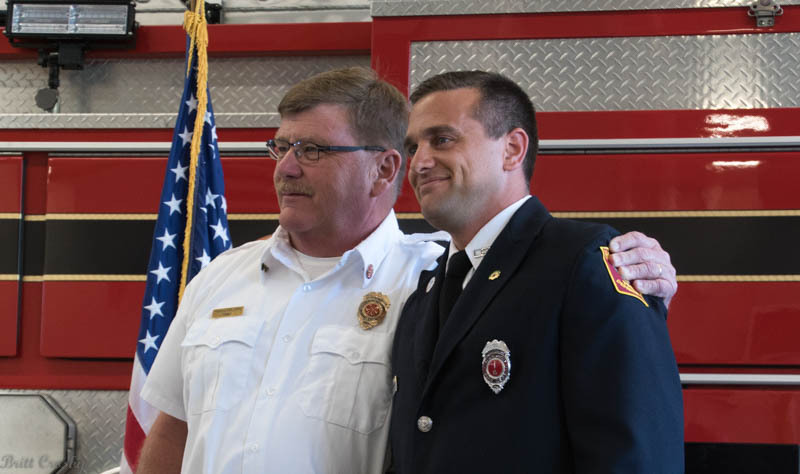 The Hyannis Fire Department has promoted Lt Jeffery Huska to Captain on "A" Shift filling the vacancy created by the recent retirement of Capt Eric Farrenkopf. Hyannis also promoted Peter Nagorka (D shift) and Ryan Clough (A Shift) to Lieutenant positions created by the retirement of Lt Kevin Black and the promotion of Lt Huska to Captain. FF Gregory Shopshire was recently promoted to Fire Prevention Officer replacing retired Capt FPO Bill Rex. A number of promotions have been made out at the base. With a several retirements and long term injury related vacancies, the following promotion have been made. Among those who were replaced by the promotions were Capt Michael Ayotte, Captain Ronald Densmore, and Capt Beaulieu (to Deputy) replacing retired Deputy Paul Bethany, as well as Lt Kevin St John and Lt Brett Childs. Kingston recently (June 2018) promoted Captain Adam Hatch to Deputy Fire Chief. 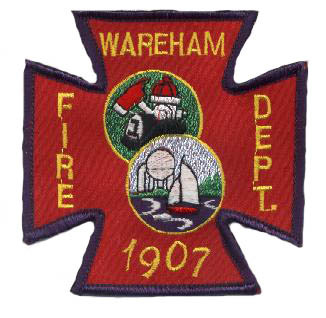 Wareham FD has promoted Captain Collin Kelley to fill the vacancy created by the selection of Capt Matt Rowley to be Wareham's Fire Chief in June. Several changes have taken place in West Barnstable recently. Lt Keith Stranger resigned in 2018 to take a position with the Barnstable Fire Dept. Lt Edward "Muffy" Clough is retiring after many years with WBFD. Congrats & Best Wishes to all. Retired Hyannis Lieutenant/Paramedic Richard A. Knowlton, age 59, passed away August 4, 2018. Services were held on August 9 & 10, 2018. Rest in Peace LT.
Mashpee FD recently updated their uniform patch as well. 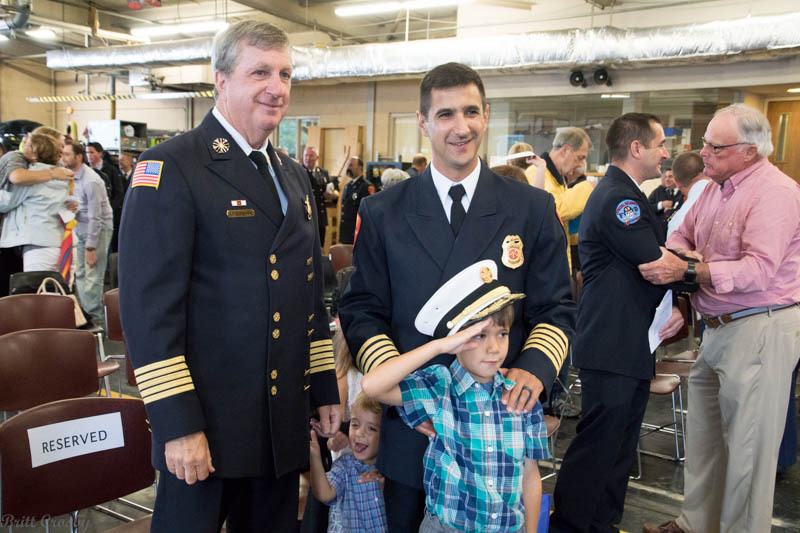 Lakeville's long time Fire Chief Daniel Hopkins retired on July 31, 2018. He had 38 years of service with the Lakeville Fire Department. He was Fire Chief for the past 22 years (Jan 1996). He had joined the department in 1980 as a call firefighter, became a fulltime firefighter in 1984, and Deputy in 1995. Congratulations on a full career. 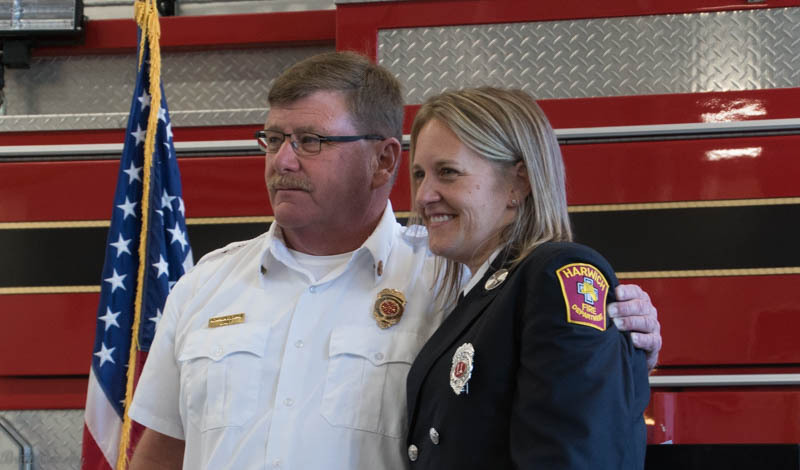 Harwich Fire Department promoted Lt. Leighanne Smith to Captain of Group 2 / Engine 65 on July 20, 2018. She is a paramedic and 18 year member of the department. Firefighter/paramedic Justin White was promoted to Lieutenant of Group 4 / Engine 64. Congratulations! Harwich Captain John Clarke has retired after 36 years of service with Harwich FD. He was Captain of Group 2 and Engine 65 for some 18 years. 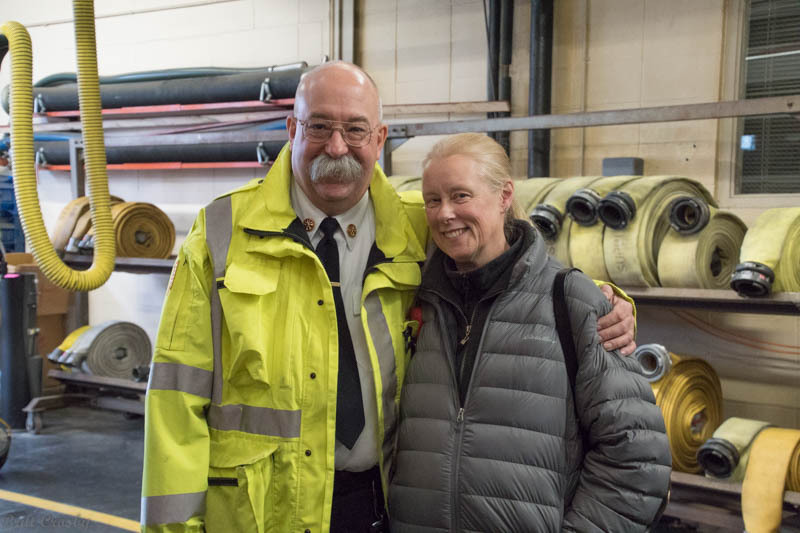 Jennifer Barth Pasic retired from the Cotuit Fire Department call department in March 2018 after 35 years of service. She started in July 1983. Congratulations Jen for your dedicated service to the village of Cotuit. 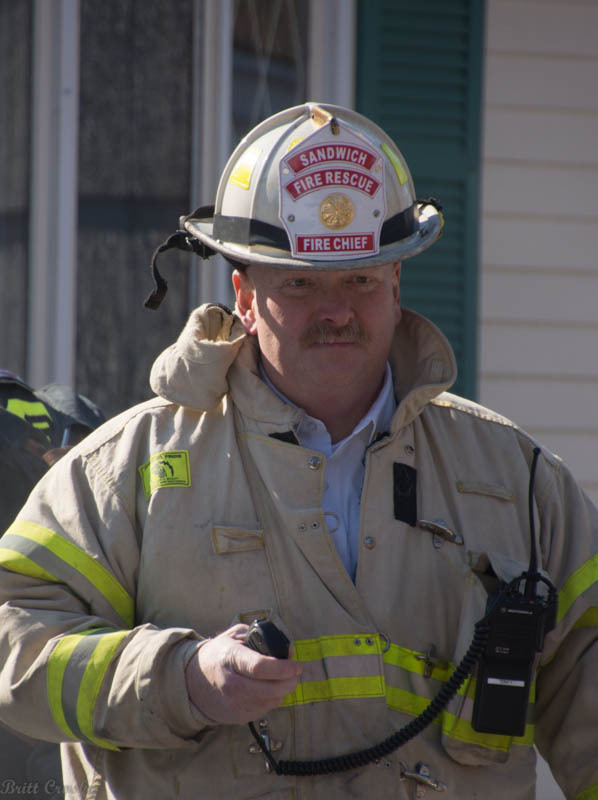 Sandwich has selected Deputy John "J.J." Burke as the new Fire Chief of the Sandwich FD as of July 12, 2018. 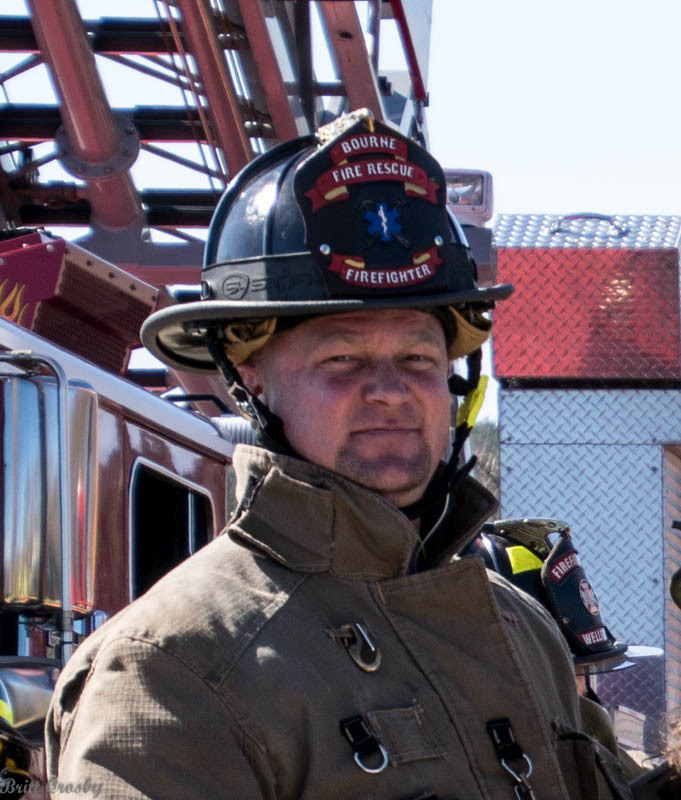 Chief Burke joined the Sandwich FD as a dispatcher in 1995, became a firefighter in 1998, and served as the Fire Prevention officer for 9 years prior to being appointed as Deputy Chief in 2014. 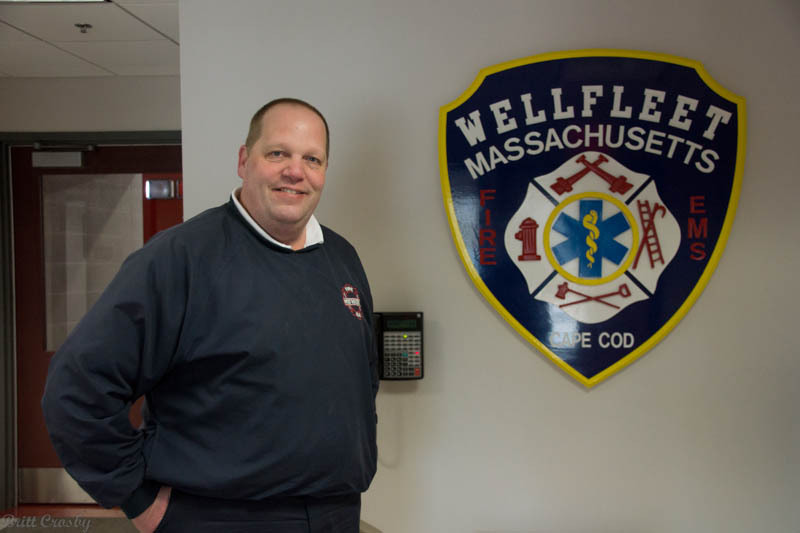 He has been serving as Interim Chief since Chief William Carrico left in May 2018 to become chief in Medfield. Congratulations Chief! Captain Eric Farrenkopf will retire July 24, 2018 after serving with the Hyannis Fire Department since 1972. 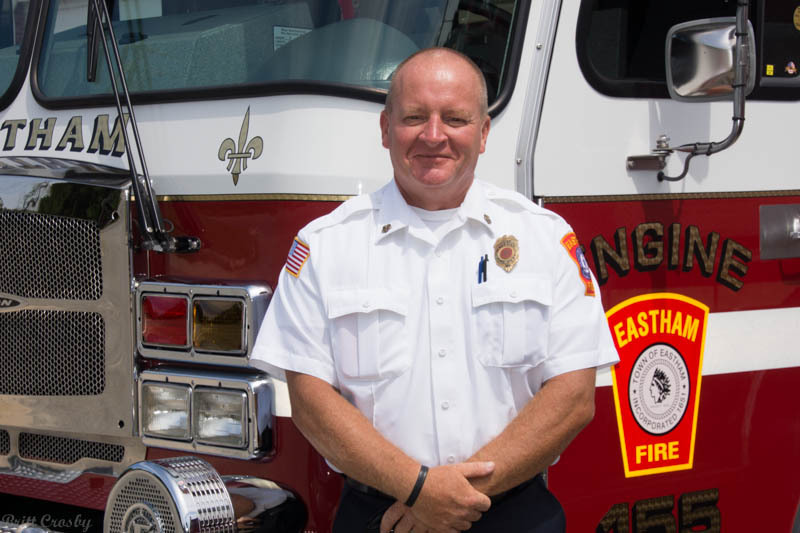 Captain "E" is one of several brothers who have served fire departments across the Cape for decades. Brother Rick was a Dennis Captain, brother Craig a Hyannis Captain, and brother Kent the present Eastham Fire Chief. Father Richard Farrenkopf was an officer in the Hyannis FD retiring after many years as Fire Chief. Best wishes to Captain "E" as he enjoys retirement. Lieutenant Kevin Black will be retiring in August 2018 after many years of service. 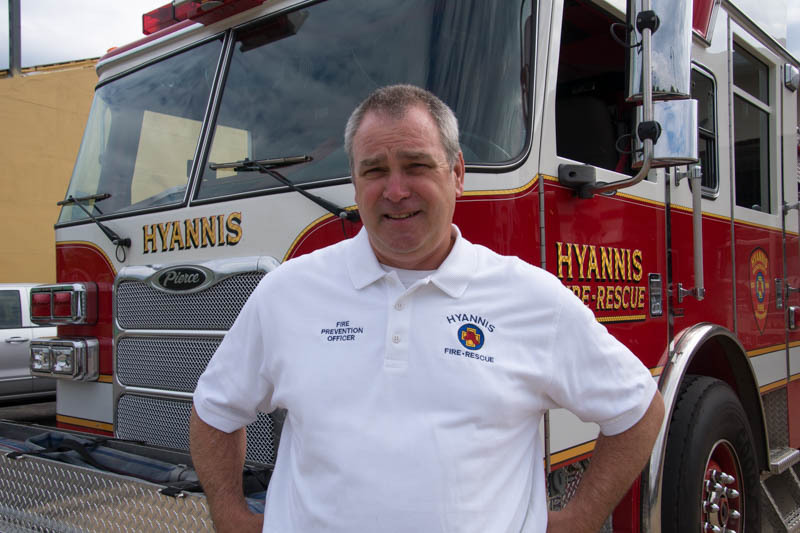 Captain/Fire Inspector James Armstrong retired in July 2018 after many years of service to Yarmouth FD. Congratulations! Lieutenant Scott Smith has been promoted to the Fire Inspector position. 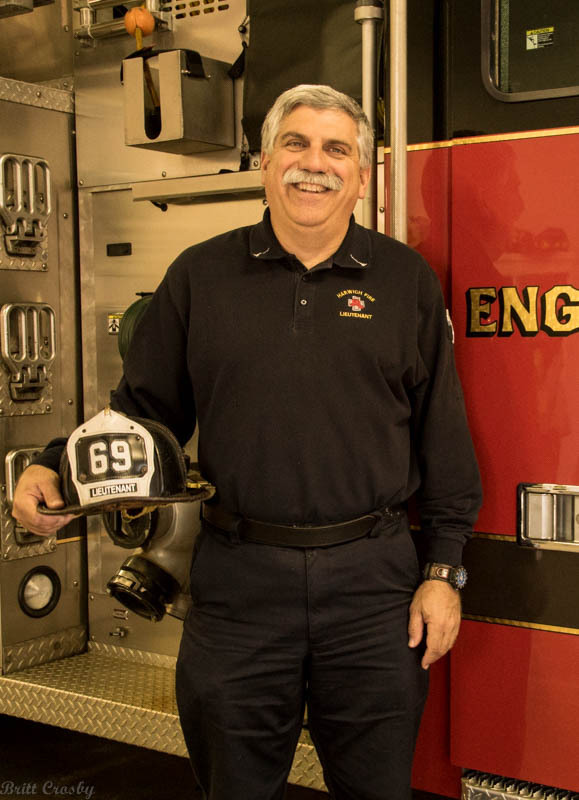 Harwich Fire Captain John Clark is retiring after 36 years on the fire department, 33 fulltime. There will be a sendoff on July 19, 2018 at Harwich HQ from 0800-1200. 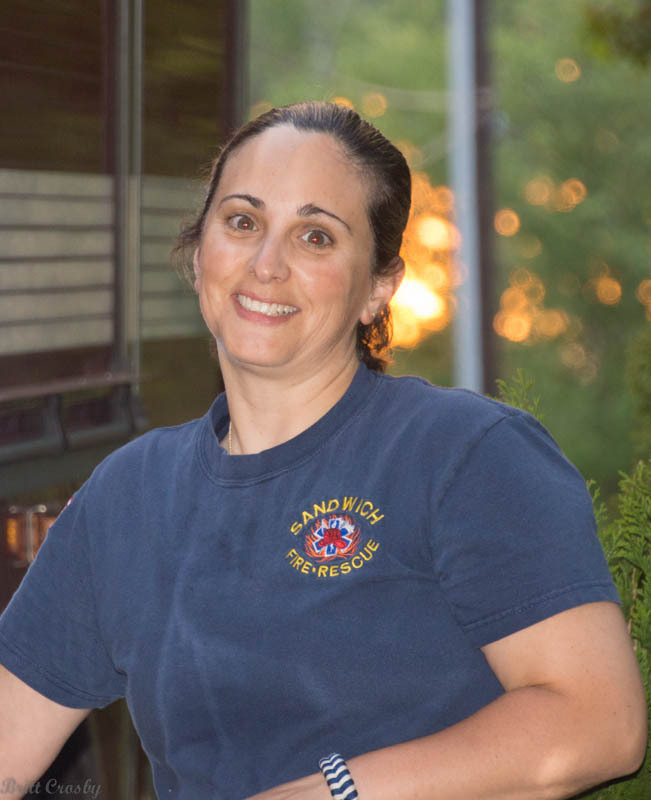 The Harwich FD will promote Lieutenant/Paramedic Leighanne M. Smith to Captain of Group 2 replacing Capt Clark. She is an 18 year member of the department. The swearing in ceremony will be held on July 20, 2018 at 0800 hrs at Harwich HQ. Firefighter Justin White, a 7 year member, will be promoted to Lieutenant on Group 4. Firefighter Eric Elliot will be appointed as designated Officer in Charge - OIC - on Group 4. Hyannis Fire Dispatching officially transferred over to Barnstable Police communications center on June 28, 2018. 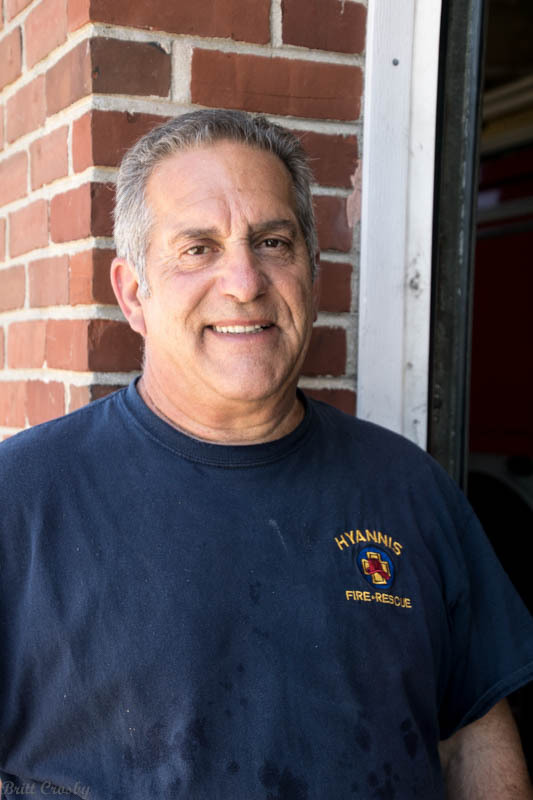 Long time Hyannis FD Station Maintenance man David Medeiros is retiring after 29 years of service. Congratulations and best wishes. Retired Captain John "Jack" Grant has passed away June 24, 2018. He worked a long career with the Hyannis FD including a brief time as acting Deputy. The new Fire Station was dedicated on June 23, 2018. Retired Deputy Fire Chief Stuart B. Small, age 85, passed away on June 23, 2018. 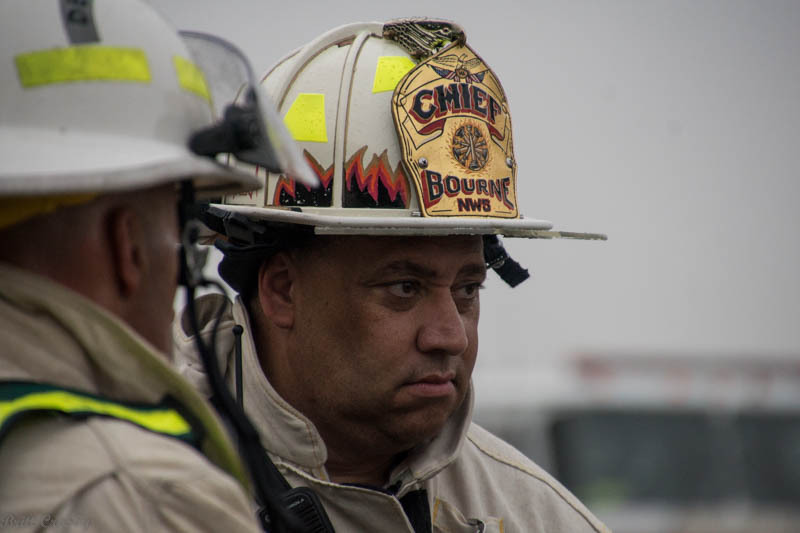 He had served as a member of the Bourne FD for many years, retiring as Deputy Chief. He is the father of Falmouth FD Chief Michael Small. Wareham Fire District has appointed Captain Matt Rowley to be the next Fire Chief on June 21, 2018. He will fill the position created when long time Fire Chief Robert McDuffy retired in 2017. Congratulations! 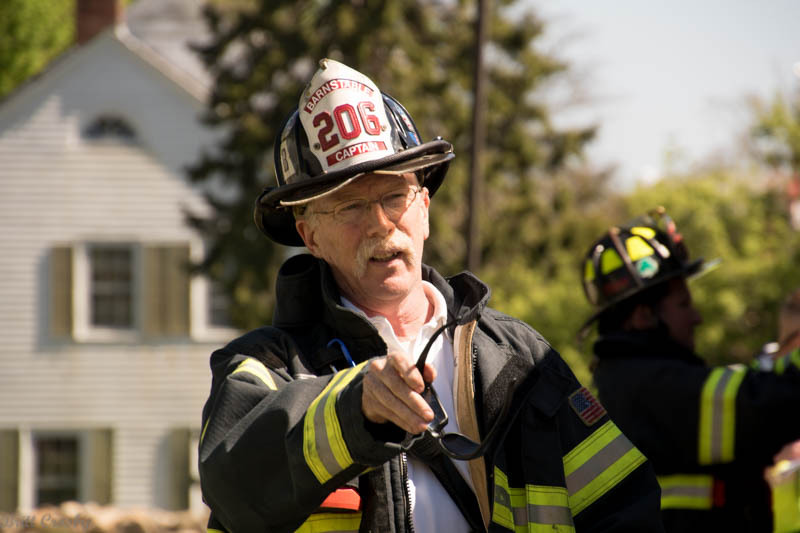 Retired Bourne Call Captain Robert "Bob" R. Ronayne, age 64, passed away after a battle with cancer on June 17, 2018. 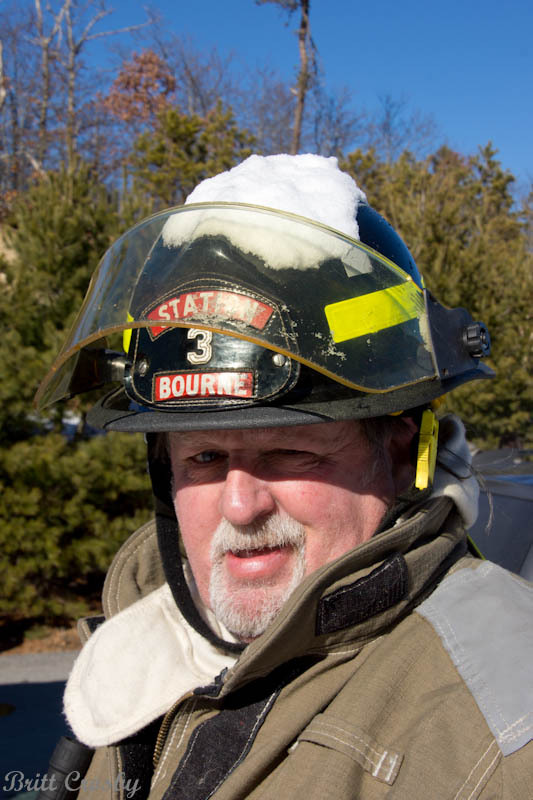 He was a long time member of the Bourne FD and had served many years as a Falmouth Police Officer. 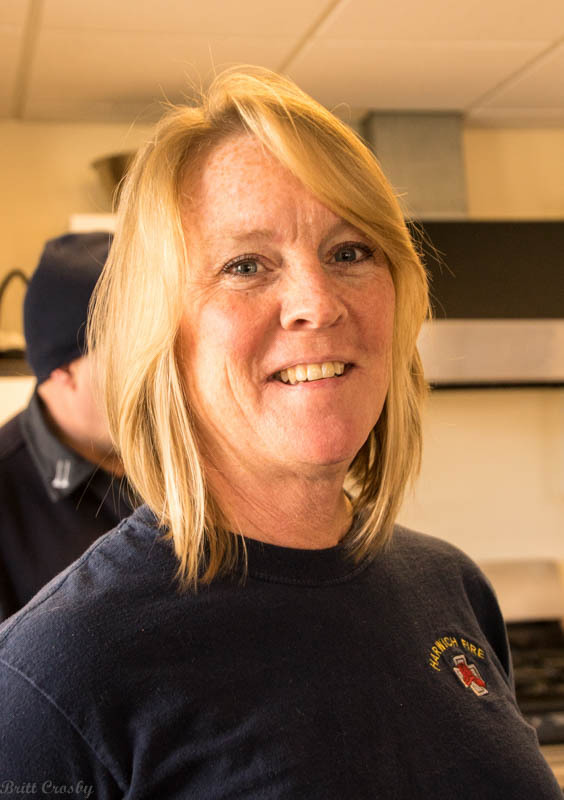 Barnstable Firefighter/Paramedic Donna Rex is retiring after 32 years of service. Friends are invited to her send off on her last day of work June 21, 2018 from 0900-1200 at the Barnstable station. 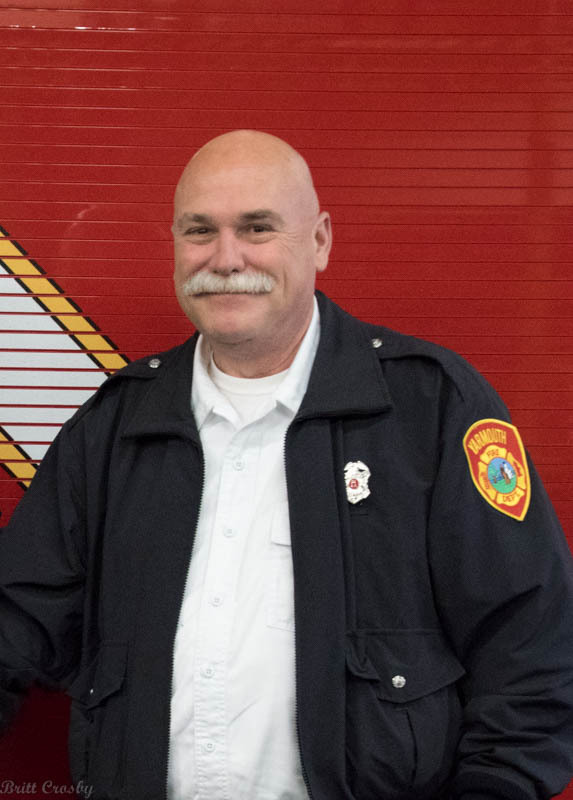 Her other half, Captain / FPO Bill Rex of the Hyannis Fire Department is also retiring this summer after many years of service. Congratulations to both! Sr Pvt Kevin Laurie is retiring May 23, 2018 after nearly 38 years of service. Congratulations! Firefighter/Paramedic Nick Lawler, with 21 yrs experience, will be promoted to Sr. Pvt on Group 4. 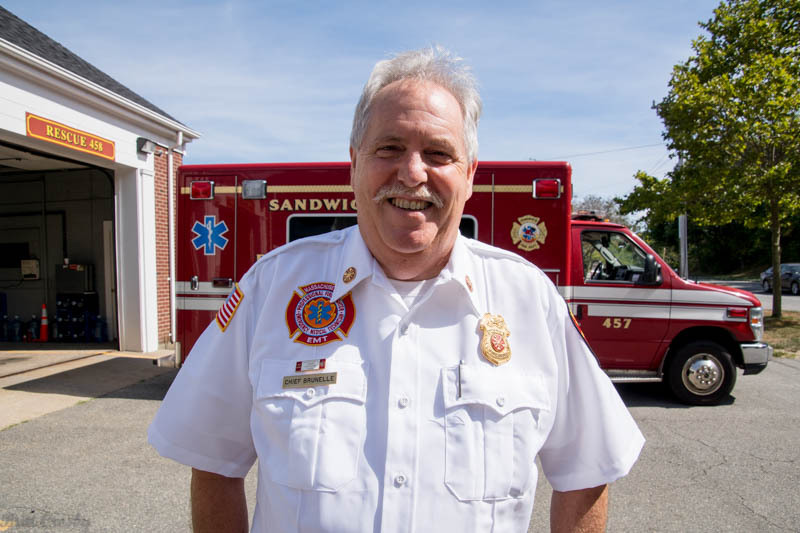 Fire Chief William C. Carrico II has announced he will be leaving Sandwich May 4, 2018 to take the Medfield, MA Fire Chief position. Carrico has been Chief in Sandwich since 2014. 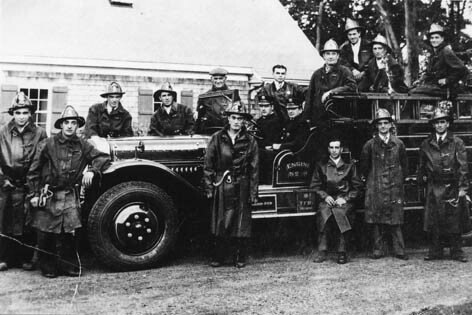 During that time he successfully saw the funding and plans to renovate and staff the East Sandwich; replace the Forestdale station with a new sub station; hire over a dozen new personnel; improvements of several vehicles including a new engine-tanker and brush breaker; and move of fire dispatch to town-wide public safety dispatch center at police station. Chief Carrico previously served as Chief in Halifax and Deputy in Duxbury. Best wishes in his next assignment. The Kingston Fire Department promoted Deputy Mark Douglass to Fire Chief. He had been serving as the "acting Chief" since last year with the departure of previous chief Robert Heath who left in 2017. Douglass has been a Kingston FD member since 1983 and previously served as the Deputy since 2006. A new deputy has not yet been named. 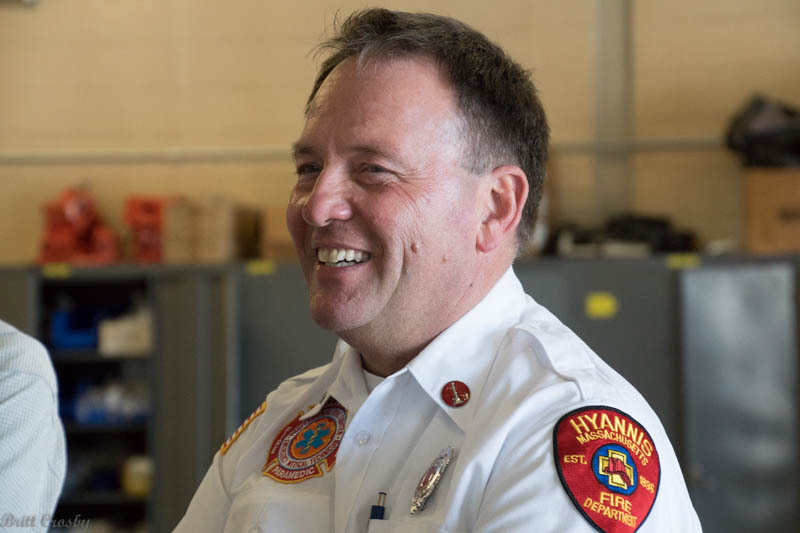 It was appears to be some turmoil in Plympton, selectmen decided to not renew the contract of long time Fire Chief Warren Borsari, chief since 2011. 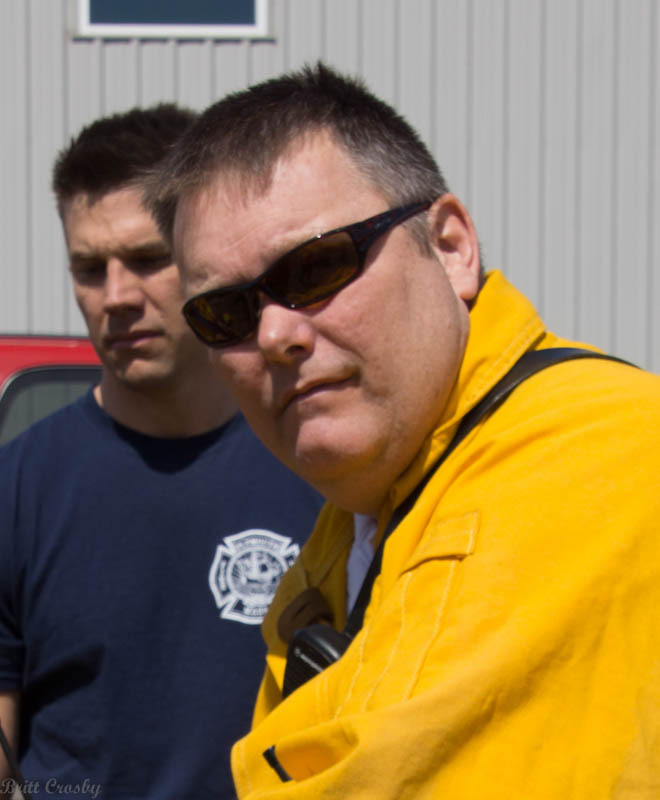 Captain Jeff Sturdevent has taken the Fire Prevention Office position. Lt. Brett Childs has retired after many years at the base. Long time Lieutenant-Paramedic James Gardner recently retired from COMM FD after 30+ years of service. Plymouth FD is planning a new Station 7 in North Plymouth. 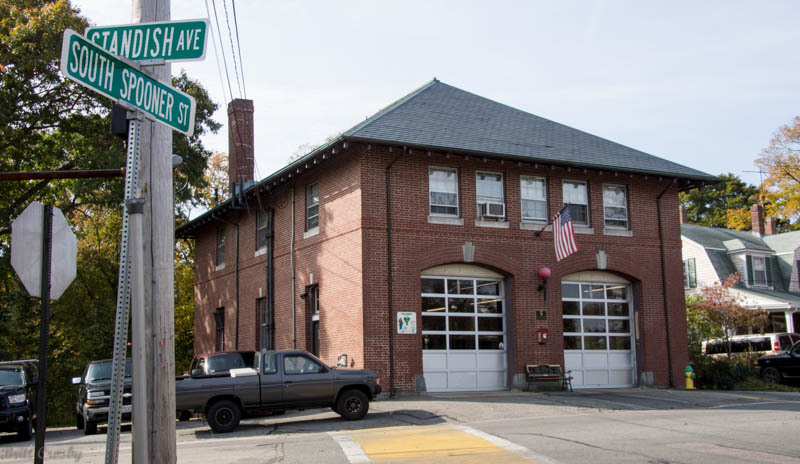 The new station would replace the 107 year old Station 7 on Spooner Street with a new station just down the street at 15 Hedge Road. 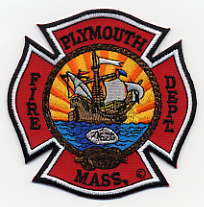 Plymouth is also planning a 3rd Ladder truck. 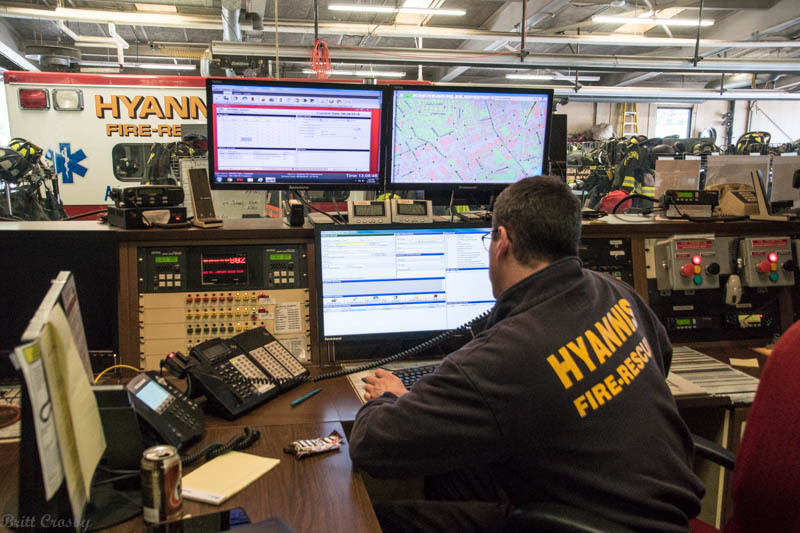 The Hyannis Fire Department is planning to turn over its dispatching responsibilities to the new civilian dispatchers at the Barnstable Police Department sometime in spring 2018. Hyannis has also implemented a significant change in their apparatus radio designations. Deputy Patrick Haskell is serving as the Acting Fire Chief following the retirement in 2017 of Fire Chief Robert McDuffy. The first "civilian" Fire Commissioner (The Commish) of the COMM FD, Jeffery A. Chase, age 66, passed away on Feb 7, 2018. 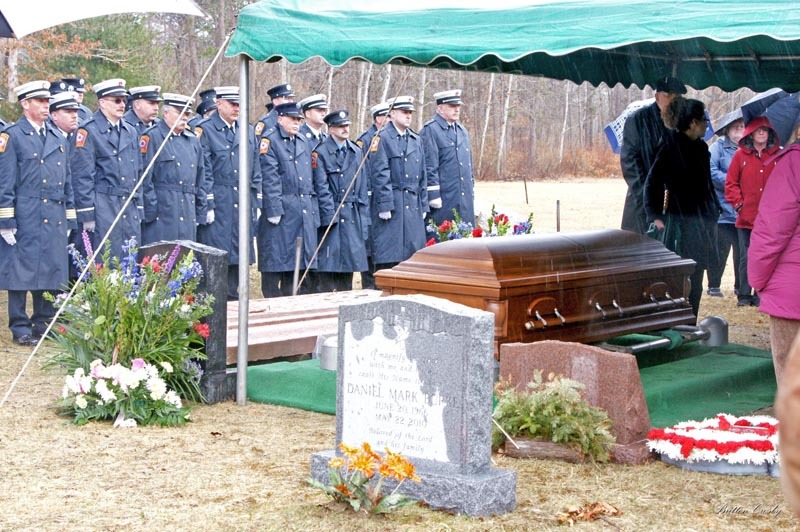 He served as a Barnstable Police officer for 27 years and as a Fire Commissioner for 15 years. He was a good friend and will be missed. Rest in Peace Commish! Retired Call Firefighter Alan Hadfield, age 77, passed away on Feb 1, 2018. He was one of the early Marstons Mills guys and served for many years. Retired Firefighter/EMT Felix Nunez, age 62, passed away on jan 31, 2018. he served with FALFD from 1985 to 2001. 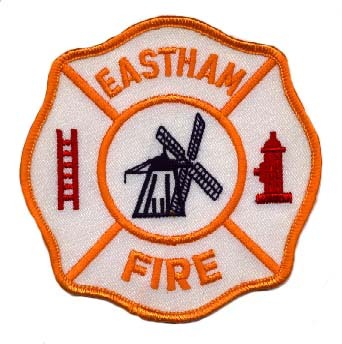 Eastham FD received a SAFER grant for 4 additional personnel and will be going to a 5 person / Shift staffing level (with 4 person minimum) in January 2018. 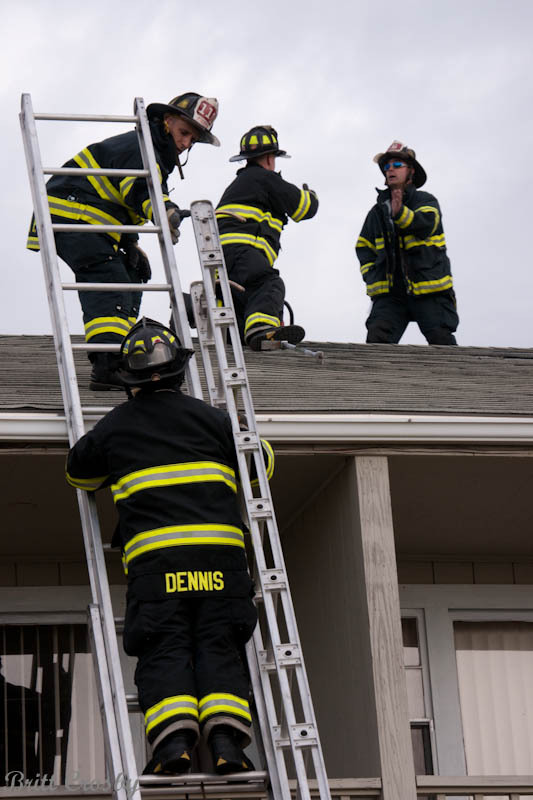 The Dennis FD received a $1.3M SAFER grant to add 8 additional personnel bringing staffing levels up to 12 personnel per shift with a 10 personnel minimum in 2018. Staffing will be 7 at Station 1 and 5 at Station 2, with a minimum of 5 at Station 1 and 5 at Station 2 once in place. Wellfleet Captain/Paramedic Thomas Ferreira retired on Dec 29, 2017 after 40 years of service to the Town of Wellfleet. He became a paramedic with CIEMSS Class 6 in 1981. Best wishes in your retirement Capt! Congratulations to Yarmouth Firefighter Patrick Sullivan who is retiring from the YFD after 35 years of service. FF Sullivan, known to many, worked at the CCH ER for many years as well as originally serving with the COMM FD before his service in Yarmouth. Best wishes Patrick in your retirement! Sandwich regrets the passing of retired Lt. Peter Beauchemin on December 16, 2017, age 76. 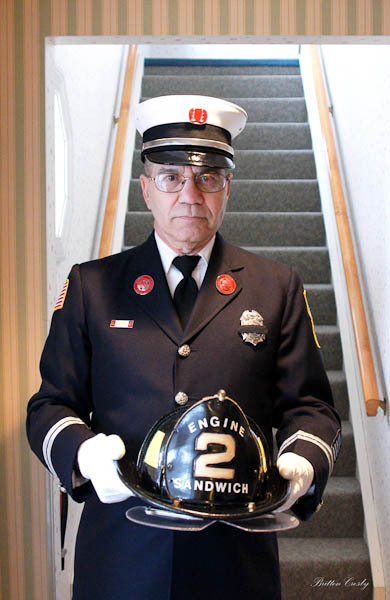 He served with the Sandwich Fire Department for 32 years. He was a Marine and most recently served on the Board of Selectmen. Captain / Paramedic Matt Flynn (Group 4) will be retiring from the Chatham FD on January 1, 2018. Capt Flynn has been a member of the Chatham FD for many years. Best wishes in your retirement! Deputy Chief Paul Bethoney has retired after 39 years of service. Congratulations! Joint Base Cape Cod has named Captain Todd Beaulieu to become the next Deputy Chief. Mashpee Fire recently promoted Lt Michael Evaul to Fire prevention Officer. and FF Shawn Willis to Lieutenant on Group 4. Congrats to all! Hyannis recently promoted Lt. Tim Lanman III to Fire Prevention Officer. FF David Webb has been promoted to Lieutenant. FF/Paramedic Donald Holigan has retired after many years of service. Congrats to all! Edgartown has announced to appointment of Alexander Schaeffer to be the new fire chief with the pending retirement of long time chief Peter Shemeth. Congratulations. Retired Hyannis Fire Chief, Paul David Chisholm, age 80, passed away on October 26, 2017. 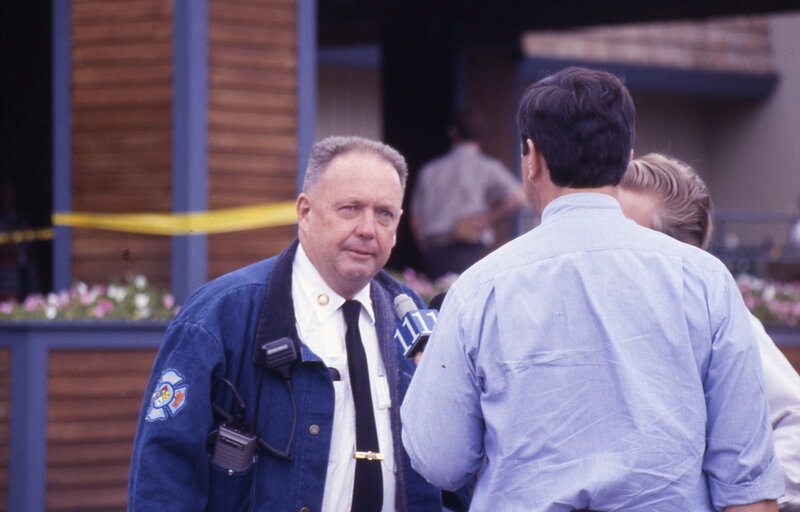 He served as Chief in Hyannis from 1988 to 1997. OBITUARY. Rest in Peace. An old friend and member of the Centerville roster passed away on Oct 4, 2017. Frank Gilchrist, age 96, served as a call member for more than 20 years. Rest in Peace Frank. Lt Ross Klun is leaving the Barnstable Sheriff's Dept. after 23 years serving Cape Cod. Ross served as a dispatcher, a Sergeant in the radio room, and a Lieutenant for the Communications Division in recent years. He has taken a position at the Nashoba Valley Regional Public Safety Communications center in Devens, MA. Congrats and best wishes. The Mashpee Fire Department has promoted Lt Michael Evaul to Fire Inspector. Mashpee also promoted Lt Sean Willis and Lt John Gannon. Congrats to all! Falmouth Fire Department recently promoted Ryan P. Gavin to Captain, replacing Captain Greg Clements who passed away in July 2017. FFD also promoted Allen Rivera to Fire Prevention Officer with the retirement of long time FPO Mike Metell. Congrats to all! The Sandwich Fire Department has implemented a rather significant change in their dispatching. As of Sept 22, 2017 a number of apparatus are being referred to by other than their "county" based radio numbers as has been the case since the late 1990's. Essentially the Engines will now be referred to as Engine 1, 2, and 3 (corresponding to E451, E452, and E453). Tower 450 will now be called Tower 1. The ambulances will be referred to as Ambulance 1, 2, 3 and 4. It appears that the Ambulance designation will be tied more to the station assignment (at the time) than the county number of the ambulances (A456, A457, A458 and A459). With the anticipated opening of the East Sandwich Station 2 in December 2017 (approximately) an ambulance would be assigned to each station and A4 would serve as a "reserve" unit. Other apparatus, such as the brush breakers and tankers will continue to be referred to by their county numbers (B461, T464, etc). Some cars will be reassigned, Chief C-1 (441), Deputy C-2 (442), while others may continue to use their county numbers (C440, C467, etc). The Duty Officer, when in C-460, will now utilize numbers assigned to officers with Captains by Seniority (C-3, C-4, C-5, and C-6) not corresponding to shifts, and numbers assigned to Lieutenants based on shift assignments (L-1, L-11, L-2, L-12, etc...) The EMS Officer will become C-8 and Fire Prevention will become C-9. A system of "retiring" various portable numbers or officer numbers assigned to various personnel will also be used as retirements or promotions occur. Confused?? The new listing will be posted on the Sandwich Roster page. Congratulations to FF/Paramedic Sean Miller who has been promoted to Fire Prevention Officer with the recent retirement of FPO Donald Campbell. Also congrats to FF/Paramedic Sean Gilrein who will take over the EMS Officer position as EMS Brian Leary has been promoted to Lieutenant on Group 4. 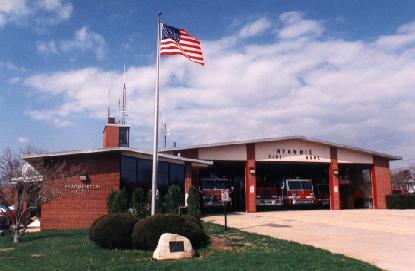 The Joint Base Fire Department has added a STATION TONE in the dispatching of calls. Their dispatch will pre-announce a call, follow it with the Station Tone and a specific Alert tone signifying either a medical response or a fire response. You may have noticed that COMM has changed some of their dispatching procedures, specifically reducing the number of times an "alert" tone is used on their talk-group for the initial dispatch of calls. Medical calls are typically not dispatched with the wobble (turkey) tone as has been done for many, many years. Primary alerting of personnel is still conducted on 154.355 which in primarily an in house paging and alerting channel. Ambulances then sign on on the department's talk group and are acknowledged by dispatch. A straight alert tone is still mostly used for fire related incidents. This has been in place since early in the winter of 2017. Call Lieutenant Ron Deschamps will retire on Sept 30, 2017 after 41 years of dedicated service. Hyannis Fire Prevention Lieutenant John Cosmo retired on Sept 21, 2017 after some 30 years of service. Congratulations! 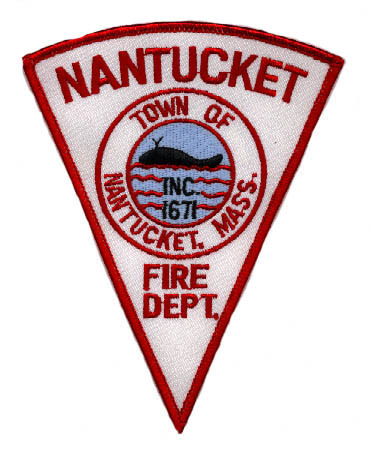 The Nantucket Fire Department is expected to have a new Fire Chief soon. Deputy Chief Stephen Murphy, who has been serving as interim chief, is expected to be named Chief of the Department during the week of September 11-15, 2017. 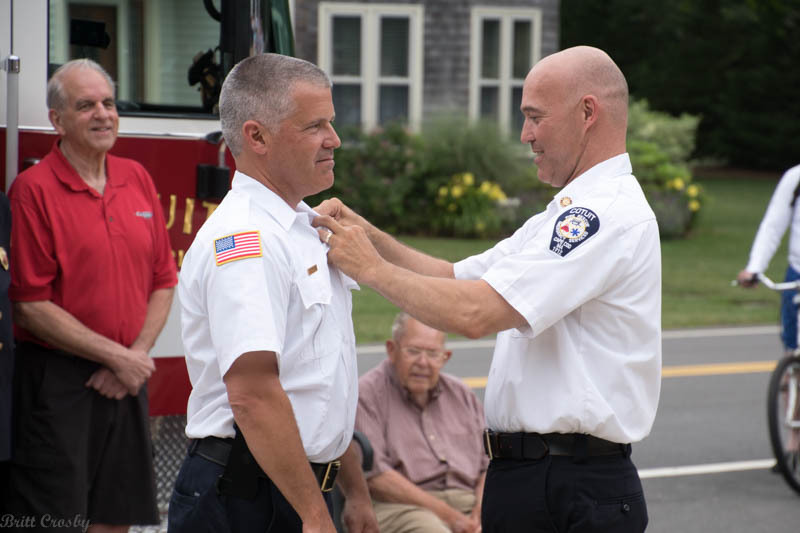 He has been a member of the department for many years and will be filling the position vacated when Chief Paul Rhude took the Chief's job in Cotuit this summer. Congratulations! Wareham Fire Chief Robert McDuffy Retired September 8, 2017. 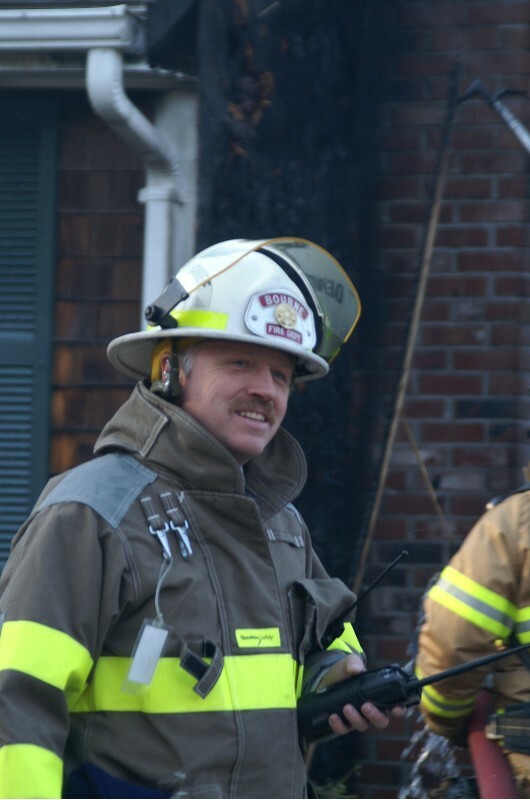 Chief McDuffy joined the Wareham FD as a Jr Call Firefighter in 1981 and worked his way up to a career firefighter. He served as a Lt/Fire Inspector, 1st Asst Chief, Assistant Chief, Acting Chief, and then Fire Chief for the past 18 years or so. 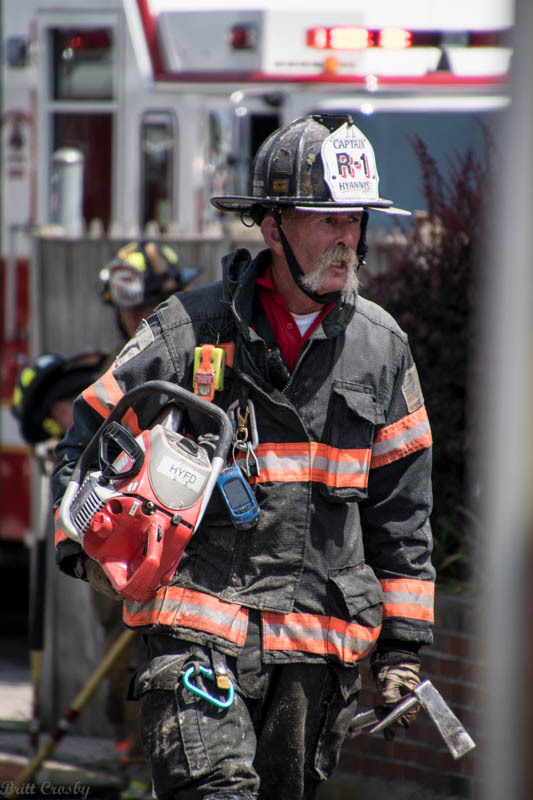 His 36 years of service with Wareham saw many changes and improvements in equipment and service as the department has transitioned from the primarily call department to a more career department. Best wishes Chief! 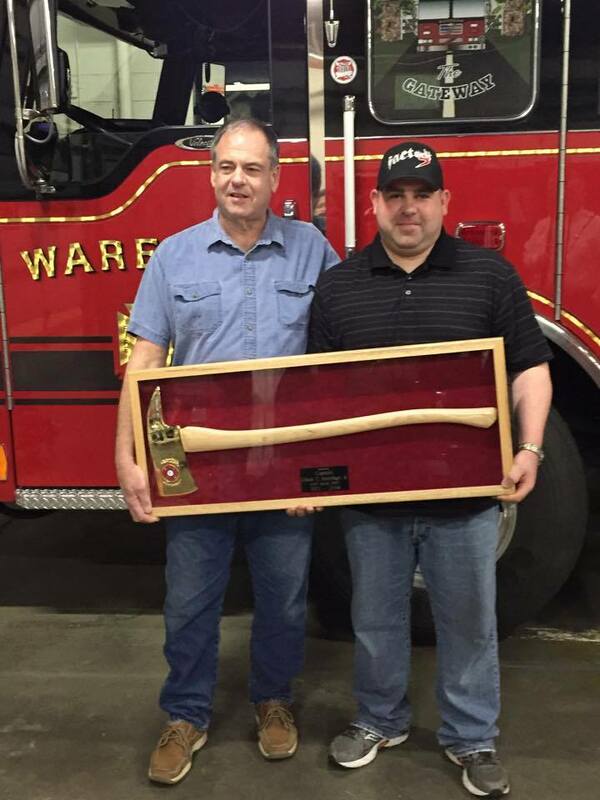 In addition, the Wareham Fire Department Officer Manager Skippy Wilcox also retired after 30 years of service to the District. Congrats! Congratulations to Captain Scott Ames upon his retirement after nearly 40 years on the Sandwich FD. The Sandwich Fire Department has announced that the department has received a SAFER Grant to hire an additional 8 firefighters in order to open East Sandwich Fire Station 2 by Christmas 2017. With the upcoming retirement of Captain Scott Ames, the department has announced the pending promotion of Lt Sean Butler to Captain. The following will be promoted to Lieutenants: FF Rory Black, FF Daniel Brun, FF Brian Leary, FF Larry Machado, FF Joshua Glazier, and FF Jon Houde. Congratulations to all. 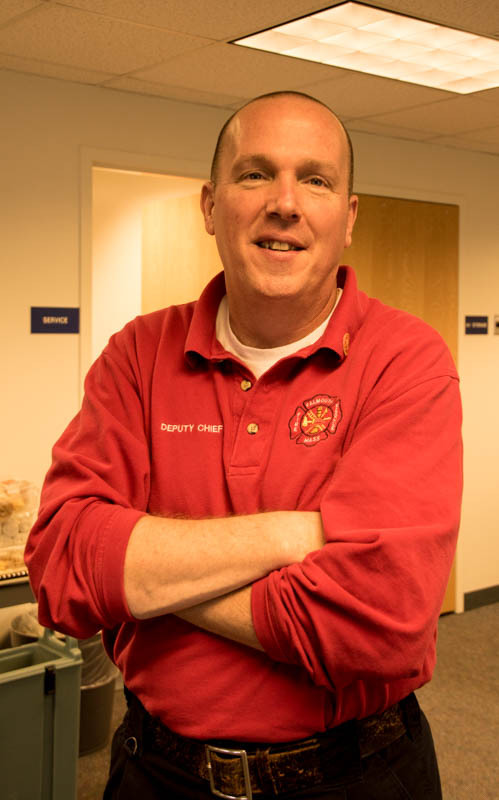 The Eastham Fire Department has announced the hiring of Dan Keane to become the new Deputy Fire Chief. 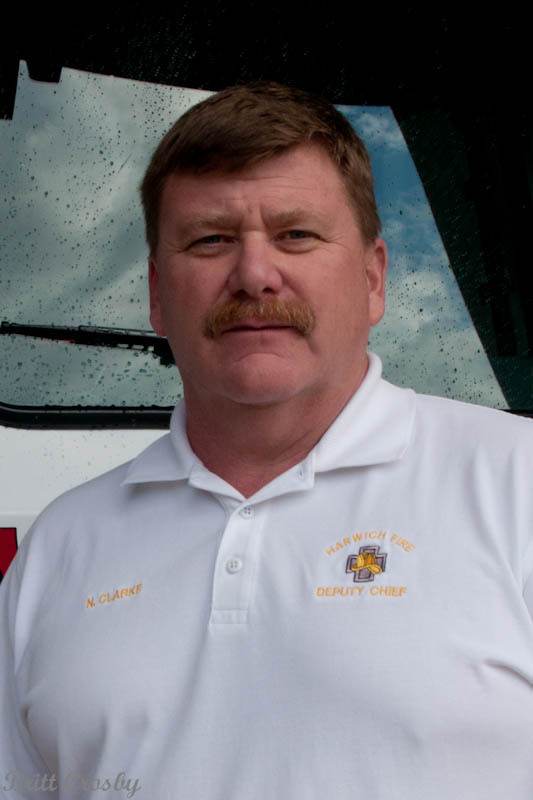 Keane has been a member of the Sandwich FD for 16 years serving as FF/Paramedic, Lieutenant, and in Fire Prevention. He fills a vacancy at Eastham that has been unfilled for several years. Congratulations! Chatham Fire Department has promoted FF Ryan Clarke to Lieutenant. Congratulations! 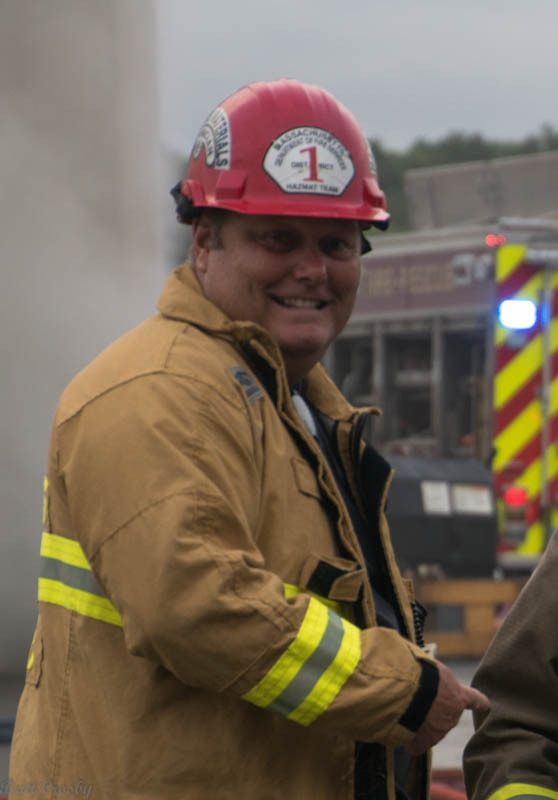 The Falmouth Fire Department regrets to announce the sudden passing of Captain Greg Clements on Sunday July 30, 2017 at age 54. 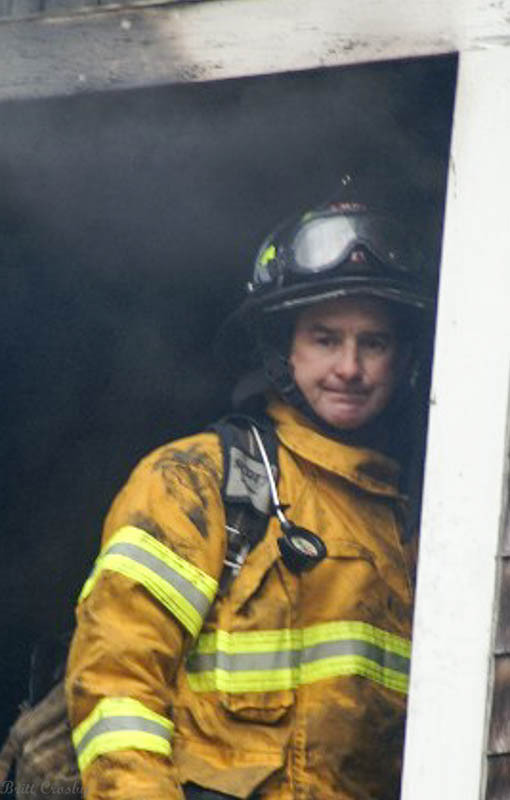 He joined the Falmouth FD as a call firefighter at Station 4 and became a fulltime firefighter in 1986. He served as a dive team member and boat operator. Capt Clements was promoted to Captain in 2011 and was currently the senior Captain at FFD. He was a member of Falmouth FD for 31 years. His Line of Duty Death is attributed to complications from a medical incident suffered in December 2016. Visiting hours will be Saturday August 5, 2017 from 0900-1100 hours at Chapman Cole & Gleason at 475 Main St, Falmouth. A service will follow at 1100 hours. Internment will follow at the St Joseph Cemetery on Gifford Street. Harwich Lieutenant / Paramedic Timothy Jaques has retired after 33 years of service with Harwich FD. He also served with the COMM FD prior as a call firefighter. Congratulations! Harwich promoted firefighter Ryan Edwards to Lieutenant. Congratulations! The 11th Fire Chief of the Hyannis Fire Department was given the oath of office on Monday July 24, 2017 at the Hyannis Fire Station. Retired Fire Chief Harold Brunelle (left) was among many who attended the Assumption of Command Ceremony. Congratulation to Chief Burke! The Barnstable Fire Department as appointed Captain Richard Pfautz to the position of Acting Deputy Chief. This fills the position created when Deputy Burke went to Hyannis FD. Pfautz previously served as Acting Fire Chief prior to Burke's coming to Hyannis. Congrats! A number of fire chiefs, past and present, as well as department members, friends, and families turned out at the Cotuit Fire Station on the morning of July 1, 2017 as retiring Fire Chief Christopher Olsen said his goodbyes after 9 years as chief and officially pinned the chief's badge on new Fire Chief Paul Rhude. Chief Rhude started with the Cotuit Fire Department some 30 years ago as a call firefighter. He most recently served as Fire Chief in Nantucket for 2 years. Prior to that he was a member of the COMM FD serving as a LT and Captain for a number of years. 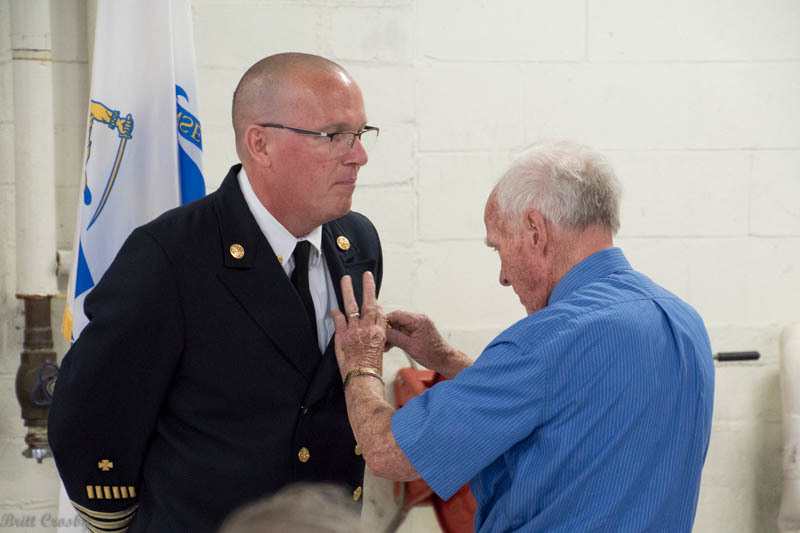 Note: 90 year old retired Cotuit Fire Chief Walter "Spike" Dottridge (sitting in photo) also attended the ceremony. Congrats and best wishes to all! 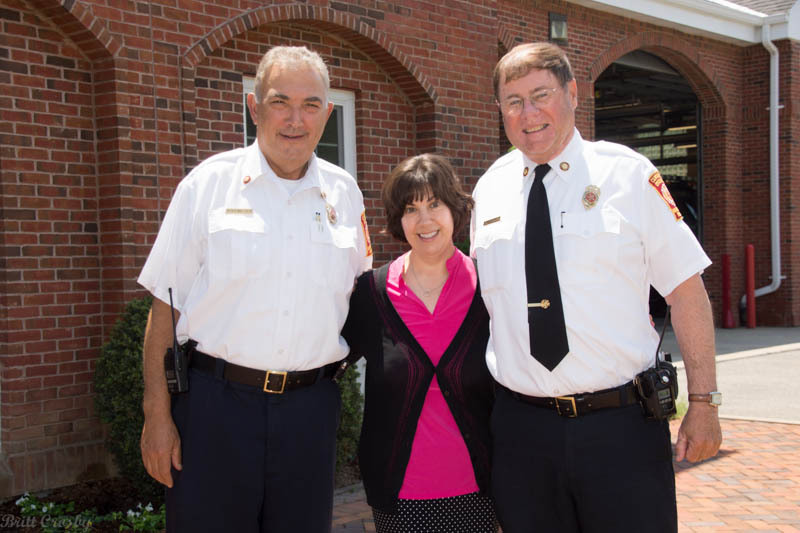 Lieutenant Vi Fellman has retired after 20 years of service with the Chatham FD. Best wishes! The Hyannis Fire Department Fire Commissioners announced their selection of Barnstable Deputy Fire Chief Peter Burke to become the next Fire Chief of the Hyannis Fire Department following their meeting on June 22, 2017. Deputy Burke comes from a fire department family, with his dad having been a long time Fire Chief in Swansea and his brother a Providence firefighter. 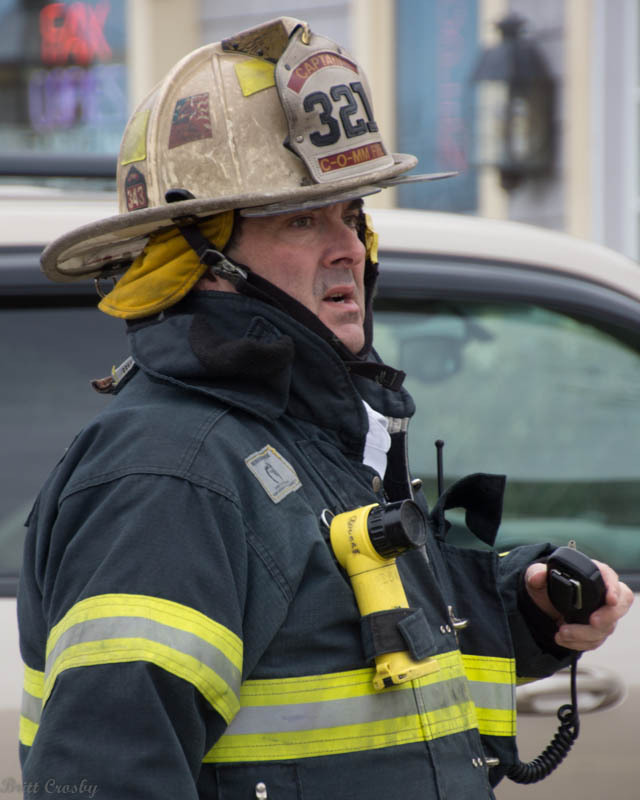 Deputy Burke joined the Seekonk Fire Department in 2002 and served as a Lt/Shift Commander prior to coming to the Cape as Deputy Chief at the Barnstable Fire Department in 2012. He has a Master's Degree in Emergency Management, a B.S. in Fire Science, and has been active with the Mass. Hazmat Team and County Technical Rescue teams. He is expected to take over in Hyannis in July 2017. He fills the vacancy created by the retirement of Hyannis Fire Chief Harold Brunelle who served as chief for 19 years. Congratulations! Hyannis Firefighter / Paramedic David Colton will retire from HYFD on June 30, 2017 after many years with the Hyannis FD. Congratulations. 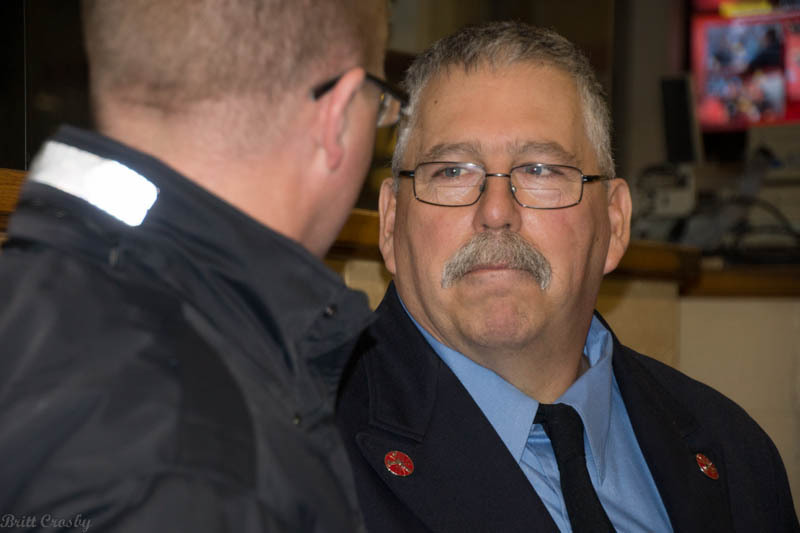 Falmouth Firefighter/EMT Todd Taylor has retired from the FFD after more than 35 years of service during which he was recognized numerous times for his actions and contributions. Congratulations and best wishes! His last day was June 22, 2017. 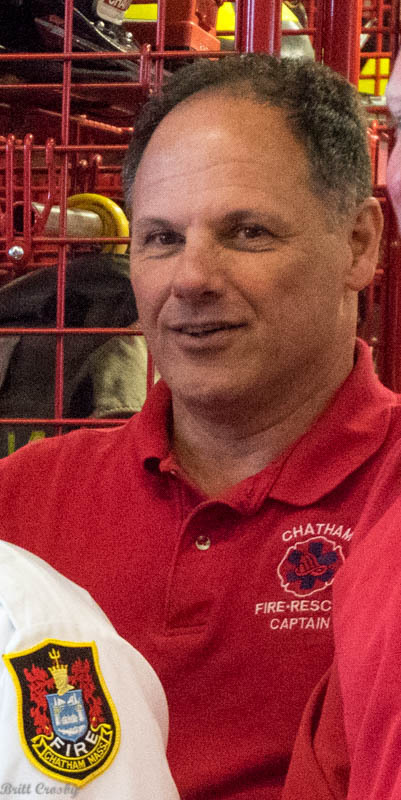 The Chatham Fire Department will promote Capt David DePasquale to the position of Deputy Fire Chief on June 14, 2017. Lt David Ready will be promoted to Captain. Justin Tavano will become a Lieutenant. Congratulations to all. 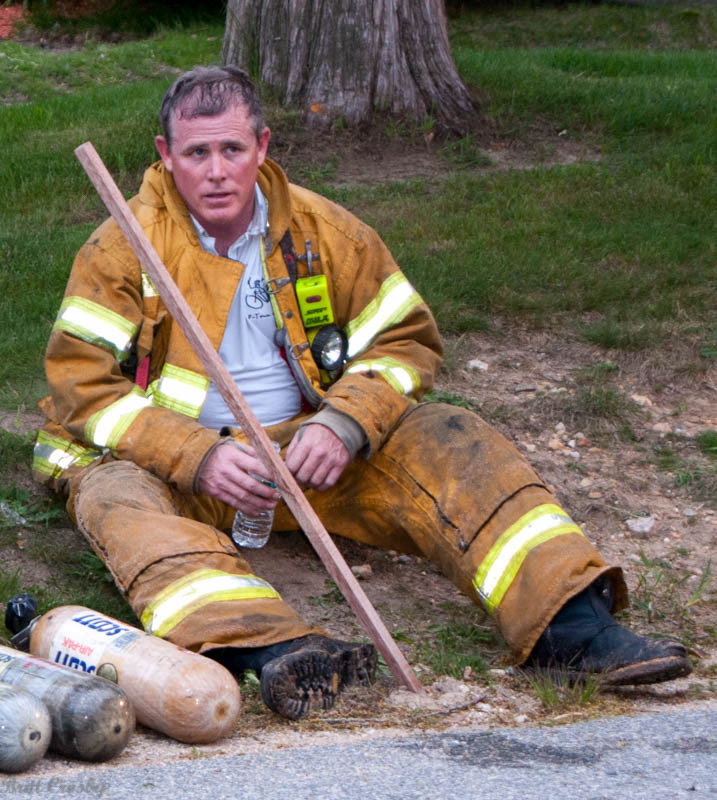 Cotuit Fire Chief Chris Olsen is planning to retire at the end of June. 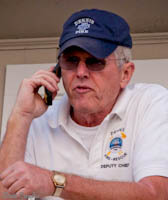 Current Nantucket Fire Chief Paul Rhude has reportedly been offered the Cotuit Chief's position. 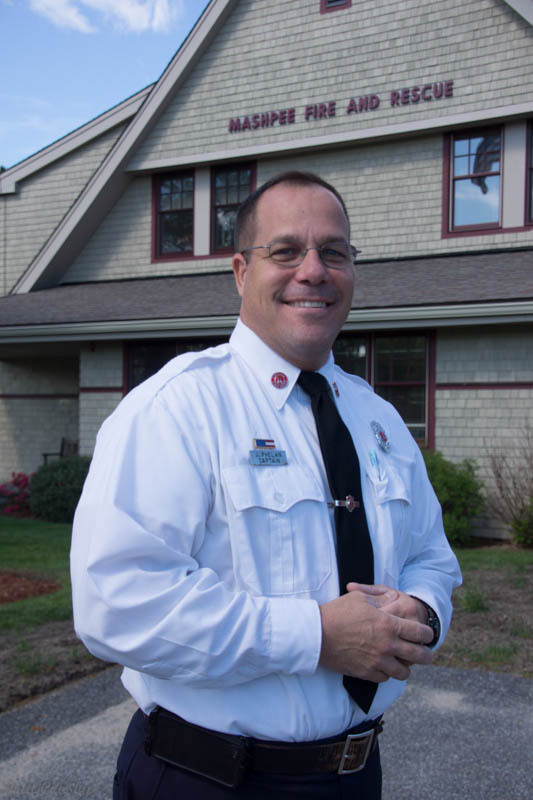 Chief Rhude began his fire service tenor as a call firefighter in Cotuit many years ago. He then served in both Mashpee and COMM FD before getting the job in Nantucket 2 years ago. Congrats to both! The proposed Nantucket Fire Headquarters Fire Station project has apparently been put off for another year. The town approved $15 Million for the station in 2015, but the station was not built. Another $2 Million was added in 2016. Bids for the work came in above that amount and the town has decided rather than hold a special meeting, they will come back prior to the Spring 2018 meeting, no doubt for additional funds. Story. Broke ground on their new Fire Headquarters May 8, 2017. The Yarmouth Fire Department mourned the passing of retired long time secretary / administrative assistant Mary Singleton, age 87, on May1, 2017. She served 33 years with the Yarmouth FD, retiring in 2009, after serving with 6 fire chiefs and dozens of firefighters. Rest in peace Mary, job well done! Congratulations to Lt. Glen Milliken upon his retirement from the Mashpee FD. Glen had 31 years with the Mashpee FD and 7 years call time with the Middleboro FD. He was a paramedic for many years. Best wishes in your retirement! Congratulations to Falmouth Firefighter Russell Ferreira (3rd from left) upon his retirement from the Falmouth FD on April 16, 2017. FF Ferreira joined the Falmouth FD as a call FF in 1983 and served as a fulltime firefighter since 1987, a total of 34 years. He was very active in the union and served many years as the President of IAFF Local 1397. 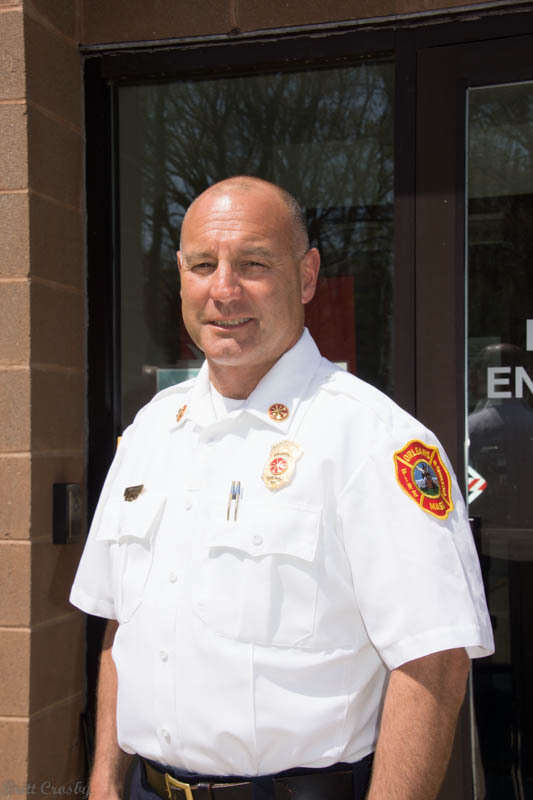 The Dennis FD has promoted Lt. Jeff Perry to Captain, replacing Captain Robert Marseglia who retired in March 2017. FF Phelim Meehan has been promoted to Lieutenant. Congratulations to both! 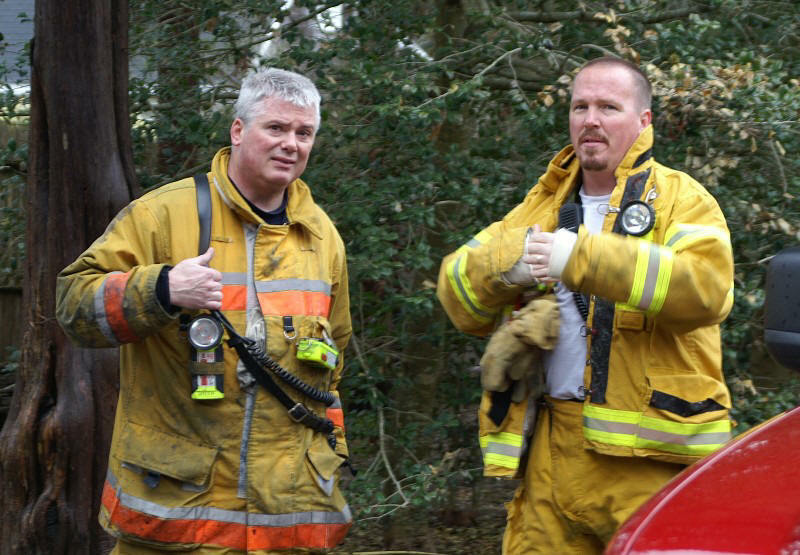 Cotuit Fire Chief Christopher Olsen (left) will be retiring in June 2017. Chief Olsen began a career with the Barnstable Fire District in 1989, rising to the position of Deputy in 2004. He took the Fire Chief job in Cotuit in 2008. Congratulations Chief! Fire & EMS providers from across the Cape & Islands area mourned the passing of Falmouth ER Doctor Evan P. Weinstein, age 45, who passed away on April 5, 2017 after a 7 year heroic battle with brain cancer. He had been a Paraamedic and firefighter in Hamilton, NY prior to becoming an MD and coming to the Cape where he played an active role in EMS direction and education while serving as Medical Director at Falmouth Hospital. Peter Connick was sworn in as the new Fire Chief in Chatham on March 31, 2017. He has been serving as the Deputy Chief since 2011 and was a Captain prior to that for many years. Chief Connick joined the Chatham FD in 1979. He worked many years as a paramedic and has also taught the EMT classes at CCCC for many years. Congratulations Chief! Chatham Fire Chief Michael Ambriscoe retired on March 31, 2017 after 12 years as chief. Congratulations and enjoy retirement! 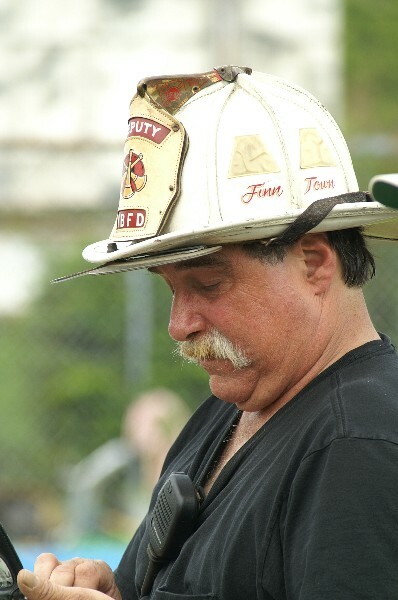 Dennis Captain Robert "Vito" Marseglia has retired from the Dennis FD after 3 decades of service. He served many years as a paramedic, climbing the ranks to LT and Captain in 2007. He retired in March 2017 after 33 years of service. 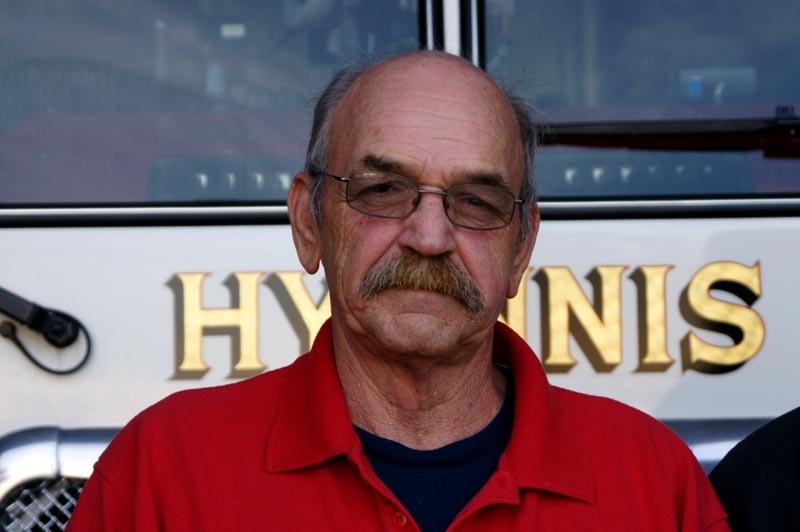 Former Captain Arthur Romme' has retired from the fire department after 44 years of total service. 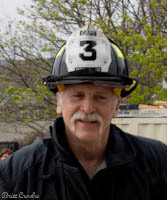 He joined the Brewster FD in 1972 as a call member and became fulltime in 1976. 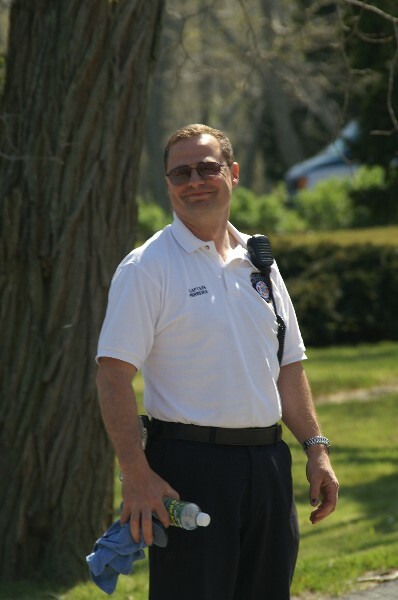 One of the original Fulltime members of the Brewster FD, Artie served as a paramedic most of his fulltime career which concluded in 2012 when Capt Romme' retired. He continued again as a call member for 5 more years, wrapping it up at the end of March 2017. Congrats and best wishes Capt! Regrets to announce the passing of retired Wareham Fire District firefighter William M. Rogers, Jr, age 90, on March 26, 2017. He joined the Wareham Fire Department at age 15 and served for 50 years. He was also a retired Captain at Otis AFB Fire Department retired in 1980. He is father of Wareham Capt Mark Rogers. Retired Falmouth FD Capt E. Michael "Mickey" Moniz passed away March 13, 2017. Captain Eric Farrenkopf is serving as Acting Deputy Chief. Chatham Fire Chief Michael Ambriscoe is expected to retire at the end of March 2017. Chief Ambriscoe came to Chatham as Chief from Connecticut in 2005. 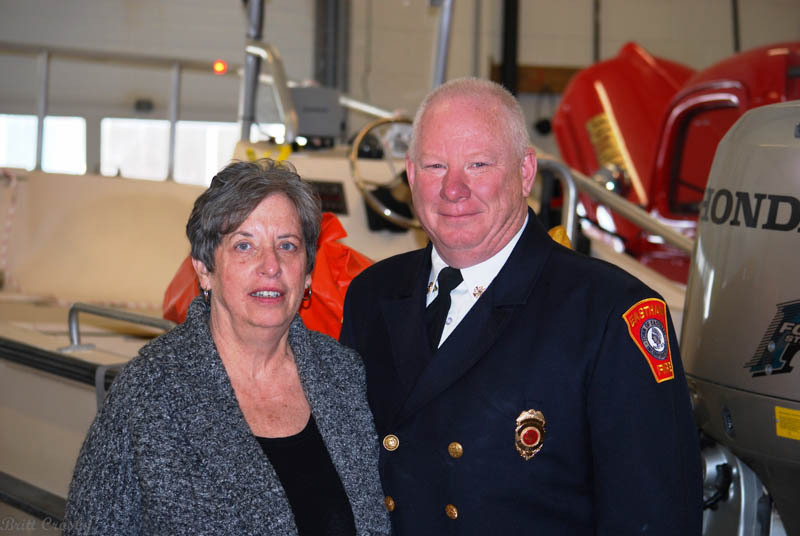 Lt. William "Lee" Sargent of Cotuit FD and Dispatcher Bina Sargent of Sandwich FD/Sandwich Communications have retired. Congrats! The Sandwich Fire Department was awarded a $1.2 Million SAFER grant in 2016 and has been hiring and training 8 new members that will bring staffing to a level that will allow staffing of all 3 fire stations. 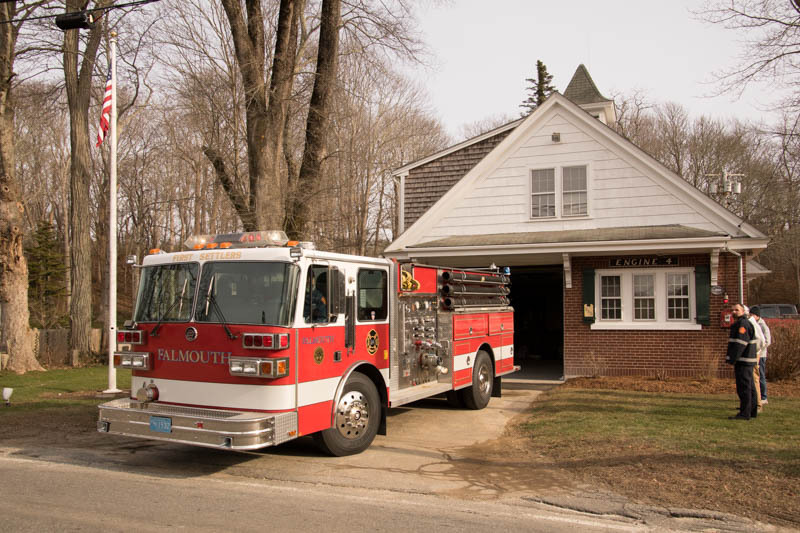 Funding was also approved in 2016 to build a new fire station in Forestdale, at Quaker Meeting house and Cotuit Road with a new Police station, and to renovate the East Sandwich fire station to enable it to be staffed. 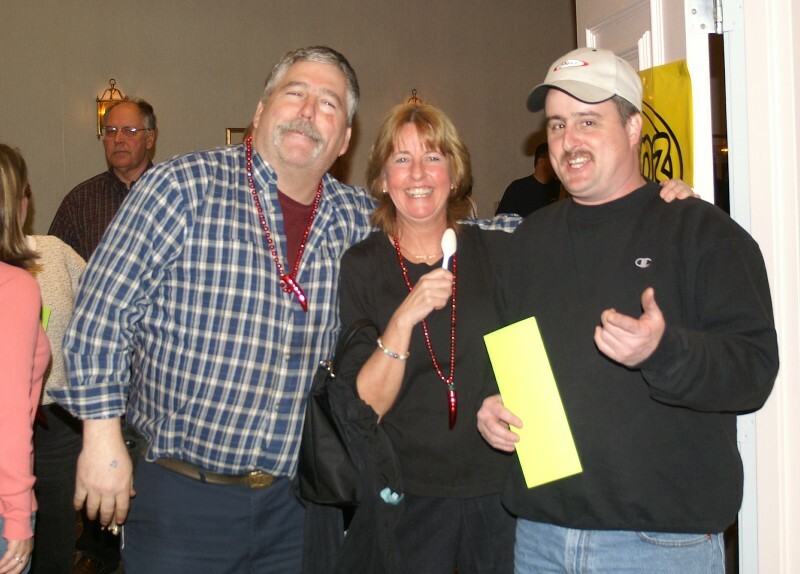 The annual MDA Chili Challenge was held in Hyannis on March 5, 2017. The team from Joint Base Cape Cod was awarded two 1st Place Awards for Chef's Cup and People's Choice. The Orleans FD, once again, was awarded the Hottest Chili award. The Onset FD regrets the passing of Call Firefighter, and former DCR District 2 Fire Warden Ronald A. Aseltine, age 49, on February 26, 2017. Ron was a member of the fire service since 1999 when he became a seasonal firefighter with the Mass DCR. 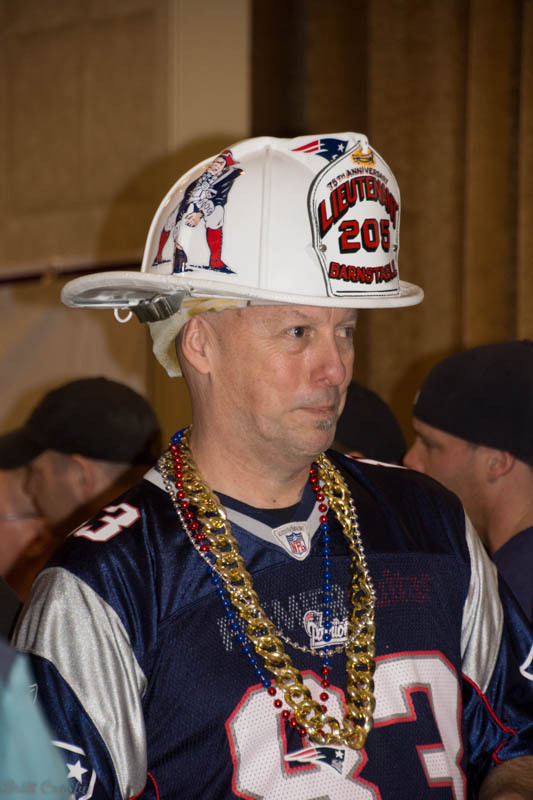 He served as the DCR District 2 Fire Warden from 2007-2014. He was a member of the Onset FD for a number of years as well. For Services info Chapman, Cole & Gleason. Brewster FD regrets to announce the passing of retired call Captain Henry Sears on January 31, 2017. 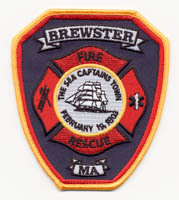 Capt Sears joined the Brewster FD in 1969 and served more than 30 years as a firefighter, EMT, and Captain. Retired Falmouth Fire Chief Paul D. Brodeur passed away on January 20, 2017 after a battle with cancer. He served 13 years a chief retiring in 2010 after 34 years on the Falmouth FD. The Dennis FD has promoted Lt Chris Guerriero to Captain. Geoffrey Mulholland has been promoted to Lieutenant. Congrats! Deputy Chief Dean Melanson has been promoted to Acting Fire Chief as of January 9, 2017 following the retirement of Chief Harold Brunelle. Mark Omerzu was promoted to Captain with the recent retirement of Captain Roupen Baker. Congrats to both! 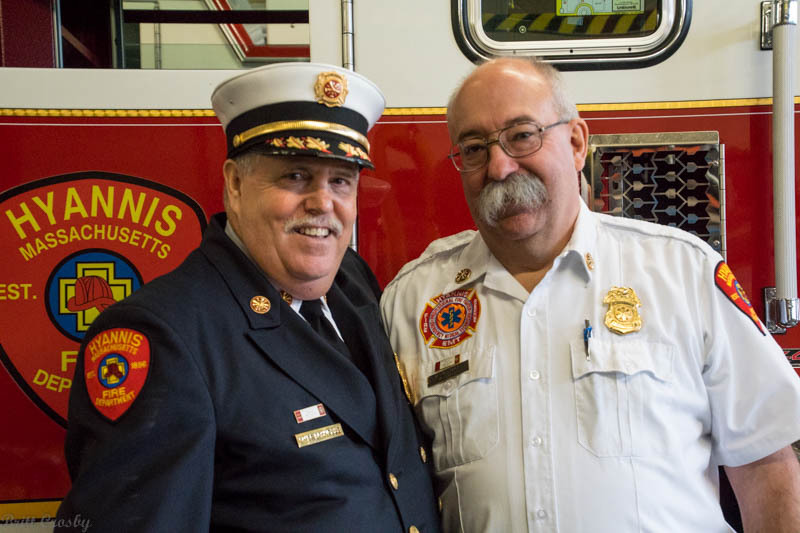 RETIREMENT SENDOFF: Hyannis Firefighter Barry Pina began a 42 year fire service career in 1975 with the Centerville-Osterville Fire Department as a founding member of the Marstons Mills Fire Station #3. He worked at CCH for many years and joined the Hyannis Fire Department 32-1/2 years ago. Known by everyone everywhere as "one of the Good Guys." A Retirement Sendoff will be held on Friday January 20, 2017 from 1000-1800 hours at the Hyannis Fire Station. Congratulations Barry! Two former members of the COMM FD have passed away. Retired dispatcher Wayne Jordan apparently passed away in October 2016. Retired Call Firefighter Leonard Mendes, age 81, passed away on Nov 26, 2016. Congratulations to Hyannis Firefighter Barry Pina for receiving the 2016 Norman Knight Award for Excellence in Community Service on Tuesday November 29, 2016 at the 27th Firefighter of the Year Awards ceremony in Worcester. 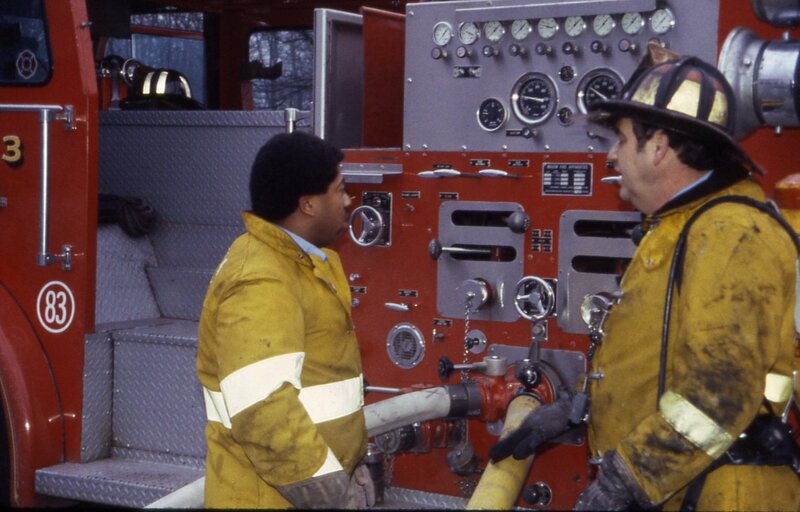 FF Pina entered the fire service in 1975 as a call firefighter for COMM FD. 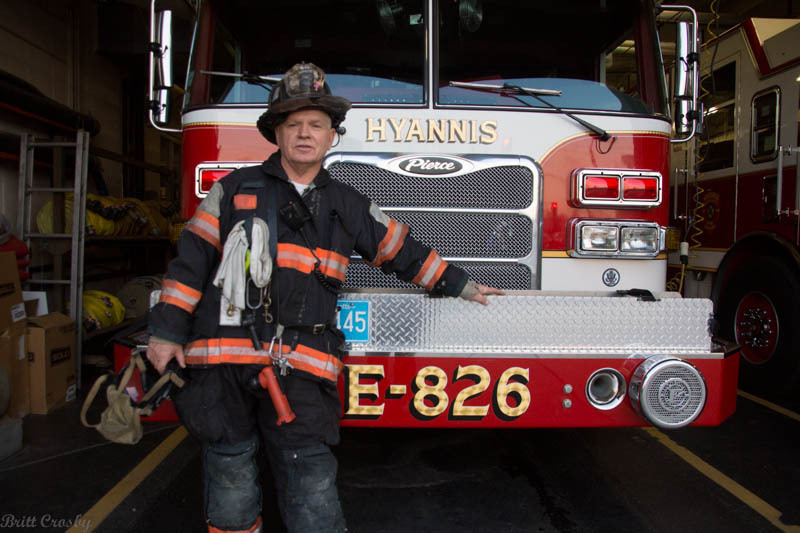 He has served fulltime with the Hyannis FD for 32 years. His commitment to coordinating the MDA Fill the Boot program is credited with raising over $300,000 for Muscular Dystrophy research. 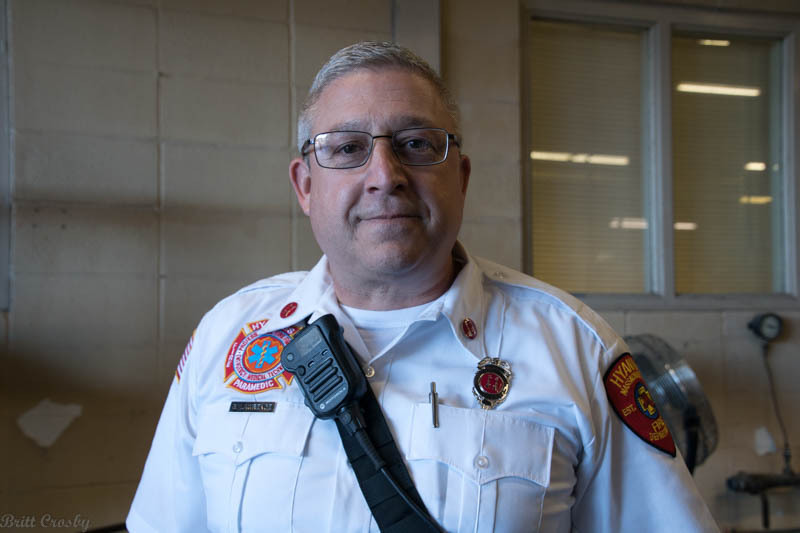 Barry has been active in many other areas including being part of the Barnstable County Critical Incident Stress Team, teaching CPR for many years, and much more. FF Pina is scheduled to retire in January 2017. Congratulations Barry! Regrets to announce the passing of retired Fire Alarm Superintendant Richard Oliver on Nov 18, 2016. Congratulations to the COMM FD Ambulance crew who delivered a healthy baby girl in the back of their moving ambulance on Nov 14, 2016. EMT David Gelinas got credit for the official catch, while Paramedic Jason Travis, Lt/P Louis Sassone, and crew member Ryan Scott all participated in the special delivery. Captain Ed Guilford has retired from the BFD after 31 years of service. Kevin Brailey has been named the new Captain of Group 2. Congratulations and best wishes to both! Former Deputy Chief William "Bill" MacDougall passed away Oct 12, 2016 at age 82. He served the Town of Marion for 62 years. Chatham Fire Chief Michael Ambriscoe has announced his intention to retire in the Spring of 2017. Chief Ambriscoe came to Chatham as Chief in 2005. Fire Chief Harold Brunelle served the Hyannis Fire Department for 44 years, the last 19 of which as the Fire Chief. His last day of work was Oct 31, 2016. Congratulations Chief! Enjoy! The COMM FD and many others in the Cape Cod area are deeply saddened by the very tragic death of Jordan Galvin-Juntas, age 19, on October 23, 2016. Jordan graduated from Barnstable High School in 2015. 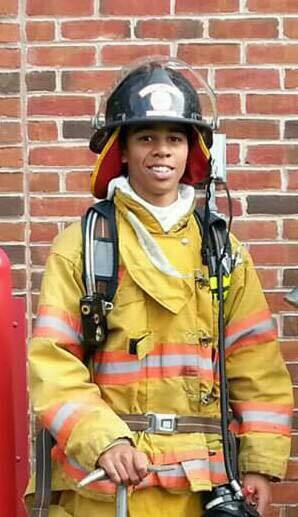 He had done an internship in his senior year with the department and showed great promise as a future firefighter. He was attending Ana Maria College in the Fire Science program. Jordan, his 20 year old cousin Kraig Diggs of Osterville, 19 year old Jordan Fisher of Harwich, and 18 year old Cory Licata of West Babylon, NY were in a car returning from the Cape to school at 12:11 AM on I-495 in Middleborough, MA when another car, driven by a 31 year old Fall River woman, heading the wrong way in the northbound lane ofI-495 struck the 4 students' car headon causing it to explode in fire. All 5 people were killed in the crash. Jordan and the other young men were highly respected, good kids who had bright futures. Former call firefighter Charles A. "Cam" Matthews, age 69, passed away on October 19, 2016. An Army Vet, "Cammy" was a member of the BFD for many years and dispatched for the Barnstable Sheriff's Department as well. Retired Deputy Chief William F MacDougall, age 82, passed away on September 12, 2016. He was a member of the Marion FD for 62 years in various capacities including Deputy Chief. Retired Lieutenant Edward A. Oberlander, age 79, passed away on September 8, 2016 after a battle with cancer. He joined the Dennis FD as a call firefighter in 1970 and became known as "Fast Eddy" to his fellow firefighters. He became a permanent firefighter in 1975 and retired as a Lieutenant in 1998. He was the father of Hyannis firefighter John Oberlander. Retired COMM Senior Private Fred Lewis passed away on Sept 8, 2016. He had battled cancer for several years. Fred was an EMT and served with the juvenile fire setter program for years. 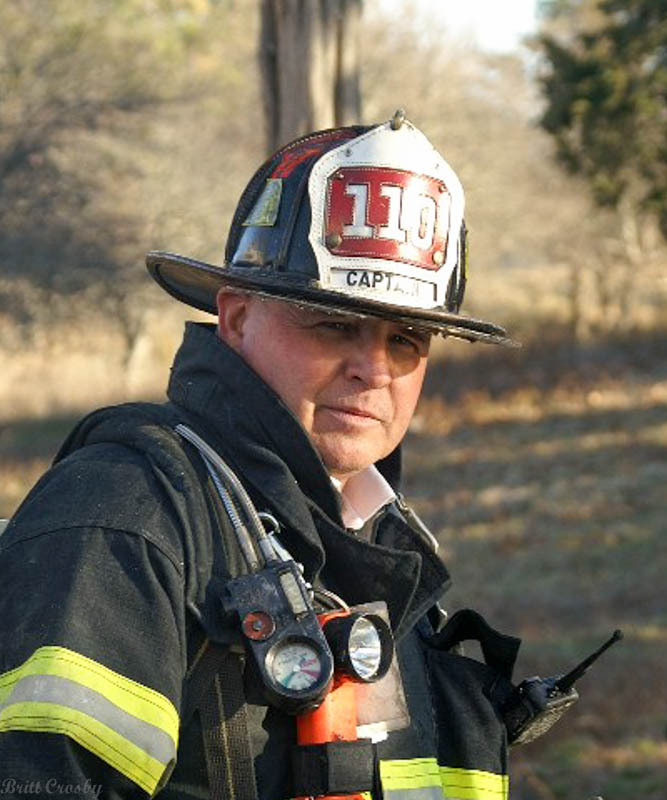 He began his career with the Hyannis FD and then with COMM FD for years, with a medical retirement in 2009. Fred was well known around the Cape and will be greatly missed. RIP. 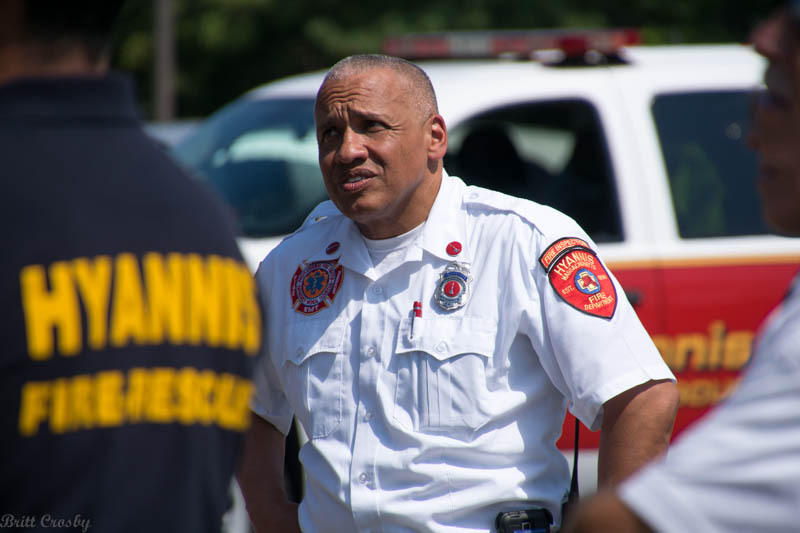 Fire Chief Harold Brunelle has announced his intention to retire within the next few months. 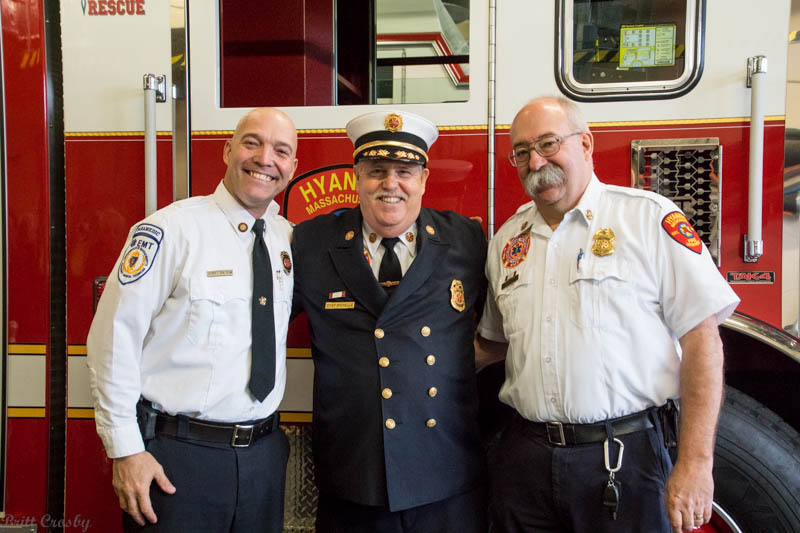 Chief Brunelle has been a member of the Hyannis FD for 44 years, joining in 1972 as a Junior FF and coming up through the ranks to serve as Chief for the past 18 years. Congrats Chief on a job well done! FF Robert "Jittery" George retired after more than 48 years as a member of the Sandwich FD on Aug 25, 2016. The senior member of SFD began his fire service career as a Jr firefighter in 1968 and was hired fulltime in 1973. He played a major role in the Sandwich FF Union Local 2196 and served the department in many ways over the years. Two of his sons are currently on the job as well. Best wishes "Jit" in your retirement! 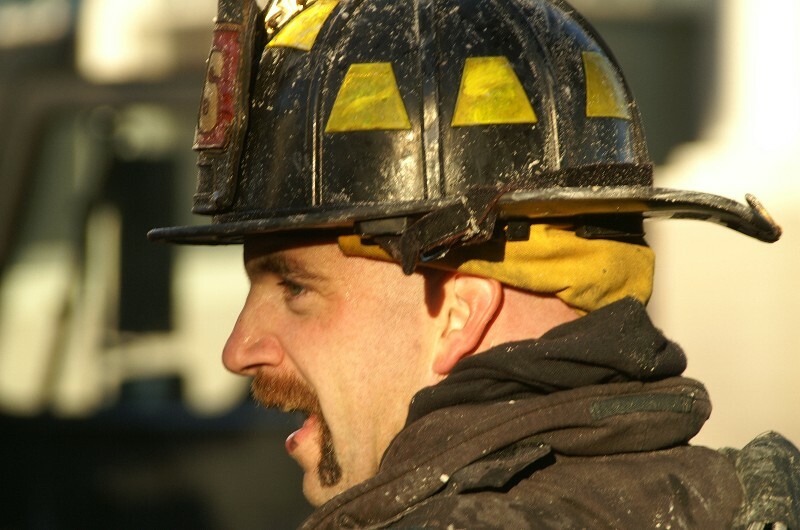 Congrats to former JBCC union President and FF Rob Rogowski who has been selected to be the Fire Chief in Barre, MA. Sandwich Dispatcher Kathy Keene retired after 18 years with SFD and SPD. She had also served as a call firefighter for many years. Congrats to her! The Falmouth Fire Rescue Department held a promotional and recognition ceremony on July 8, 2016. During the event, several officers were officially sworn into their new positions including new Fire Chief Michal Small, new Deputy Fire Chief Scott J Thrasher, new Captain Bruce D. Girouard, and new Lieutenant Terrance A. Rogers. Four new firefighters were also sworn in. Several other department members were recognized for meritorious work in recent months. Congrats to all! 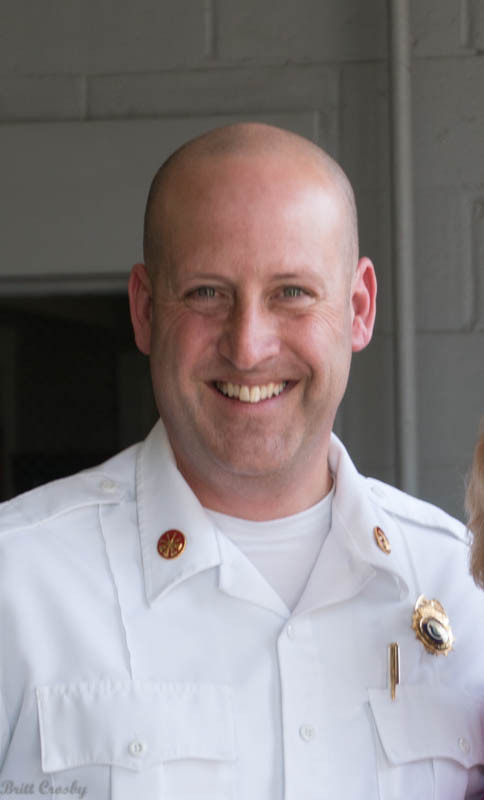 The Brewster Fire Department has promoted Kevin Varley to become the department's first fulltime Deputy Fire Chief. He had previously served as a Captain. Congratulations Deputy. COMM FD Dispatcher Jeff Gifford has retired after 32 years of service. 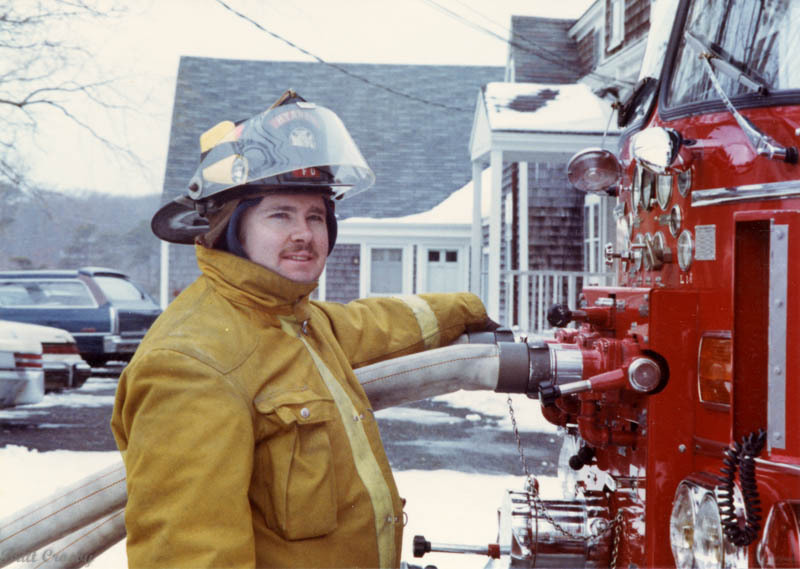 Jeff began his fire service career as a call firefighter in Cotuit during the late 1970s and joined COMM as a dispatcher in 1984. His voice on the radio and professionalism in his duties will be missed. Congratulations Jeff! Enjoy your retirement! Deputy Chief Michael Young retired on July 5, 2016 after 36 years with the Plymouth Fire Department. Congratulations Deputy! Firefighter/Paramedic John Ayer retired June 27, 2016 from the Harwich FD after some 40 years of service to the town. Congrats on a job well done John! Falmouth Fire Department has a new "official" fire chief. Michael Small has been appointed as Fire Chief officially as of June 6, 2016 filling the position created by Chief Mark Sullivan's retirement. 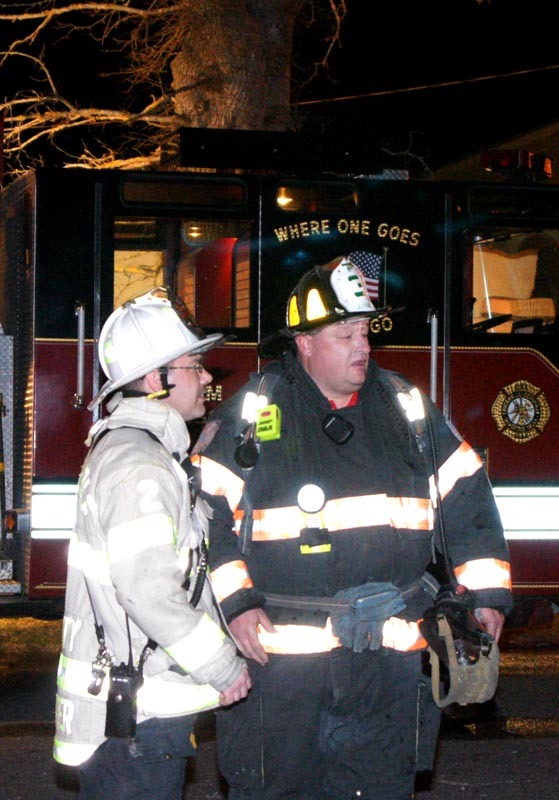 Chief Small started out in Bourne and has been a member of the Falmouth FD for many years. 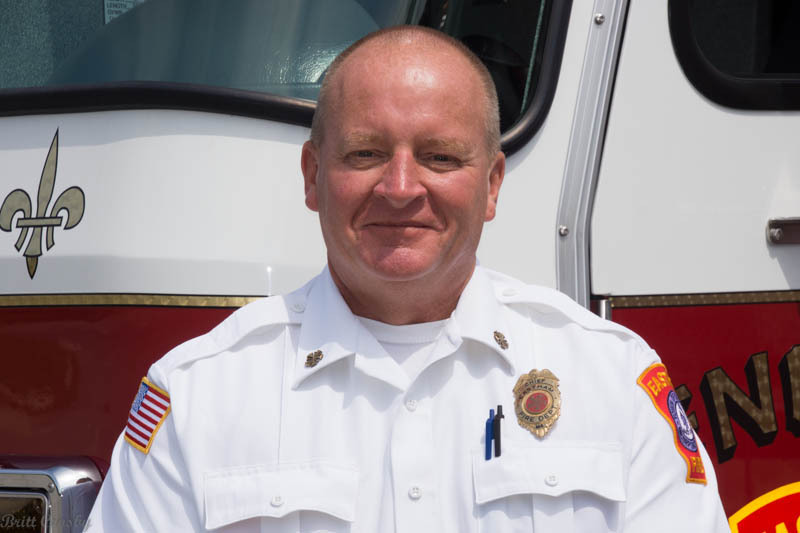 He moved through the ranks as a paramedic and officer, serving in recent years as a deputy chief and since the retirement of Chief Sullivan served as the Acting Chief. Congrats Chief Small on your official appointment! Retired Oak Bluffs Fire Chief Dennis P. Alley, age 80, passed away on Monday May 30, 2016. 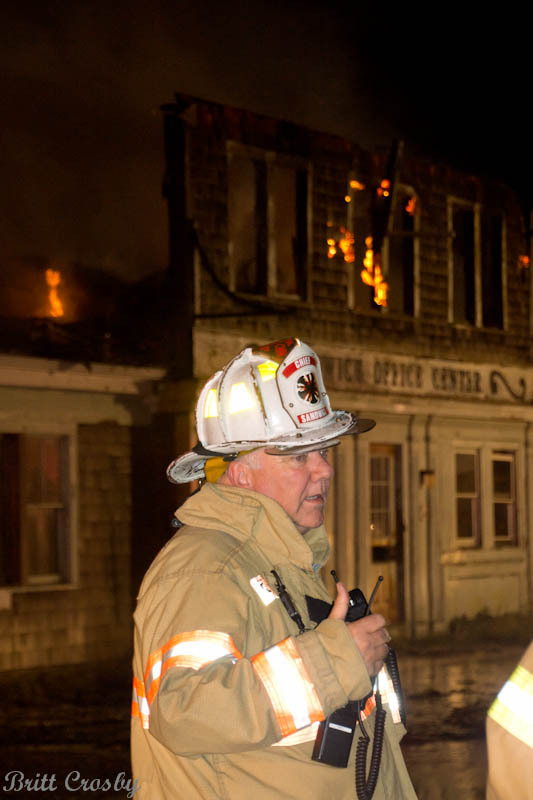 He was a member of the Oak Bluffs FD for 53 years, the last 12 of which as Fire Chief. 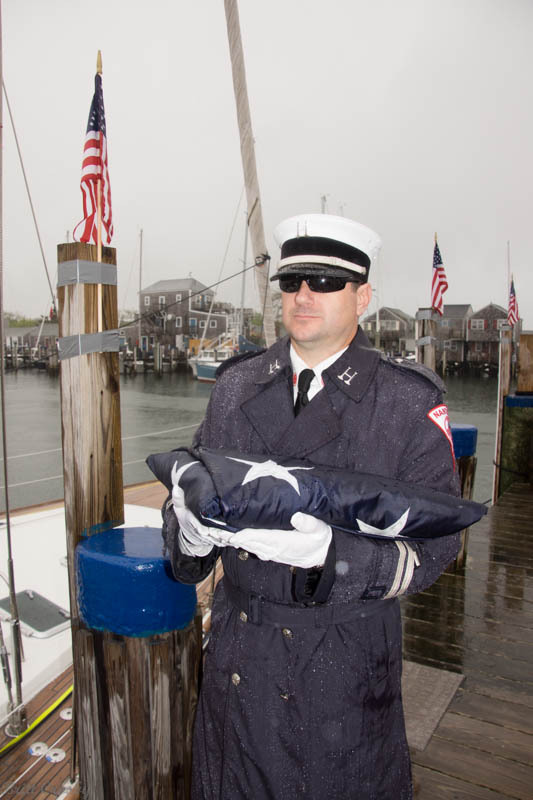 He was the grandson of another Oak Bluffs Fire Chief Antone Alley. Services were held on Friday June 3, 2016. Retired Mattapoisett Fire Chief Donald C. "Woody" Wood passed away on May 22, 2016. A long time member of the Mattapoisett FD, he retired as Chief in 1993. Truro voters approved the hiring of 6 fulltime personnel at the May 11, 2016 Town Meeting moving to establish their first fulltime staffing. The department has long been a call department, but has struggled to have reliable responses in recent years. WBFD made several promotions in May. Three members were promoted to Lieutenant, including career Lt/Paramedic Keith Stranger, Group 2 Executive Officer Lt Zach Hammond, and Group 4 Executive Officer Lt Dave Maki. Congrats to all! Many of us who worked in EMS on Cape Cod over the past 40 years or so came to appreciate the dedicated work of Cape Cod Hospital Emergency Room Nurse Faye Everson. She was very involved in training EMTs and Paramedics and holding all those who came to CCH to a higher standard of care. She was strongly committed to patient care and to all those who provide it. Faye passed away on April 23, 2016. Rest in Peace Nurse Everson! 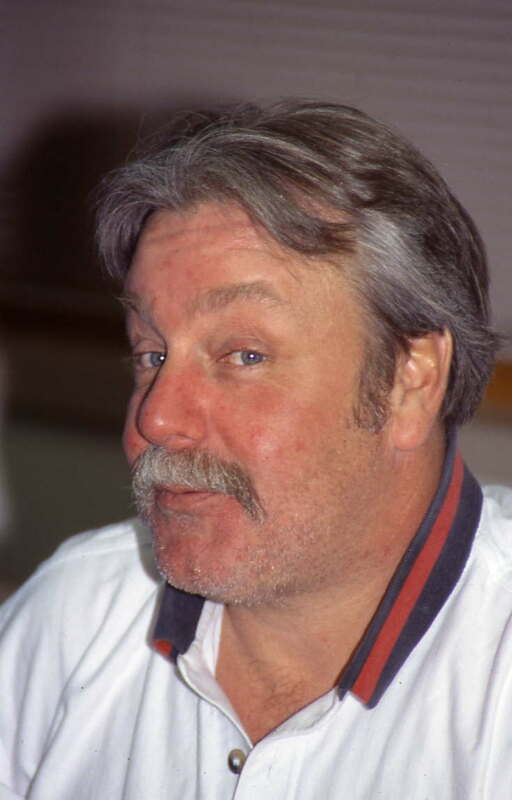 Former Dennis FD part time dispatcher, DCR Barnstable Fire Tower operator, Cape Cod Times reporter and news (fire) Photographer Harold "Buzzy" Cobb passed away at age 73 on April 20, 2016. Many of the significant fires of the 70's - 2000's were photographed by Buzzy. RIP. Long time Brewster Firefighter/Paramedic Glen Cefalo retired on April 11, 2016 after 33.5 years in the fire service which included working for both Yarmouth and Brewster Fire Department's. 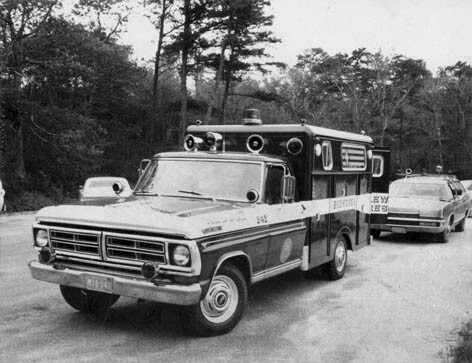 Glen was also very involved in the EMS System on Cape Cod. Congrats on your retirement Glen! 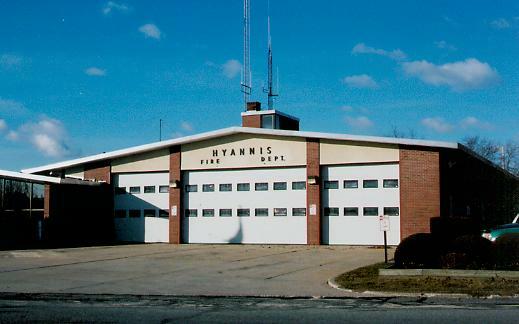 Hyannis Fire District voters approved construction of a new fire station to replace the current headquarters at a special district meeting held on Saturday April 9, 2016. A 2/3 majority was required to approve spending approximately $18.5 Million for a new 33,000 square foot facility. The vote by 1,673 voters was 1,228 in favor and 445 against, passing with about 74% of the voters support. 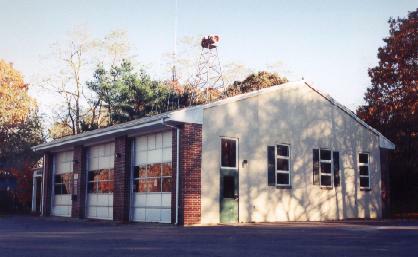 The present fire station built in 1965 and added onto in the 1980s was originally built for a primarily call fire department with only 3 or 4 fulltime firefighters. The department today has 12 personnel per shift with additional day staff of over 50 employees. The apparatus floor, once very spacious and open has been full for years with larger apparatus, turnout gear, and equipment. The new station will be built on a lot next to the present station over the next couple years and then the old station will come down. Congrats to all the teams that participated. With the recent retirement of Fire Chief Mark Sullivan, the following officers have been assigned to acting positions. Retired Fire Chief Richard J. "Rich" Guerzoni, age 61 passed away on February 9m 2016. He joined the Marion Fire Department in 1974 and became the department's first full time Fire Chief in 2002. He retired in 2009. Visiting hours Friday Feb 12, 2016 1600-2000 at Chapman, Cole & Gleason Funeral Home, 2599 Cranberry Highway, Wareham. Congratulations to newly appointed Captain Craig Thorton who was sworn in on January 29, 2016. 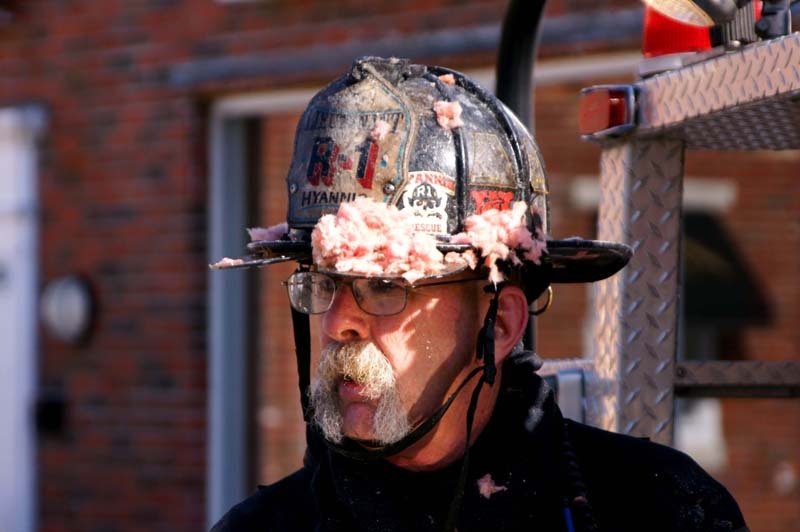 He is a 25 year member of the fire service, with 18 years on Harwich FD. He fills the Captain position vacated by the promotion of Captain David LeBlanc to Deputy Chief. Thorton has served as a Lieutenant / Paramedic since 2012. Justyne Walorz was recently appointed as Lieutenant. Several other members were recognized including Firefighter/Paramedic John Ayer for his 40 years (so far) of service to the Town of Harwich. Congrats to all for your service and achievements. 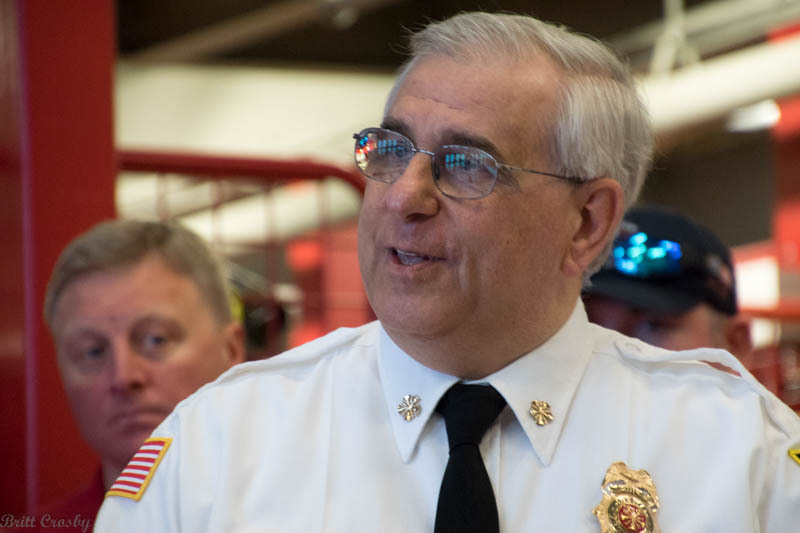 Massachusetts State Fire Marshal Stephen Coan is retiring after 20 years as the head of the Massachusetts Department of Fire Services. Marshal Coan was a key leader in fire prevention, fire training, development of the State's Haz Mat Response Team system, the Incident Response and Rehab units, and much more. 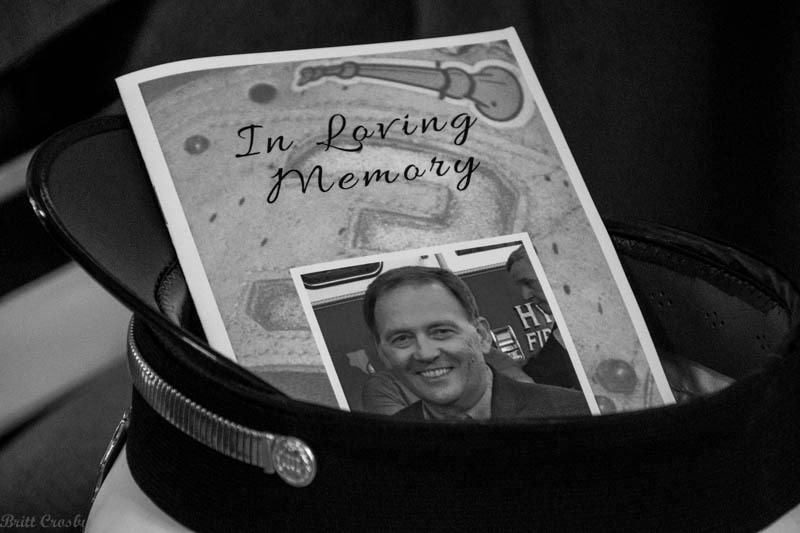 He was frequently a spokesman at tragic events across the state and has represented the fire service on TV and other media. 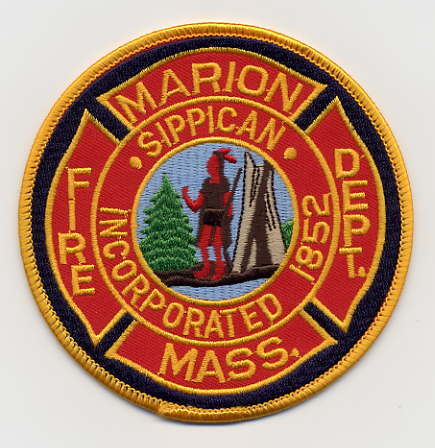 Marshal Coan will be succeeded by the Deputy State Fire Marshal Peter J. Ostrosky who also previously served as the Fire Chief of Uxbridge, MA. Congrats to both and best wishes to Marshal Coan in your retirement! 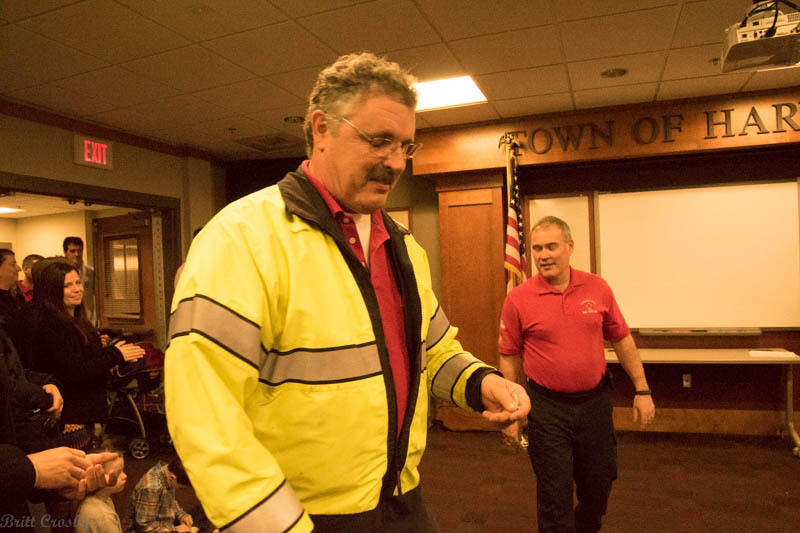 Falmouth Fire Chief Mark Sullivan has retired after 40 years in the fire service. He served as Falmouth's Chief for 5 years since 2010. Deputy Chief Mike Small takes over as Acting Fire Chief as of Jan 15, 2016. The process of selecting the next chief is ongoing and expected to be completed in the early Spring 2016. Congratulations to both for their service! Several other acting promotions will be announced soon. Falmouth put a 1992 Sutphen pumper in service as Engine 24 on January 15, 2016 allowing the West Falmouth Fire Station #4 to once again have a fire engine. It has been equipped with only a pickup truck and 1 firefighter since November 2015 when the 1987 Ford pumper that was assigned went out of service. 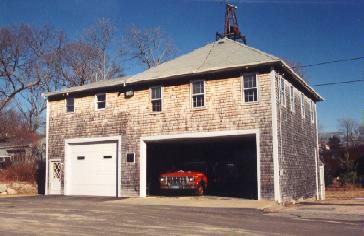 The Siasconset Fire Station in the east end of the island was often staffed by a small handful of long time dedicated call members. There has been a fire station here for 121 years. 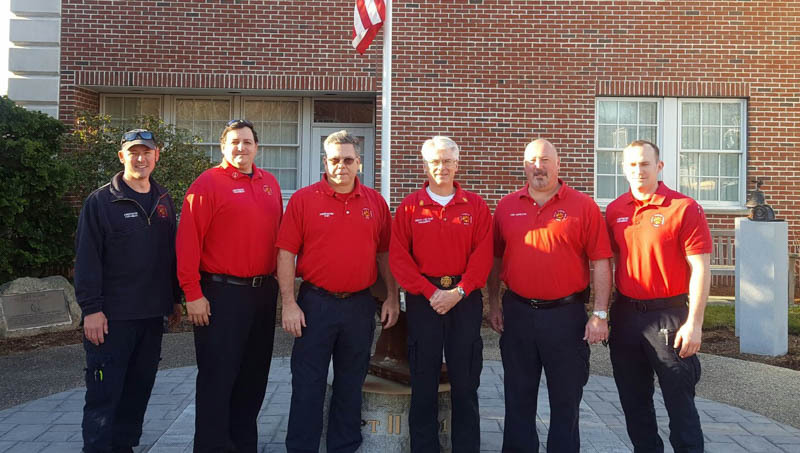 On Jan 1, 2016 the department required the five remaining members of the station, all over age 65, to retire in accordance with state regulations. Retired Deputy Fire Chief Peter D. Robertson, age 69, passed away on Jan 7, 2016. He had been a member of the Marion FD for over 40 years, serving his last 15 years as Deputy Chief until his 2000 retirement. RIP. Lieutenant Michael Mason retired from the Harwich Fire Department after some 30 years with the HFD and 36 total in the fire service on Jan 6, 2016. Congratulations! Firefighter/Paramedic Justyne Walorz was promoted to Lieutenant on Jan 7, 2016. Congratulations! 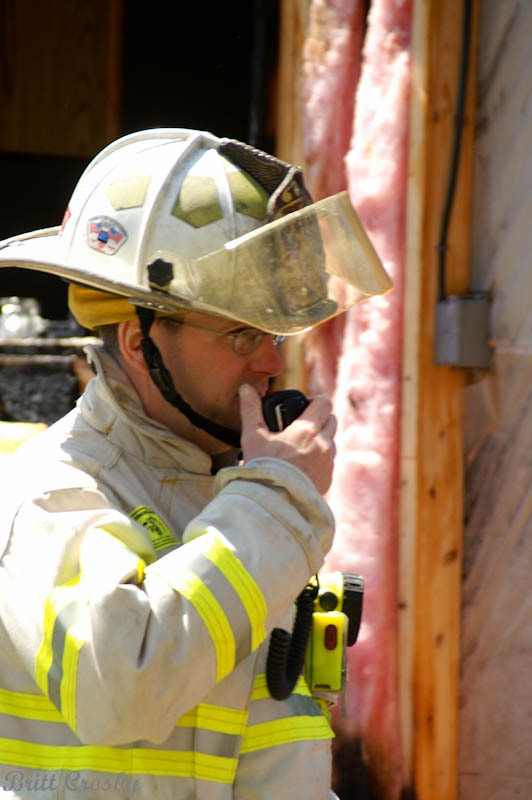 Truro Fire Department has raised the bar for training requirements for all members. The standards have been raised to come inline with state certifications expected by most departments as minimum standards. Cape Cod Time Story. Recently promoted Captain Greg Dardia. The Barnstable Fire Department and IAFF Local 3276 regret to announce the passing of retired Barnstable Firefighter William "Billy" Fleming, December 31, 2015. He served as a fulltime firefighter from 1989 to 2009. Congratulations to one of our friends in blue. Barnstable Police Department Lieutenant David Cameron worked his last official shift on Jan 1, 2016 after a 36+ year career with BPD. Congrats Dave! One of the most recognizable voices on the scanner for the past 20 years on Cape Cod has retired from the Barnstable Sheriff's Department Communications Center. 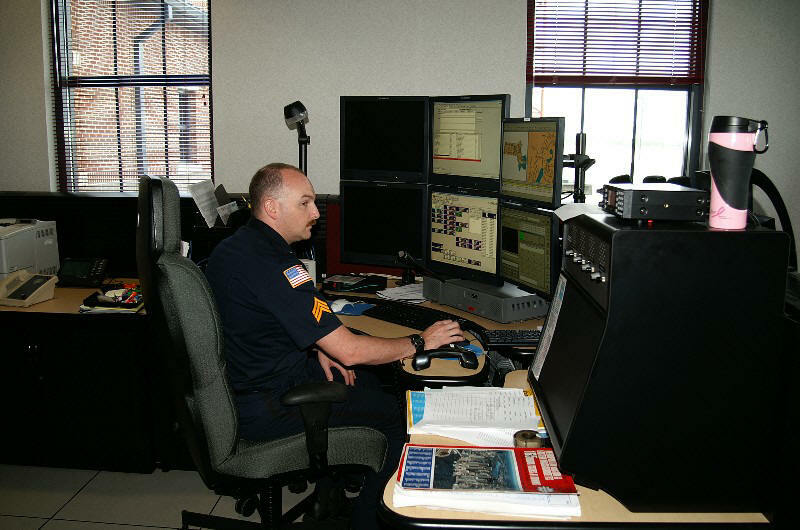 Dave Diamond worked as a full time dispatcher for the majority of his career. 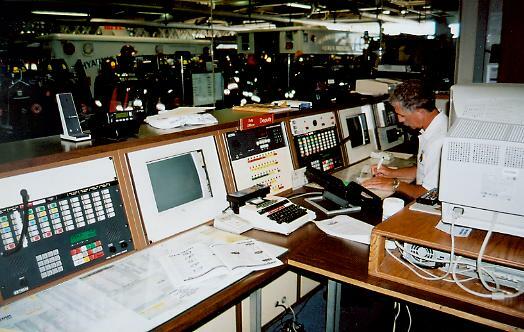 Dispatching included the Sheriff's department, Barnstable CMED, 10 Cape fire departments, and more over the years. A few years ago he retired, but remained on as one of the few, and in fact the last of the part time spare dispatchers. He worked his last shift on December 30, 2015 and signed off as Operator 200. His professionalism, experience, sense of humor, great stories, and special voice will be missed. Congratulations Dave! Job well done sir! KCA 376 & KCB 781 will never be the same! 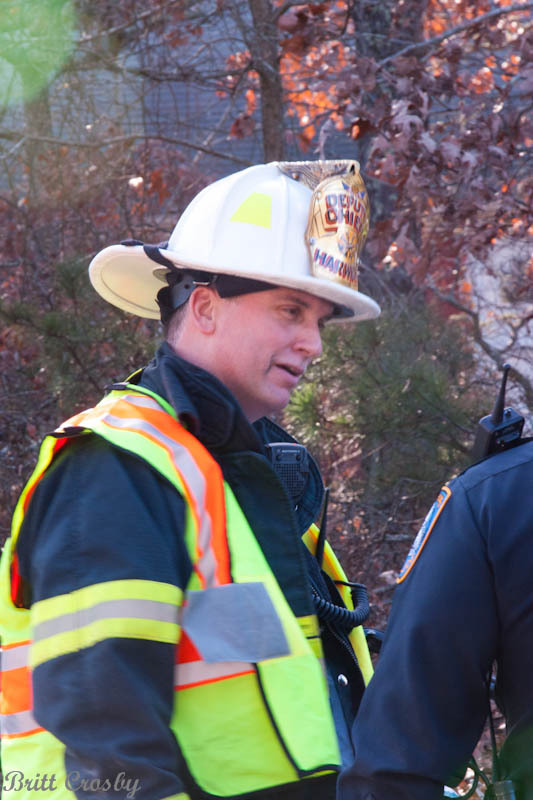 Captain Michael White has retired after 29 years of service as of Dec 4, 2015. Capt White joined Fal FD in 1986. Congrats and enjoy your retirement! Lt Robert Bergeron has been promoted to Captain and FF Jeffery Waggatt has been promoted to Lieutenant. Congratulations to both! Lieutenant Mike Mason will be retiring effective January 6, 2015. Congratulations and best wishes in retirement Mike! Firefighter/Paramedic Justyne Walorz will be promoted to Lieutenant on Group 1 effective January 8, 2016. Congrats Justyne! 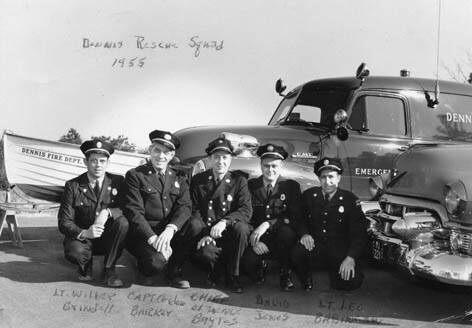 Retired call Lieutenant Leo Babineau (on the right in this 1955 photo), age 93, passed away on Dec 4, 2015. A WWII Navy Vet, he was one of the founding members of the Dennis Rescue Squad and served for 39 years, retiring as a Lieutenant. He was the father of Dennis Capt Donald Babineau. 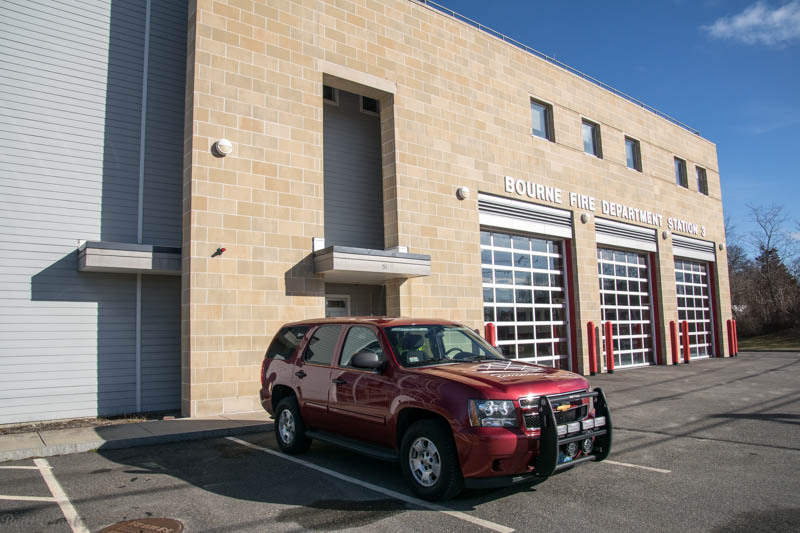 A year after the old fire station was torn down, OBFD crews moved into their brand new Fire-EMS Station on Dec 6, 2015. The station located on the site of the old station at Wing Road & County Road has been dedicated to past Fire Chief Nelson W. Amaral who served as chief for 34 years. The new station is 20,250 sq feet, has 12 bays for apparatus and was built for approximately $8.3 Million. Congrats to Oak Bluffs! 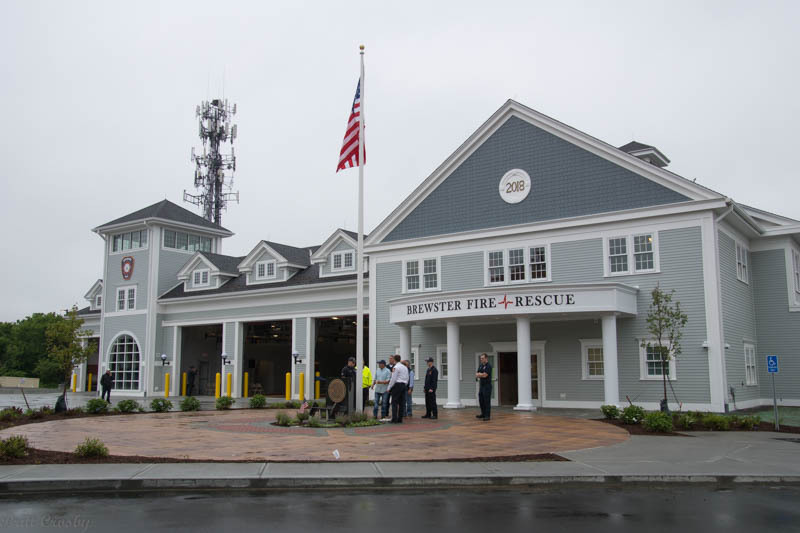 An affirmative vote in the November 16, 2015 special town meeting approved construction of a new Brewster Fire-Rescue Headquarters station. $13.4 Million was approved for construction of a 5 bay, 22,000 sq foot facility that will be built behind the present station. Construction is expected to begin by the spring of 2017. The facility will replace the 1974 station that was originally a combined police/fire station with no fulltime personnel. 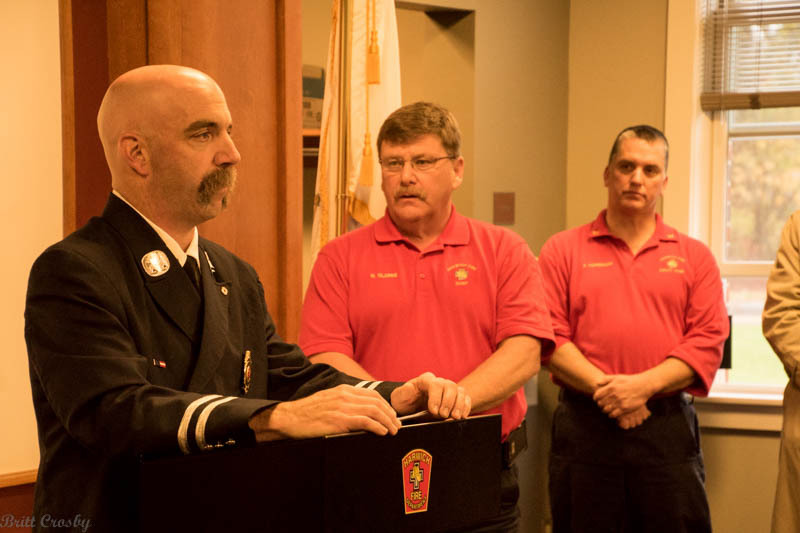 The new Eastham Fire Chief Kent Farrenkopf was sworn in on November 20, 2015. He was previously the Deputy Chief in Harwich and has been in the fire service for over 32 years. He replaces retired Eastham Fire Chief Mark Foley. Farrenkopf's father Richard served as the Hyannis Fire Chief for 10 years and his three brothers also served as officers on Cape FDs. Harwich promoted Capt David LeBlanc to Deputy Chief and Firefighter Scott Tyldesley to Lieutenant at a ceremony at the Harwich FD on Nov 11, 2015. 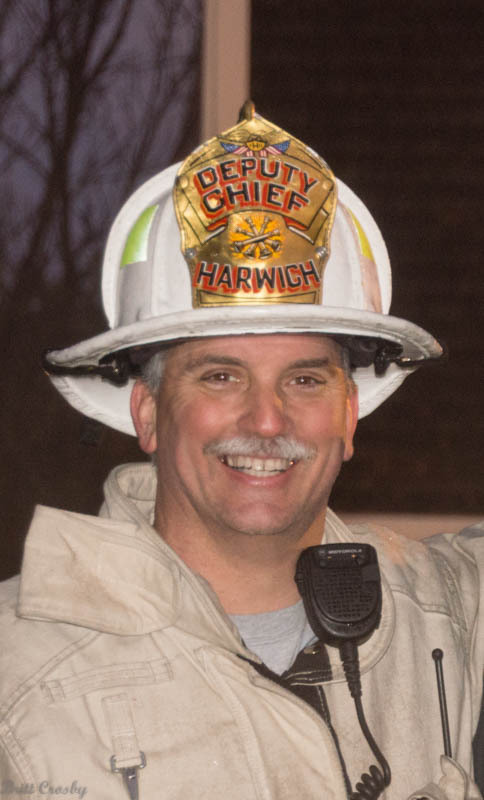 Harwich Fire has announced that Captain David LeBlanc will be promoted to Deputy Chief in November to fill the position vacated by Deputy Kent Farrenkopf leaving to become the Eastham Chief. LeBlanc started out with the Dennis FD and has served with Harwich as a dispatcher, firefighter, Lieutenant, and Captain. He has also been the fire investigator. Congrats! 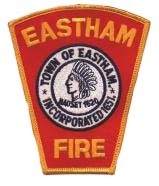 Eastham has selected Harwich Deputy Fire Chief Kent Farrenkopf to become the next Eastham Fire Chief replacing Chief Mark Foley in November 2015. Farrenkopf has been the Harwich Deputy since November 2011. Prior to that he had served as a shift Captain, Lieutenant, and firefighter. His father Richard Farrenkopf had served as the Chie in Hyannis during the 1980s. Three of his brothers have also served in the fire service as Captains in Hyannis and Dennis. Congrats! 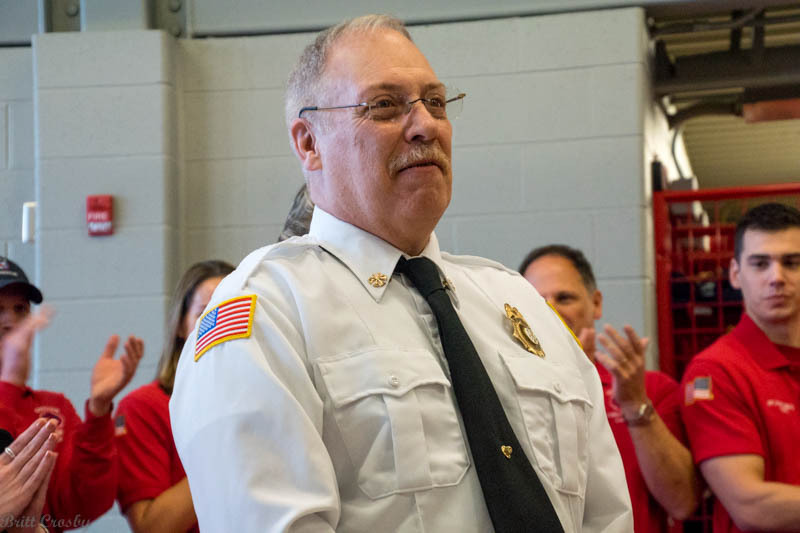 Eastham Fire Chief Mark Foley will be retiring in mid November after 2 years as Chief. 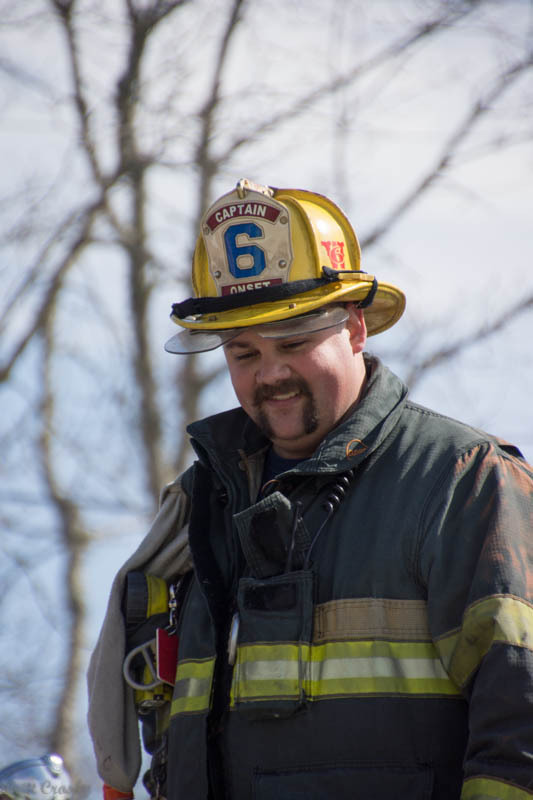 The Plymouth Fire Department lost one of its own on October 20, 2015. 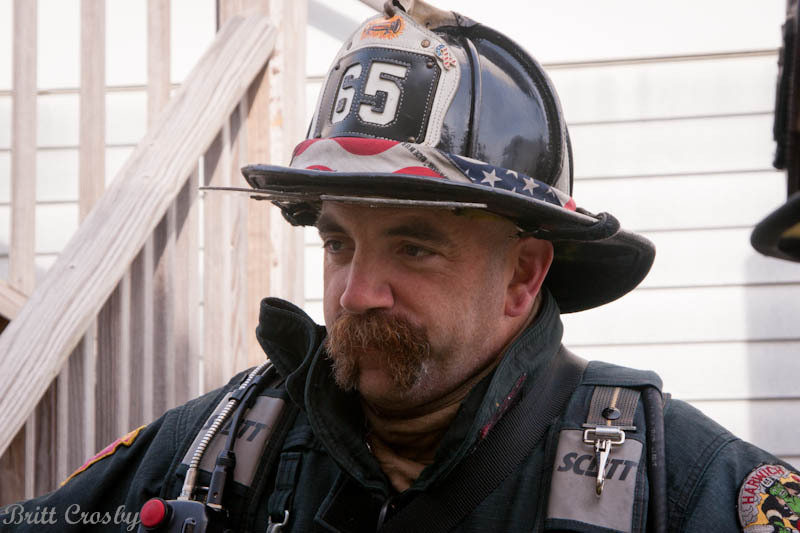 Plymouth Firefighter Anthony Colarusso, age 39, passed from a battle with esophageal cancer. He was a US Navy vet, who joined the fire department after serving his country. 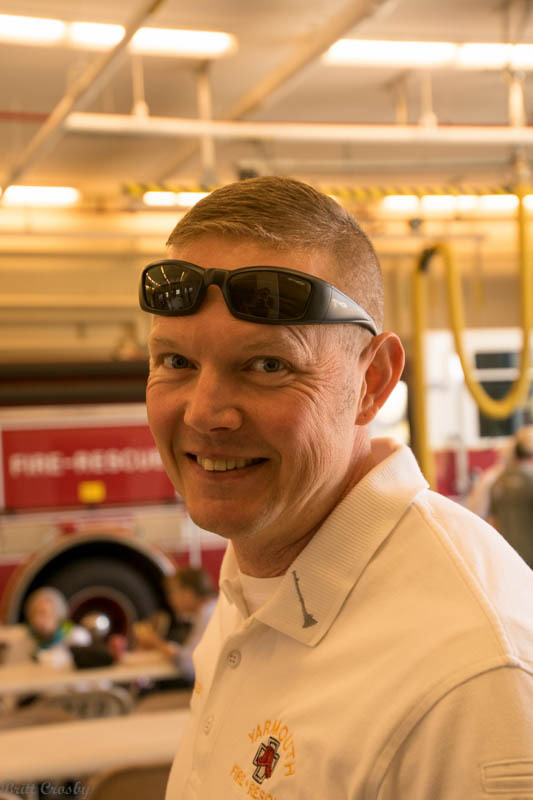 He served Plymouth 8 years as a Firefighter, rescue diver, instructor, and leader. He was a member of Plymouth IAFF 1768. 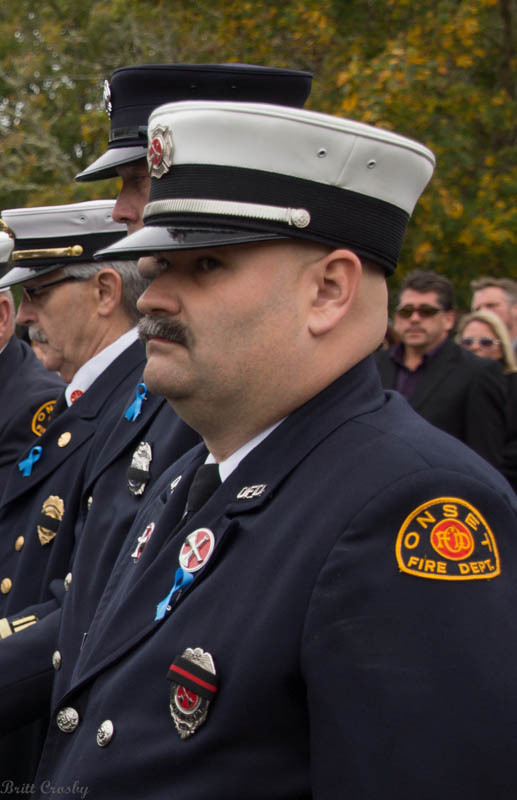 Rochester FD regrets to announce the passing of FF/EMT Steven Faustino, age 40, on October8, 2015. He served the Town of Rochester for 25 years. He passed away from cancer. Congrats to Louis Sassone promoted to Lieutenant. Also to acting Lt Gordon Williams. Note: Lt Jason Davern will continue to serve as EMS Officer. Congratulations to Brian Morrison, promoted to Captain of Group 2. He has been a member of the department for many years and previously served as a Lieutenant. He replaces Capt Paul Rhude who became the new Nantucket Fire Chief this summer. Jason Davern was promoted to Lieutenant replacing the position created when Capt Morrison was promoted. Davern served as the COMM EMS Officer. 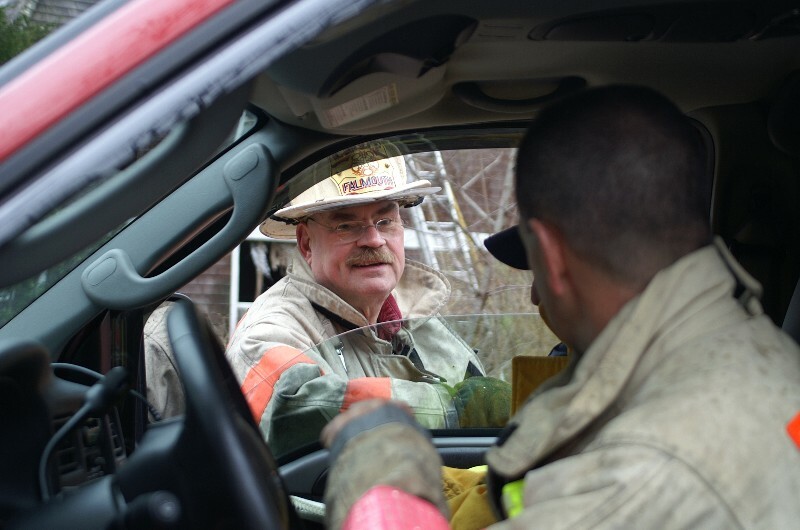 Falmouth Fire Chief Mark Sullivan has been in the fire service for 40 years, serving as Falmouth FD's Chief since 2010. Prior to serving as chief he had been a paramedic, Lieutenant, and Deputy Chief. 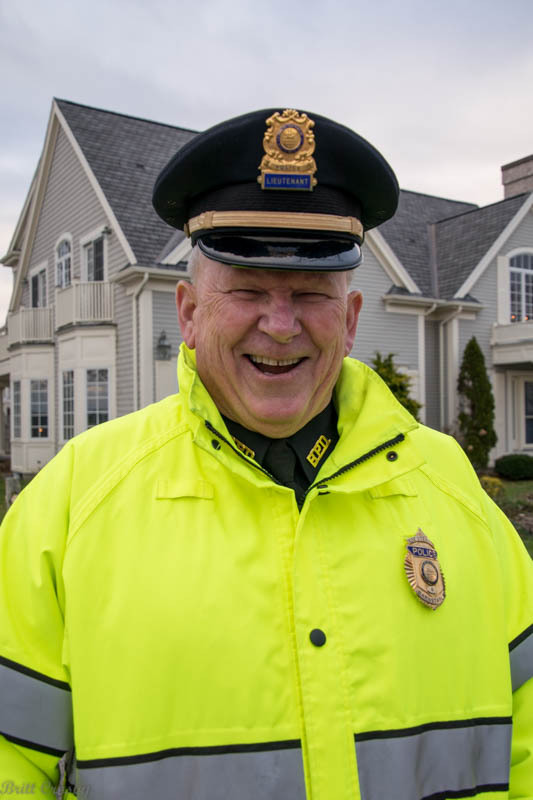 Chief Sullivan plans to retire in January 2016. 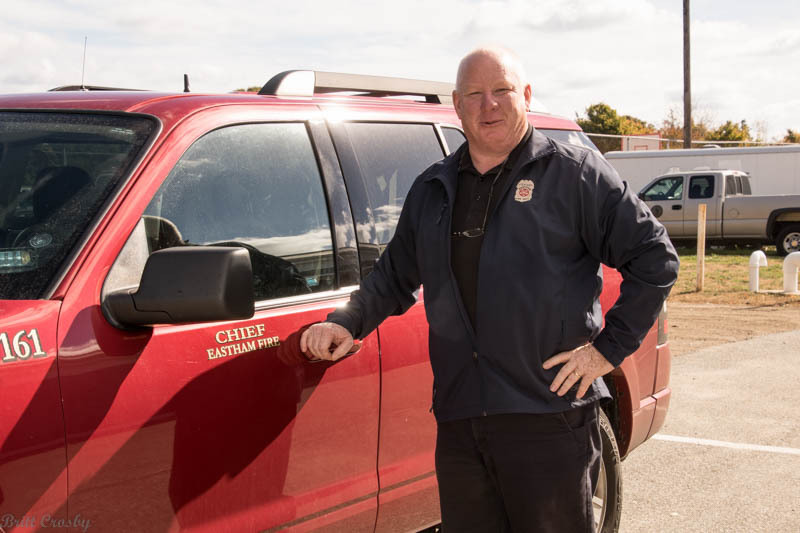 Truro Fire Chief Brian Davis will retire soon and the Town of Truro has selected an interim Fire Chief to take over for Davis. 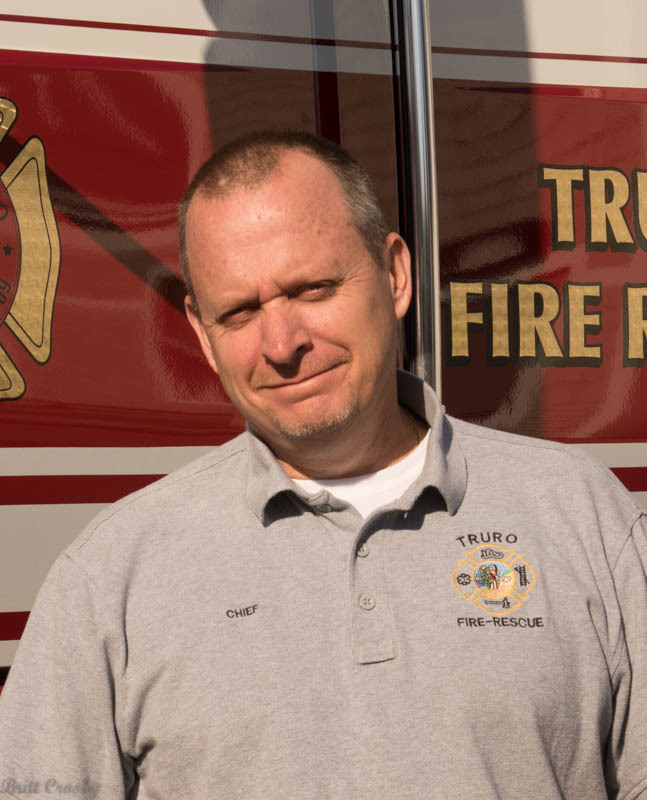 Tim Collins, a Lakeville Lieutenant/Paramedic will become the Truro Chief. FF Tim Tobin has retired after 34 years with the Dennis FD. Congrats! 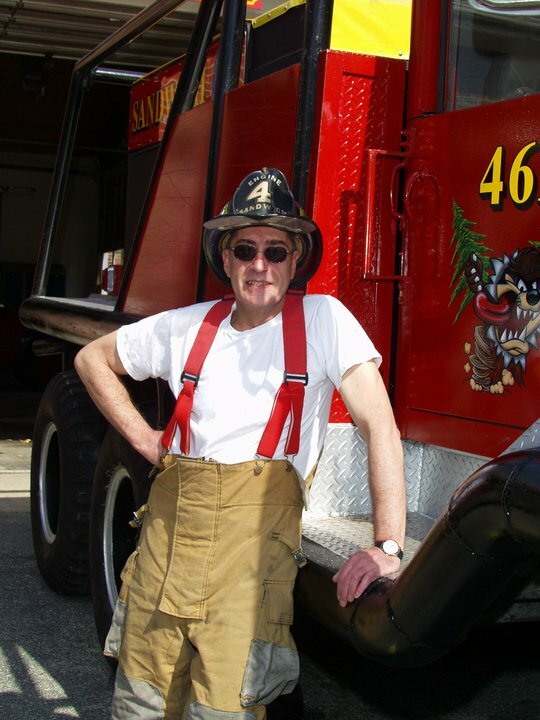 Falmouth FD regrets to announce the passing of retired Falmouth Firefighter Robert Marshall on Aug 16, 2015 at age 82. He joined the Falmouth FD as a 14 year old Jr FF in the early 50's and became a fulltime firefighter in 1955, working 33 years until his retirement in 1988. He was the father of recently retired Captain James Marshall. 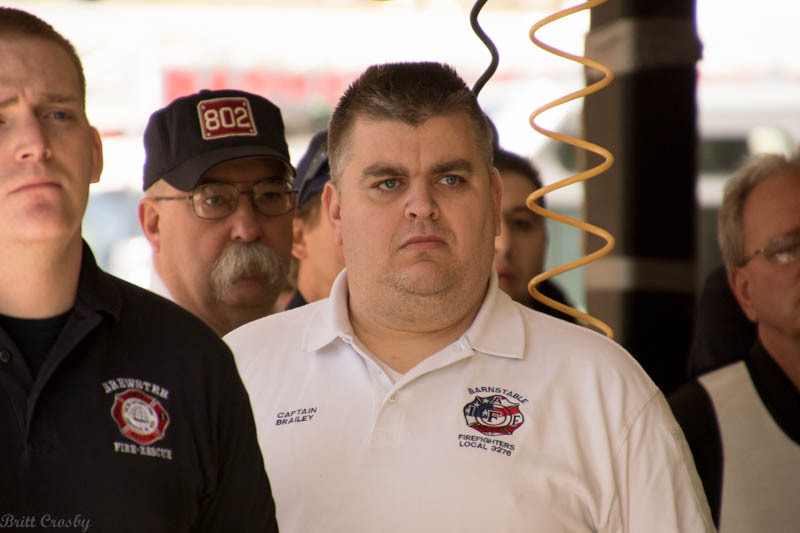 Firefighter Rick Gallo retired in July 2015. Wellfleet Firefighter / Paramedic James Willis retired effective July 1, 2015 after 24 years of service with Wellfleet FD. Congrats! With the recent retirements of Lt Richard Knowlton and FF Richard McCormack, there have been several promotions and hirings. Captain William Rex has moved from Shift D to Fire Prevention. Lt. Thomas Kenney has been promoted to the departments new Training Captain. 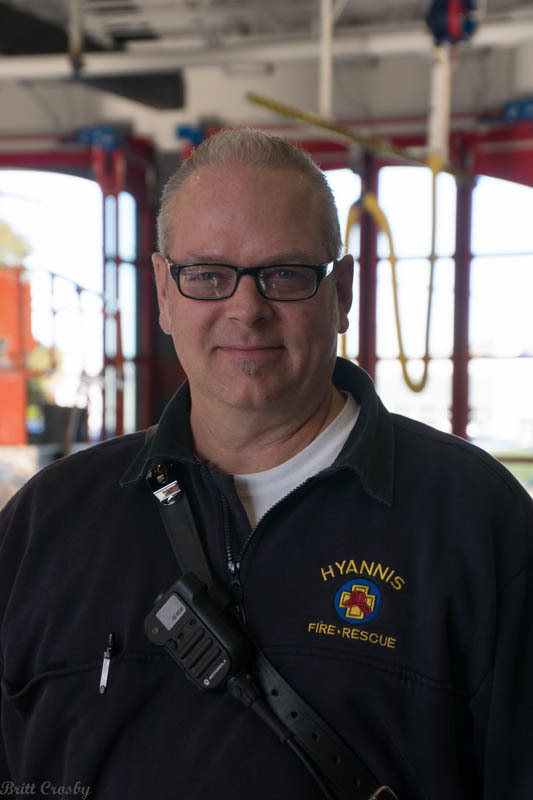 Hyannis hired former Plymouth FD Mechanic Ronald Buscemi as the new Dept Master Mechanic. 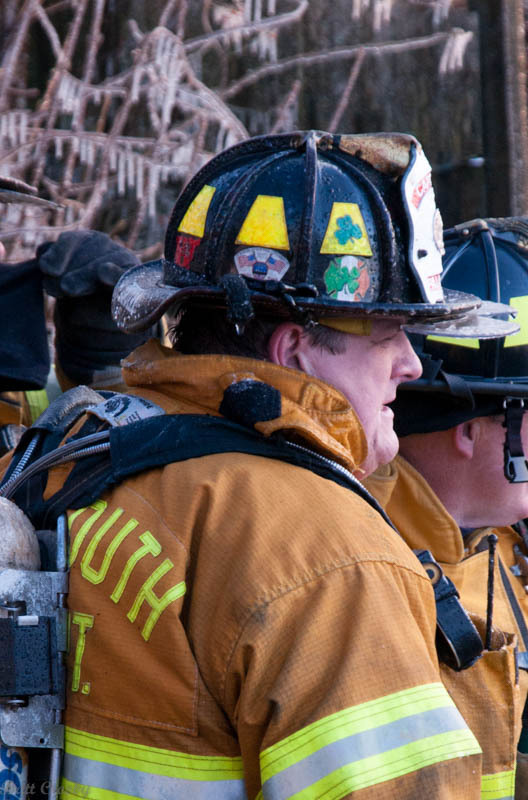 Several new firefighters were hired to replace those who retired or were promoted. The Town of Marion appointed Brian Jackvony as the new Fire Chief replacing retired Fire Chief Thomas Joyce in July 2015. 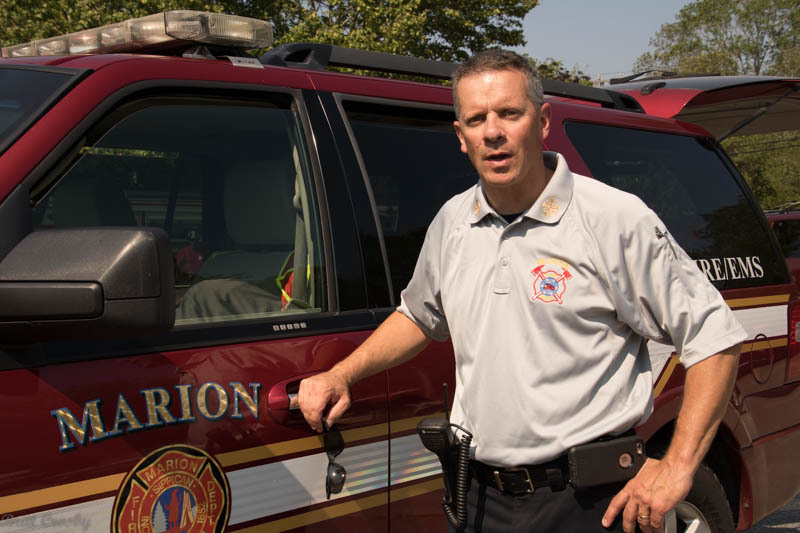 Chief Jackvony is a veteran firefighter with 24 years on the Providence FD, serving as a Captain, and as an Assistant Chief with the Cumberland RI FD for 8 years prior to coming to Marion. Congrats! 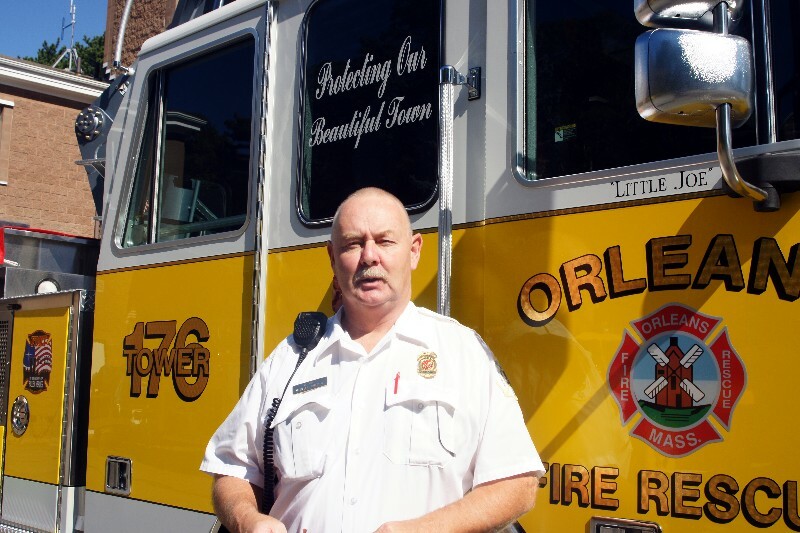 Fire Chief Mark Foley has announced his intention to retire in the Fall 2015. 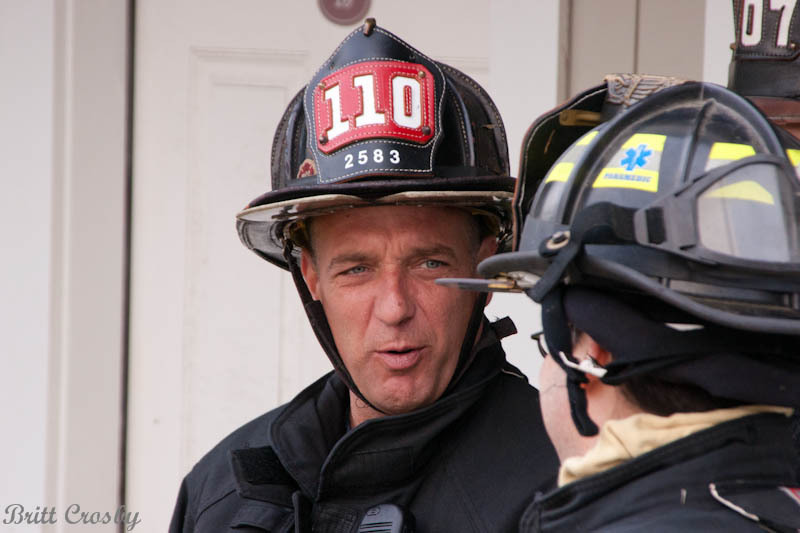 COMM FD Capt Paul Rhude has been selected to replace retiring Nantucket Fire Chief Mark McDougall. 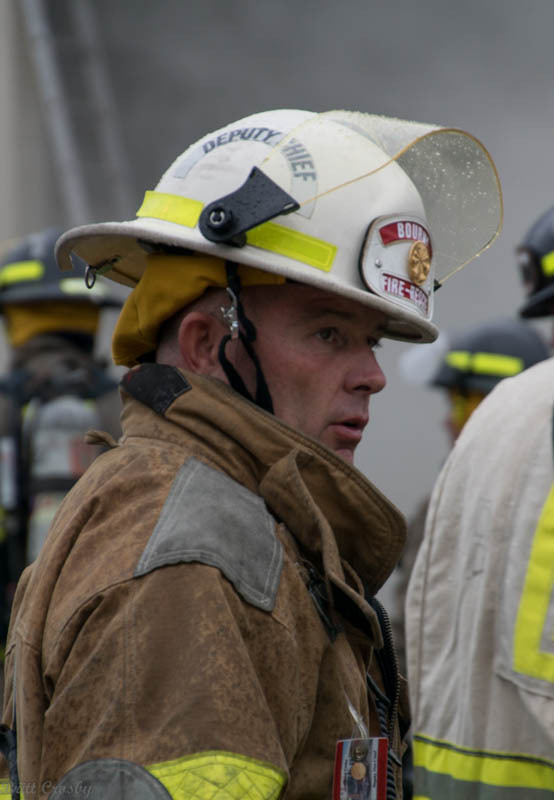 McDougall is a 25 year member of NFD, serving the last 9 years as chief. Rhude is a Captain on COMM FD, and previously served as a Lieutenant. 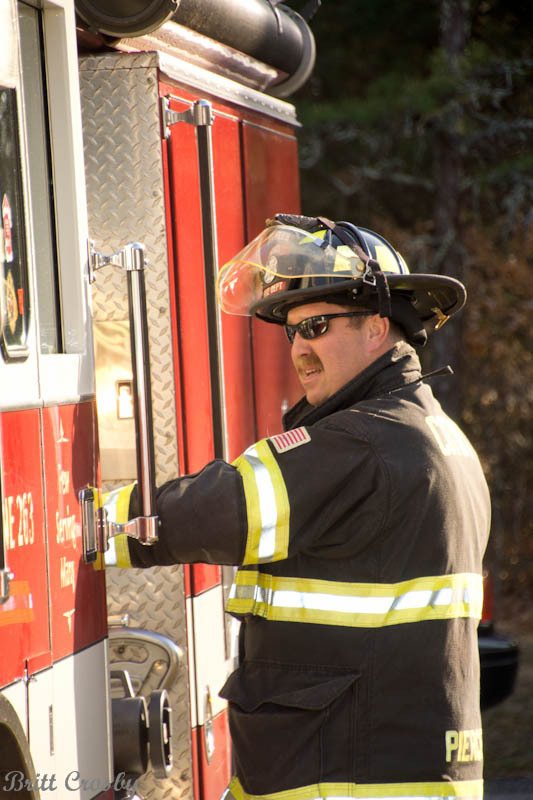 He began his fire service career in Cotuit, then Mashpee, prior to joining COMM. Congrats Paul! 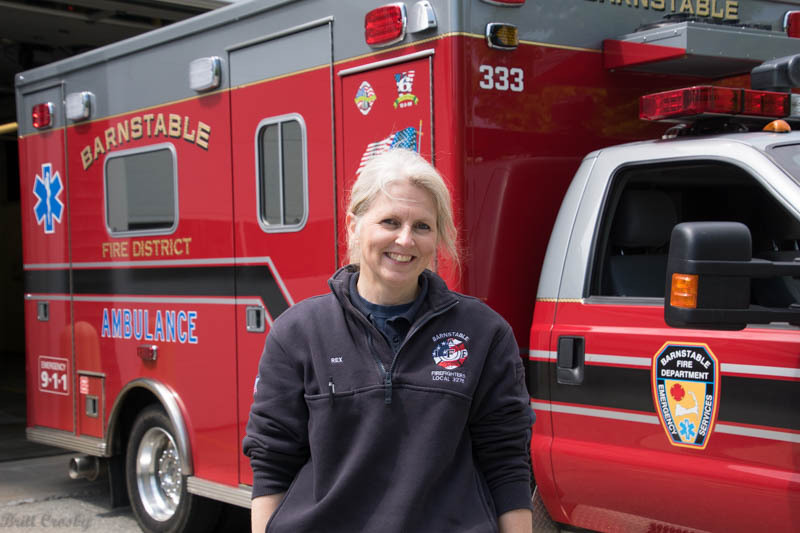 Long time Paramedic with Lower Cape Ambulance Brandy Powers-Tarala recently retired from LCA to return to her hometown Spokane, Washington. She was very active in the Cape EMS and will be missed. Best wishes Brandy! Sandwich FD regrets to announce the passing of long time retired Fire Chief Ferdinand Louis "Freddie" Alvezi, age 88, one June 2, 2015. Chief Alvezi was the first full time fire chief in Sandwich serving 25 years as Chief from 1965-1989. He was also a WWII Navy veteran. Visiting: Friday June 5, 2015 from 4:00 PM to 8:00 PM at the Nickerson Bourne Funeral Home, 154 Route 6A, Sandwich. Funeral Mass at the Corpus Christi Parish, 234 Quaker Meetinghouse Road, East Sandwich on Saturday June 6, 2015 at 10:30 hours. Internment at the Sandwich Town Cemetery on Route 130 will follow. After almost forever, the familiar voices of Britt & Robyn Crosby will no longer be routinely heard over the air as dispatchers for the Barnstable County Sheriff's Department Communications Center which dispatches for 10 of the Cape Cod Fire Departments, as well as Barnstable County Control, Barnstable CMED, and the forever loved KCB 781 and KCA 376. Robyn started out with BSO in the mid 1980s, leaving for about 21 (kid) years, and returning in 2008 for the past 7 or so years on a part time basis. She also served 28 years as a fulltime dispatcher at COMM FD from 1982 until retiring in 2011. 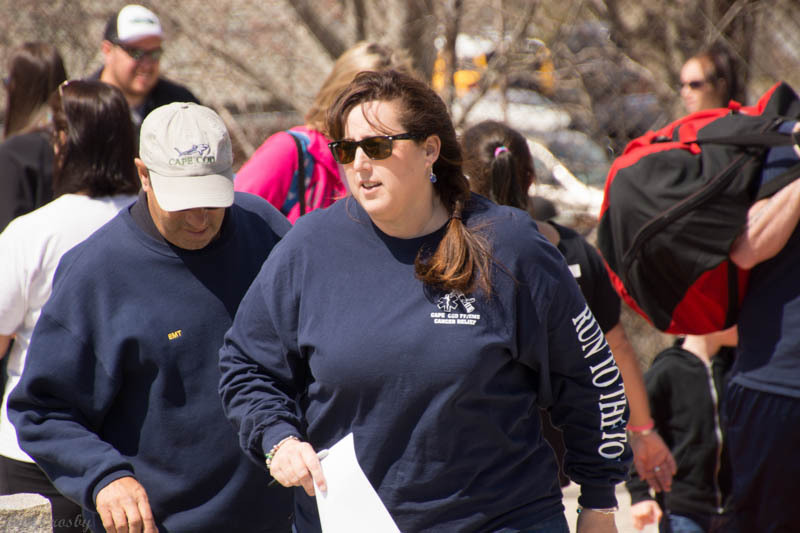 During her career in public safety communications over 33 years, she worked during some of the largest incidents including PTown Whalers Wharf and the Crosby Yacht Yard fire. She was also recognized as Tele-Communicator of the year by the region and state. 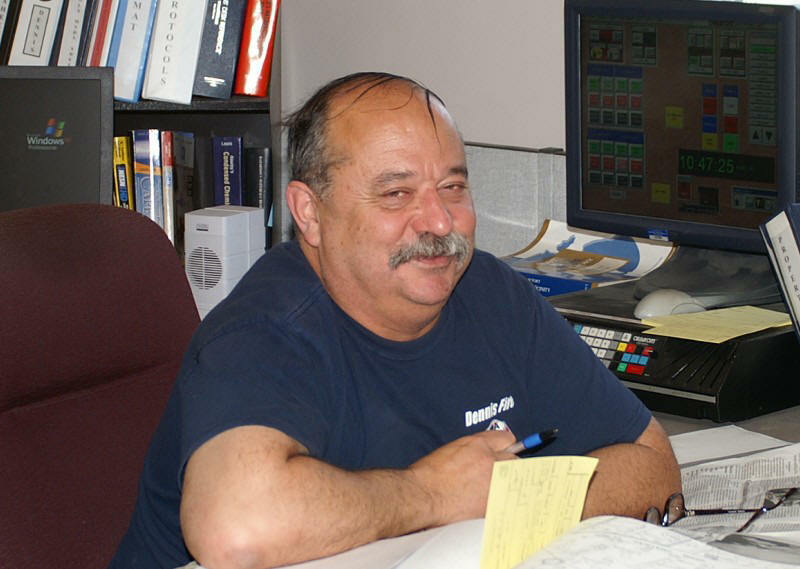 Britt began in 1987 and completed 27 years as a per diem Spare dispatcher full-filling a dream dating back to his first scanner days in the early 1970s. His almost 40 years of public service also included 35 years at COMM FD. 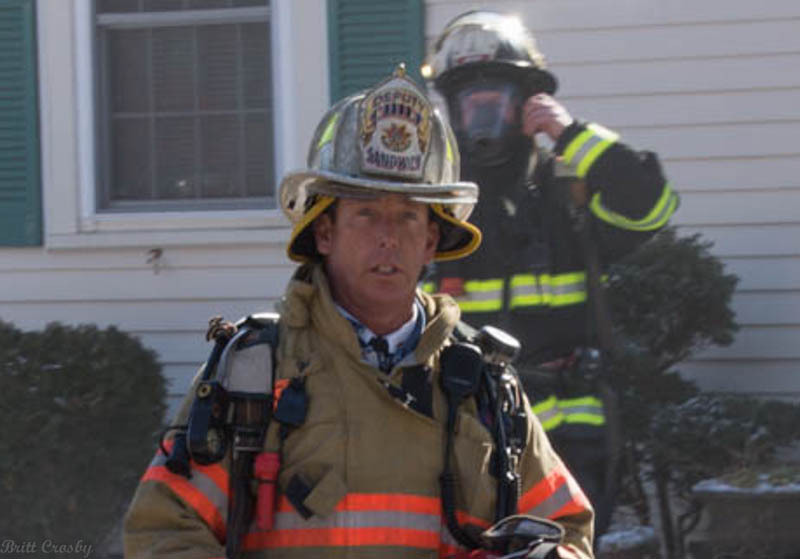 Eastham FD regrets to announce the passing of Retired Captain Brian Edmunds, age 57, on April 1, 2015. 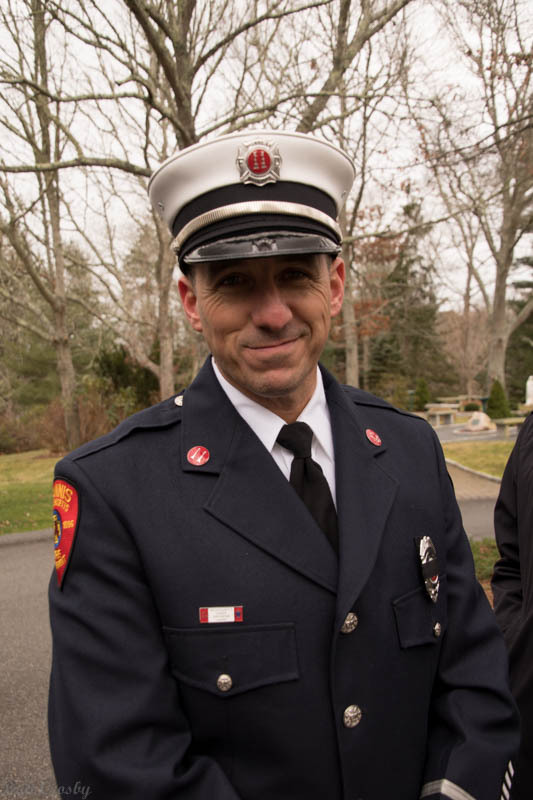 Capt Edmunds was a 34 year member of Eastham FD, a founding member and President of Local 2975, and father of Orleans FD Firefighter Doug Edmunds. Visiting hours will be held at Nickerson Funeral Home, 77 Eldredge Parkway, Orleans on Friday, April 10 from 5 to 7 pm. Services Mass on April 11th, from 9 to 10 AM. at United Methodist Church of Orleans, 73 main St, Orleans with a reception to follow at Elks Mckoy road Eastham. 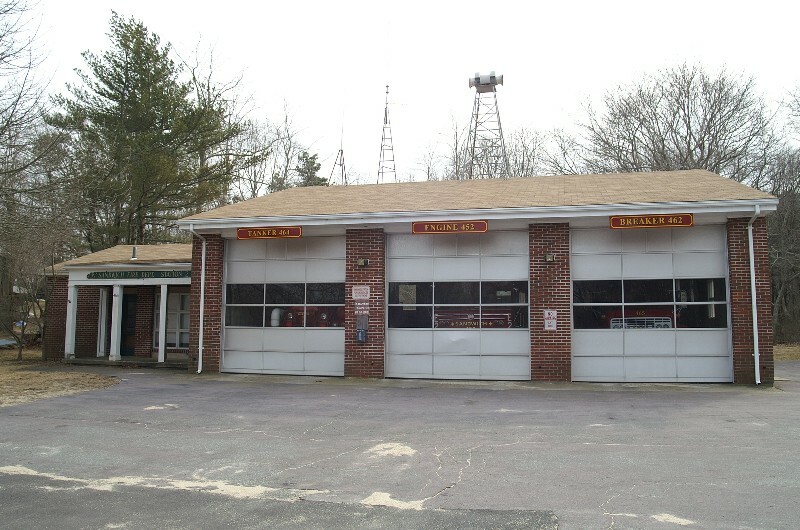 The Sandwich FD will not be housing an engine at the East Sandwich Station 2. The department recently purchased a new Engine-Tanker to replace the engine housed at that station. There are only a few members living in that part of town and the station remains unstaffed despite years of attempts to add personnel to open it. 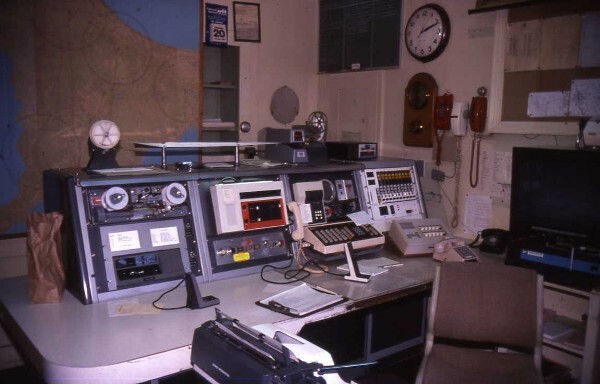 The station was never designed to house personnel and has served as a call station only since built in the early 1970s. The new engine will be housed at the main station down town. A brush truck and tanker will remain in the station on Route 6A. March 2015. 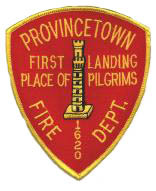 Provincetown FD regrets to announce the passing of long time PFD Fire and Rescue Squad member Ronald "Ronnie" White at age 81 on March 16, 2015. A lifelong resident of Ptown and career electrician, he joined the PFD in 1956 and remained a member until his passing. He was one of the original EMTs on Cape Cod and was a graduate of CIEMSS Paramedic Class I in the mid 1970s. 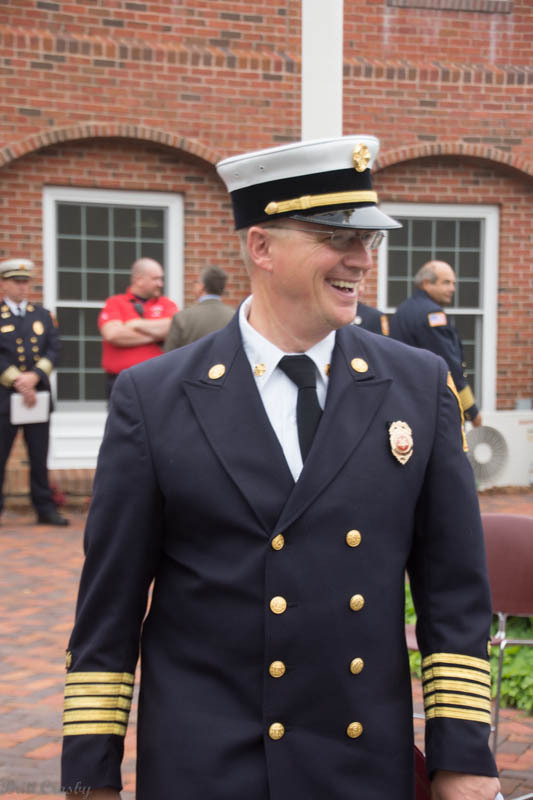 He most recently served as Fire Rescue District Chief, having previously served as 18 year Captain of the Rescue Squad and Captain of Engine No. 1. Captain James Marshall has retired from the Falmouth FD with 30 years of service. Also in Falmouth, FF Ralph Moniz Jr retired with 32 years of service and FF Kevin Kelly retired with 20 years of service. Hyannis has promoted Lt Mark Storie to Captain of Group 2 replacing retired Capt Craig Farrenkopf. Hyannis also promoted FF Brian Lawrence to Lieutenant. 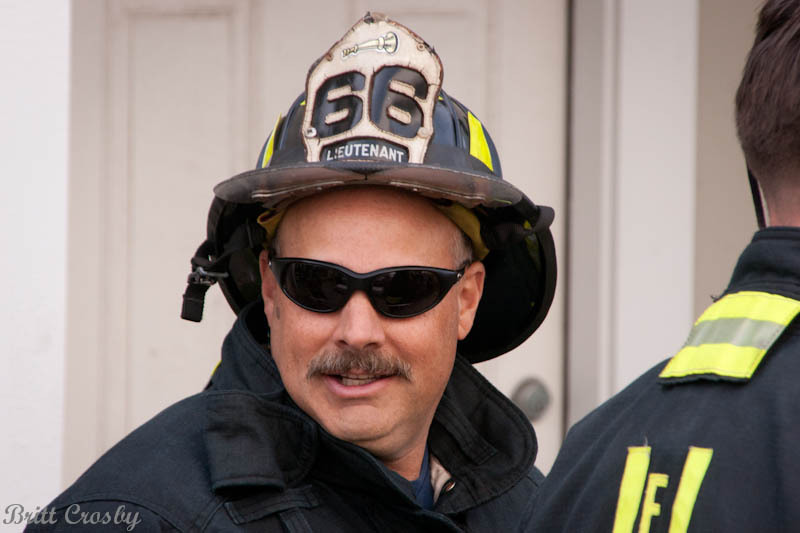 Lieutenant John Tavares is retiring after some 35 years as a member of the COMM FD as of December 29, 2014. 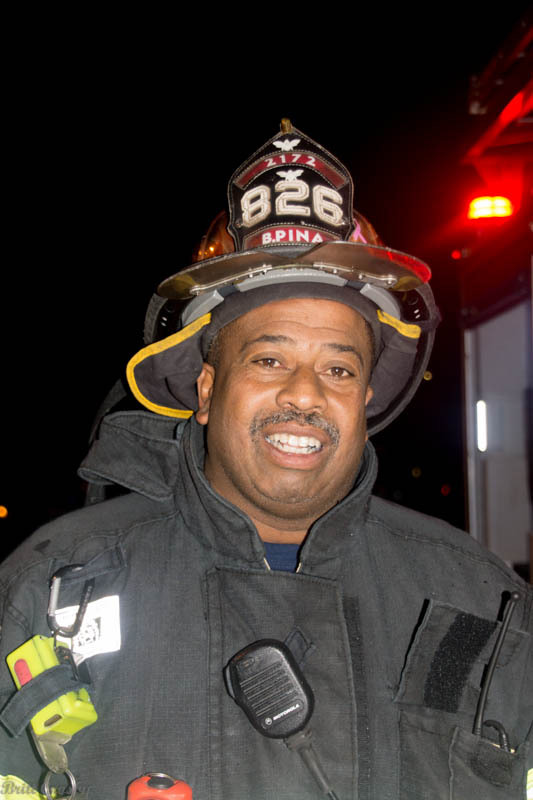 Lt Tavares served as a call member, fulltime dispatcher, fulltime firefighter, paramedic, and Lieutenant for many years. Best wishes John and Congrats! COMM Firefighter Gary Johnson is also retiring after many years. Captain Don LaBonte has retired after 30 years of service. 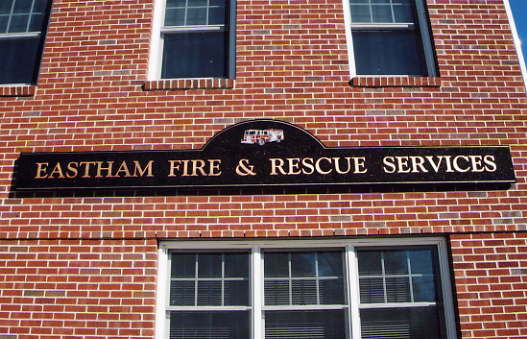 The Chatham Fire Department has moved out of their long time Depot Street station and into temporary quarters at the Chatham DPW on Crowell Road. The construction of a new station is expected to take about 18 months. Thomas Burchell has been promoted to Captain of Group 4. "TJ" has been a member of the COMM FD for many years, serving as a Lieutenant and paramedic. He previously was a member of the Hyannis FD. He replaces retired Captain Brady Rogers. Enrique Arrascue has been promoted to Lieutenant, replacing Lt Burchell. Arrascue is also a paramedic and a former Yarmouth FD member. Retired COMM FD Senior Private Horace Manley "Gus" Crosby III passed away on September 19, 2014. He was 73. Gus was the first permanent fireman in Osterville in 1966. He was a founding member of IAFF Local 2346 and a beloved member of the department for 33 years. 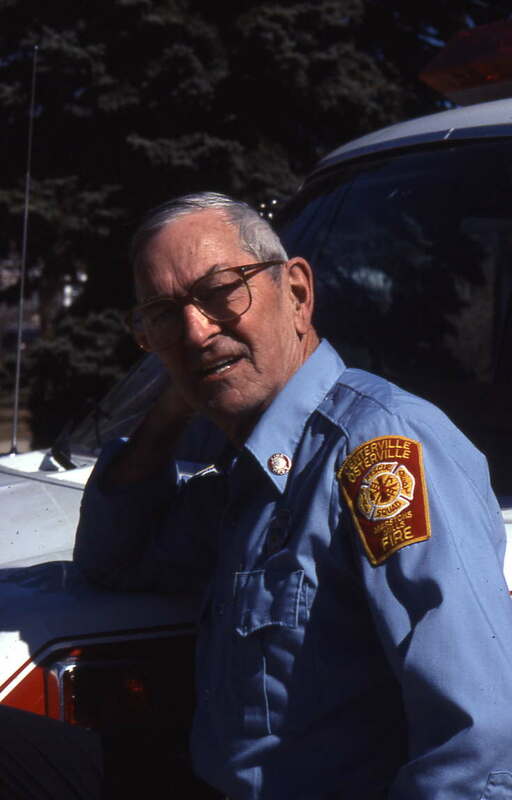 Retired Aquinnah Fire Chief Walter E Delaney passed away at age 84 on August 24, 2014. He served as the town's fire chief from 1994 to 2011. 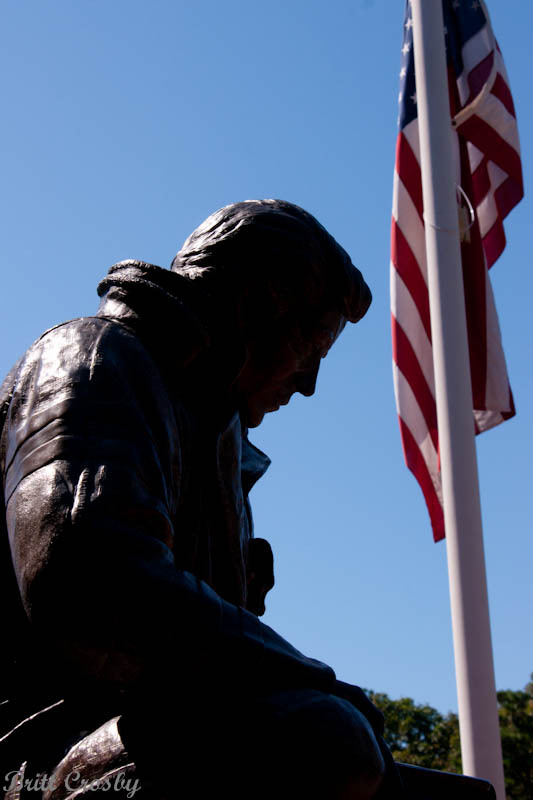 The Dennis FD will be dedicating a 9/11 Memorial in front of the Fire Headquarters at 0900 on September 11, 2014. All are invited to attend. Peter Halliday has been promoted to Lieutenant. Congrats! Captain D "Brady" Rogers has announced his pending retirement. He joined COMM FD in the late 1970s, was one of the original COMM fulltime dispatchers, a paramedic, Lieutenant, and Captain for a number of years. 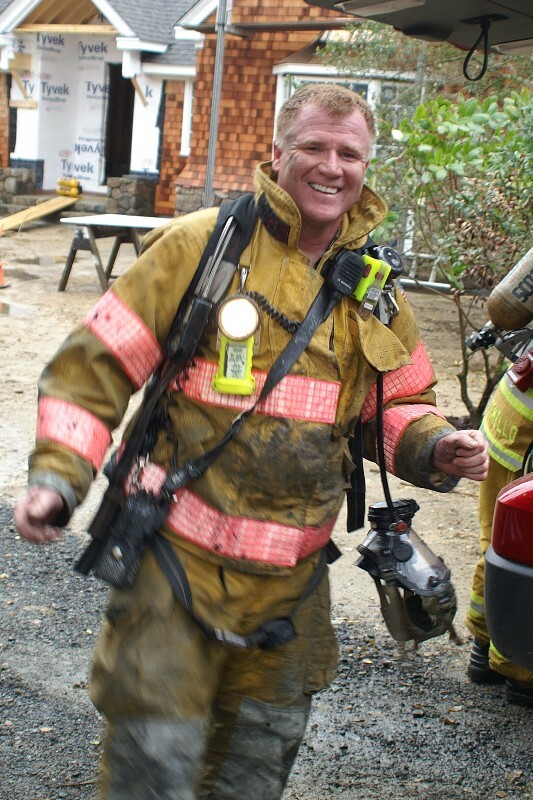 He also served the Cotuit FD briefly as their first fulltime firefighter in the 1980s. Paramedic Jason Davern was promoted to EMS at COMM FD in the Spring of 2014. He replaced retired EMS Officer LT Rick Scherbarth. 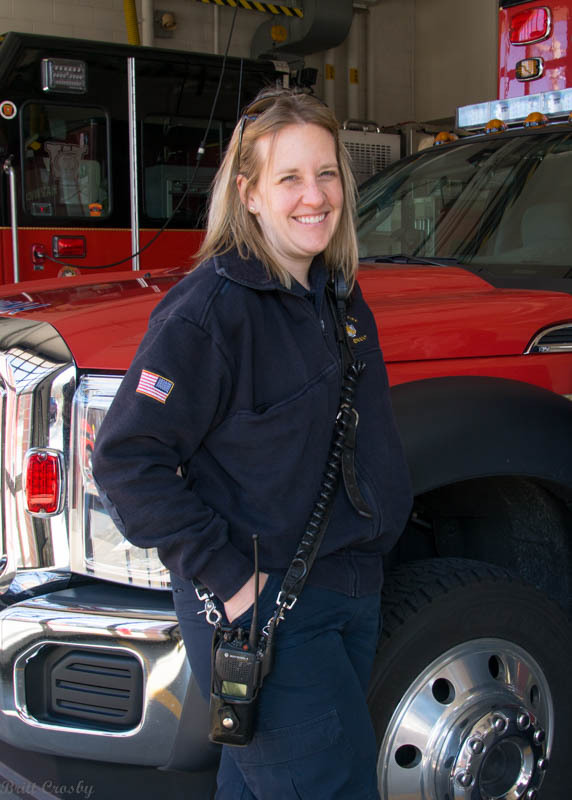 Congrats to Leighanne Deering who became the Harwich Fire Department's first female Lieutenant in July 2014. She is a long time member of HFD and is a paramedic. Mashpee FD recently promoted Joseph Peltier to Captain of Group 2. He has served as a Lieutenant for a number of years. Mashpee also promoted Nicole Stanley to Lieutenant. 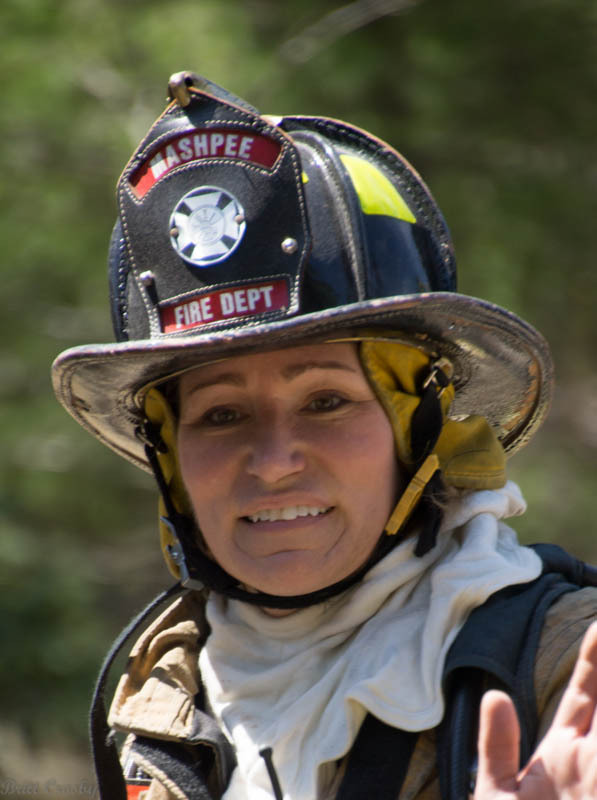 She becomes the first female Lieutenant in the Mashpee FD. She has been a firefighter/paramedic with MFD for many tears. 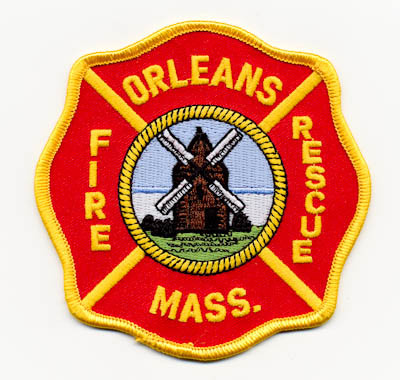 Orleans FD promoted Timothy Gula to Captain of Group 1 in July 2014. Orleans also promoted 4 senior privates: Joseph Lang, Douglas Edmonds, Thomas Pelegrino, and Wayne Robillard. Congrats to all! 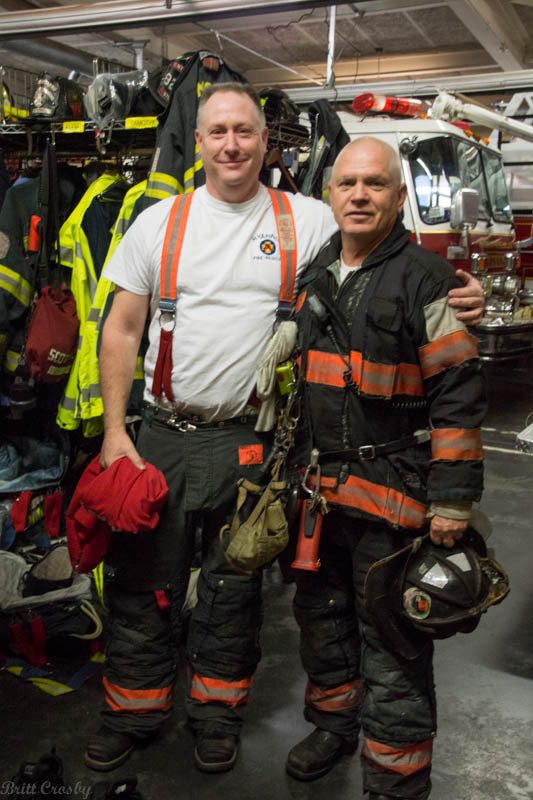 Long time Eastham FD Captain Steve Burns retired in July 2014! William Piltzecker was promoted to Captain of Group 1. Congrats and best wishes to both! 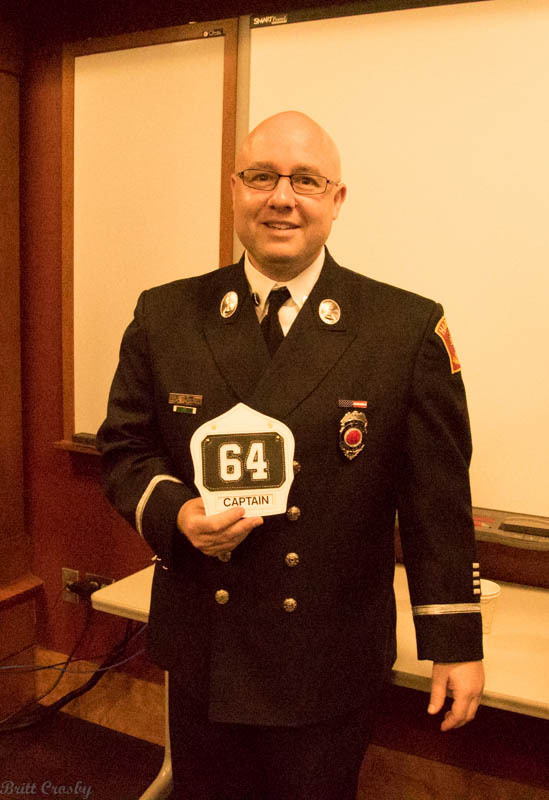 Chatham promoted Mark Higgins to Captain of Group 2 in 2013 after the retirement of Capt Kate Hansen. Higgins was previously a Lieutenant. R J Sylvester was then promoted to Lieutenant. 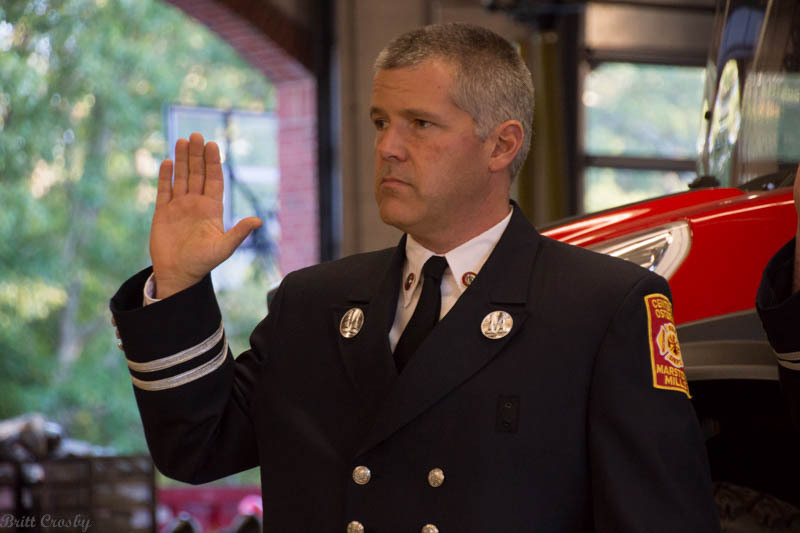 Congratulations to former Lt. Jason Viveiros who has been selected as the new Fire Chief in the Town of Halifax, MA. He will replace former Halifax chief William Carrico II who interestingly vacated that position to become the chief in Sandwich! 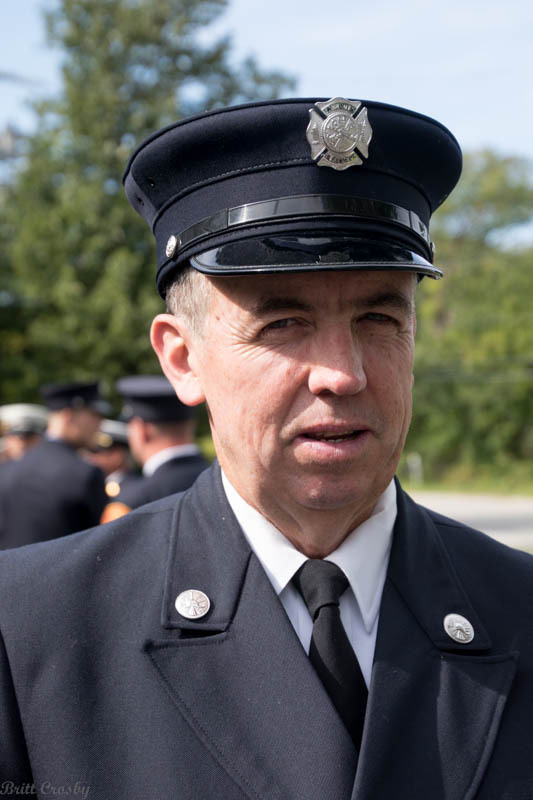 Longtime Lieutenant Richard Lizzotte retired from Sandwich FD in July 2014. Congrats and best wishes! Tammy Pimental has been promoted to Lieutenant. She is the first female to hold the position in Sandwich. Congrats. Dan Keane has been promoted to Fire Prevention Officer replacing JJ Burke who was recently promoted to Deputy Chief. 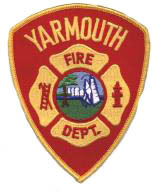 A number of personnel changes have taken place in Yarmouth. Lt Patrick Fontaine is the EMS Officer. 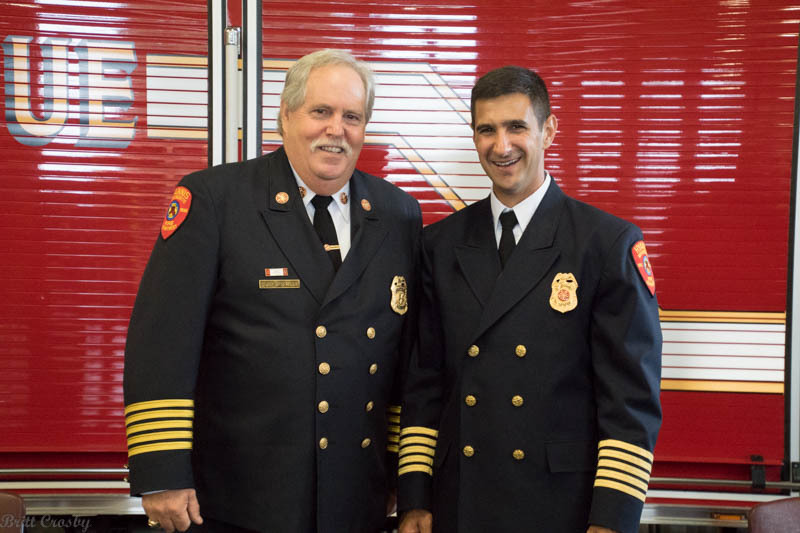 Both Acting Fire Chief Philip Simonian and Acting Deputy Jon Sawyer continue to await permanent appointments pending the official retirement of previous chief Michael Walker. Retired Lt Ronald l. Alexander passed away in August 2014. He was a member of Eastham FD and served as the fire inspector as well as being Eastham's first paramedic. 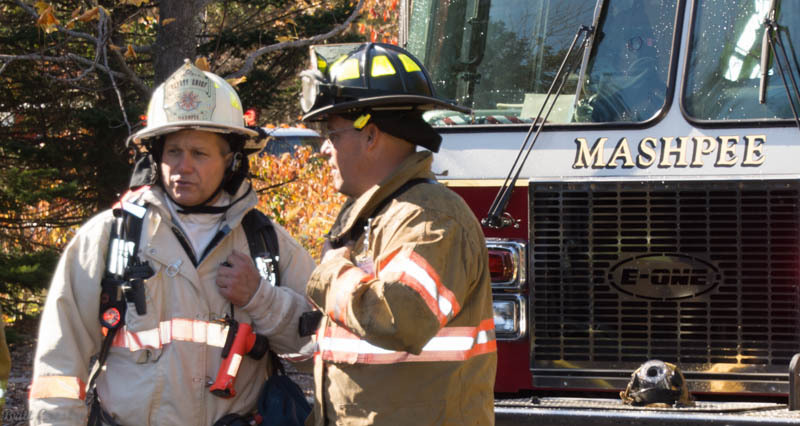 Mashpee made it official in March 2014 when Acting Chief Thomas Rullo was made the fulltime Fire Chief. Chief Rullo had served as Deputy since 2012. Prior to coming to the Cape he served in Florida. He replaced retired chief George baker. Jack Phelan was promoted to Deputy Chief in May 2014. Phelan has been a Captain and paramedic for many years with the Mashpee FD. After over 117 years as a combination call and fulltime fire department, the Falmouth Fire Rescue has retired the last 3 call personnel and become a 100% paid department as of June 2014. The distinction of being the last standing members of the call department goes to Doug Martin, Richard "Doc" Henry, and Joe Kelley who were presented with gold badges and plaques in June 2014. Oak Bluffs was approved for a new fire headquarters in a recent town meeting. The plan is to move all apparatus from the current station to the town's DPW facility in the fall 2014. The present station will be torn down and the lot prepared for construction to begin on a new facility which is expected to take about 15 months to occupy. June 2014. 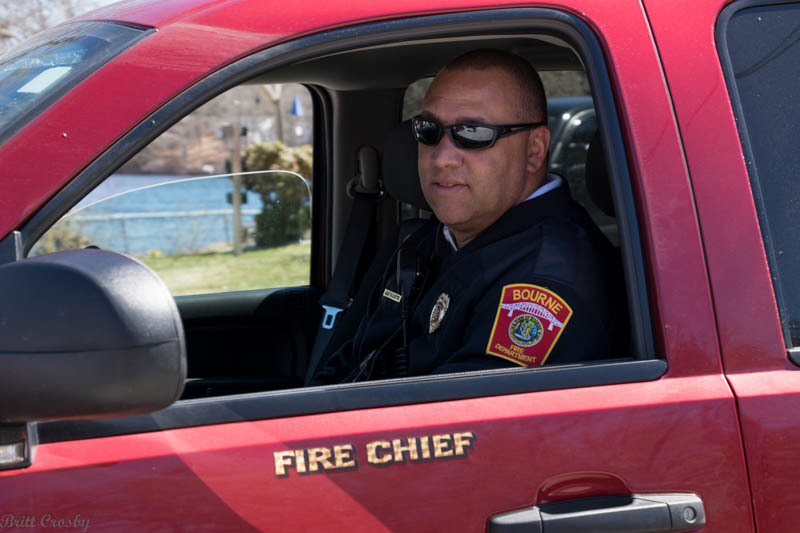 John Rose was promoted to fulltime Fire Chief of Oak Bluffs in May 2014. 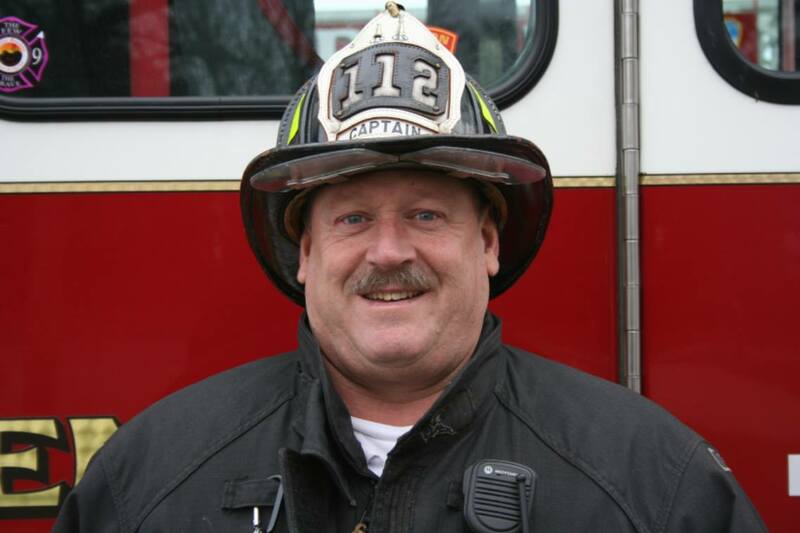 Active duty Firefighter John E. "Jack" Thomas passed away April 27, 2014 at age 56. 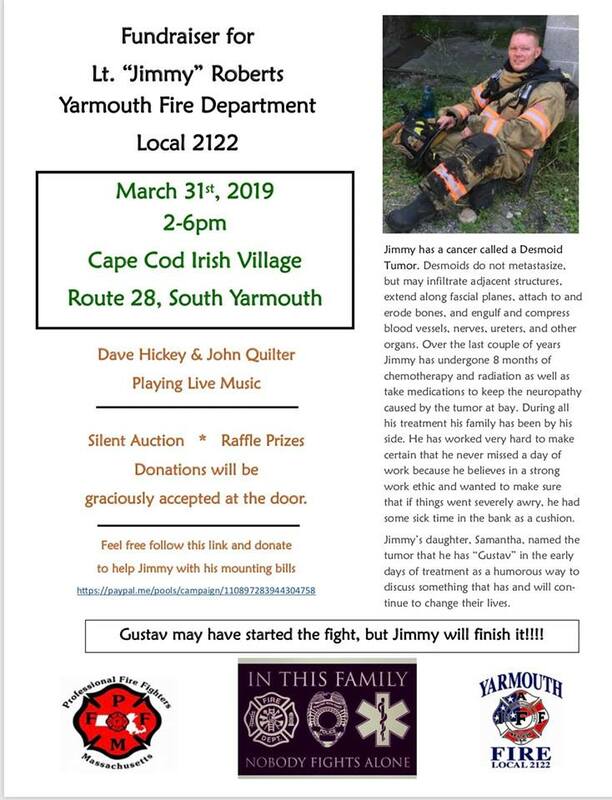 He served the Duxbury FD for 28 years as a Firefighter/EMT and member of Duxbury Local 2167. The Plymouth Police Department regrets to announce the Line of Duty Death of Police Officer Gregg Maloney on April 1, 2014. He was a motorcycle officer and member of the Plymouth PD for 17 years. Wake: Monday April 7, 2014 Cartmell's Funeral Home, 83 Court St, Plymouth 3:00 PM to 8:00 PM. Funeral: Tuesday April 8, 2014 St Peters Church, 84 Court St, Plymouth, 11:00 AM. Thousands of firefighters from around the world, including hundreds from the Cape area attended the wakes and funerals of two Boston firefighters killed in the line of duty at a 9 alarm fire at 298 Beacon Street in the Back Bay on March 26, 2014. Services for Lt Edward Walsh E33 were held in Watertown on April 2 & 3, and for FF Michael Kennedy L15 in West Roxbury April 3 & 4. Congratulations to Virginia B. "Ginny" Brodeur RN upon her retirement from the Falmouth Hospital Emergency Room. Ginny has been around the ER for nearly 40 years and will surely be missed by many she has helped over the years. Best wishes to her in retirement. April 2014. Timothy Smith has been promoted to Deputy Chief. Smith has been serving as Acting Deputy Chief for some time. Prior to that he served as Captain and Lieutenant. He is also a paramedic. Lt Scott Thrasher has been promoted to Captain of Shift 3. FF Ann Bartos has been promoted to Lieutenant on Group 4. 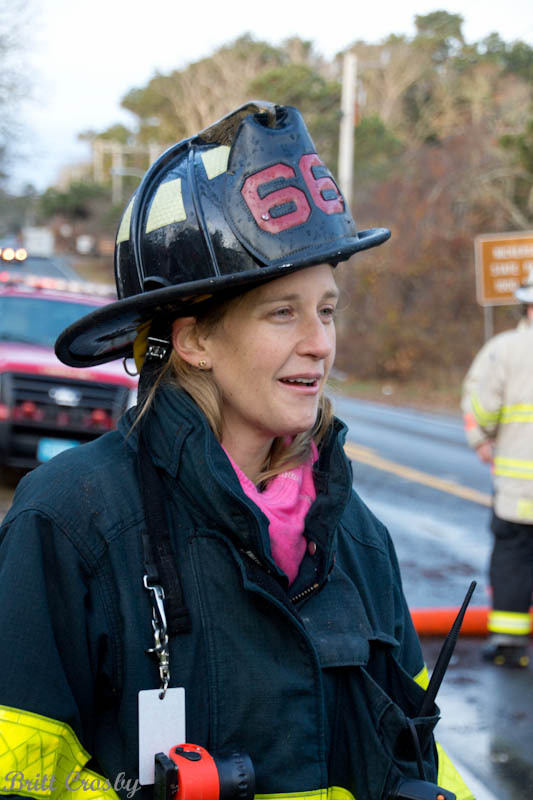 She becomes the first female to hold such rank in the Falmouth Fire Department. Lt Norman "Spanky" Sylvester was promoted to Fire Prevention Officer filling the position created by the retirement of Lt Don Chase in July 2013. Fire Prevention Officer John Cosmo was promoted to Lt FPO. FF Greg Dardia was promoted to Lieutenant. All of these promotions took place in recent months. Deputy Chief William Harrison has resigned according to local news. He reportedly had been investigated for alleged violations of town policies. He served as deputy since 2007 and was a 33 year member of the department. 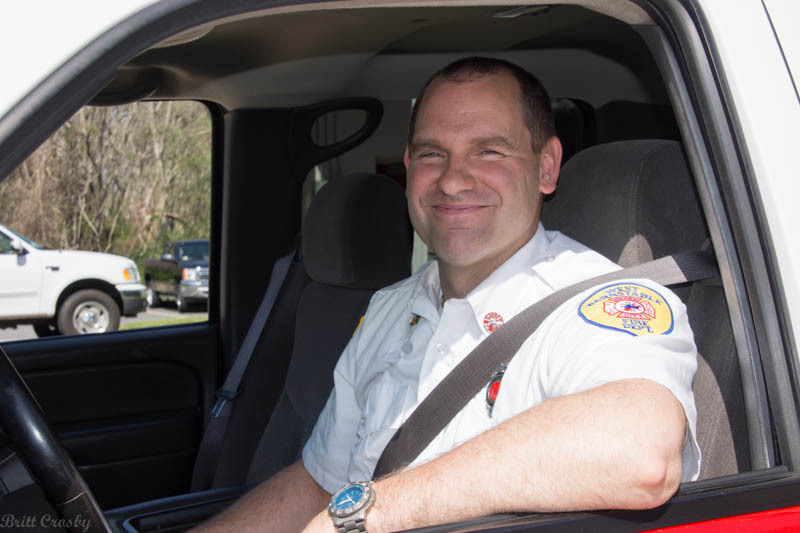 The new Sandwich Fire Chief William Carrico II began serving Sandwich in February 2014. Chief Carrico previously served as the Chief at Halifax Fire since 2009 and before that served as a Deputy Chief in Duxbury FD. He replaces Chief George Russell who recently retired. Welcome Chief. 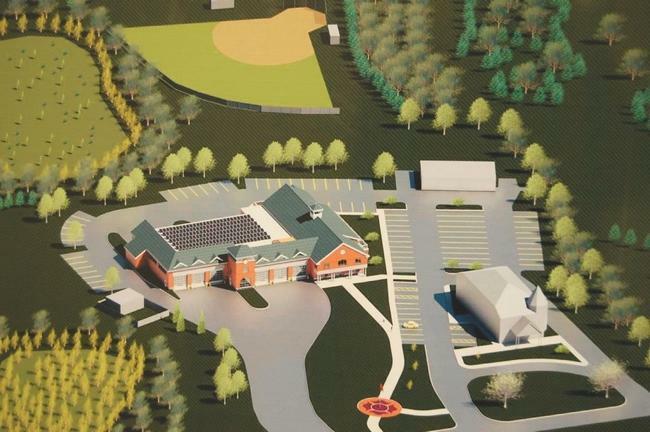 The Carver Fire Department has been approved for a new Central Fire Station. Captain Richard Farrenkopf will be retiring effective November 30, 2013 after 42 years in the fire service, 4 with Harwich and the past 38 with Dennis FD. He has been a Captain for the past 20 years and has been a Paramedic for over 30 years. Capt Farrenkopf's father was the Fire Chief in Hyannis during the 1980s. His brothers Craig and Eric are both Captains in Hyannis and his brother Kent is the Deputy Chief in Harwich. Best wishes to "Dickie" in his retirement! Lt Tony Kent will be promoted to Captain replacing Capt Farrenkopf effective Dec 1, 2013. He has been a member of the Dennis FD for 27 years, the past 13 as a Lieutenant. Congrats Tony! Firefighter Dan "Flippy" O'Connell has been promoted Lieutenant effective Dec 1, 2013. 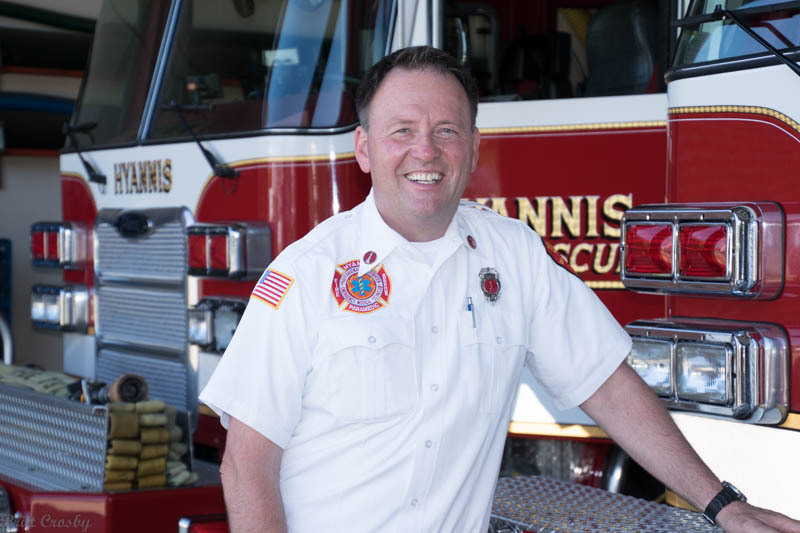 He has been a member of the Dennis FD for 17 years. Congrats and best wishes! There have been some changes at the Yarmouth FD. 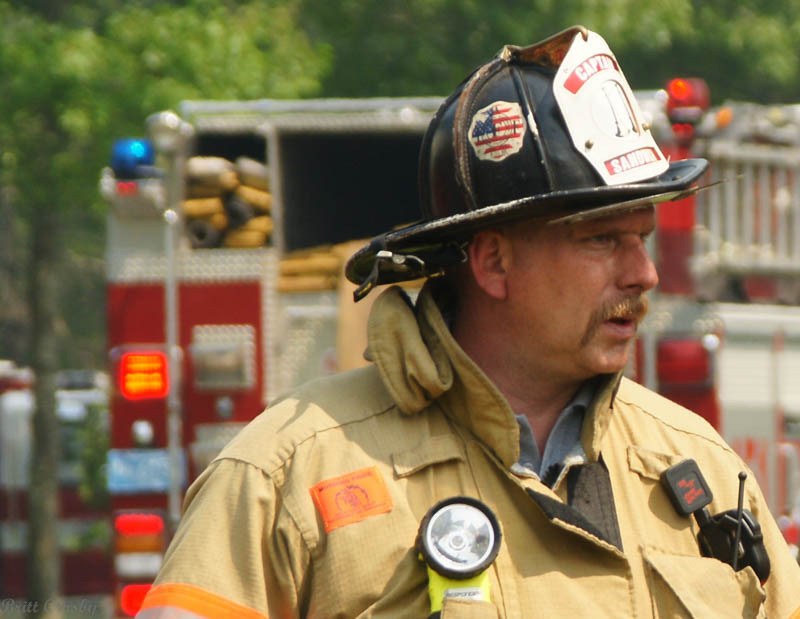 Retired Onset Fire Chief Howard B Andersen, age 58, passed away on October 4, 2013 after a long battle against cancer. 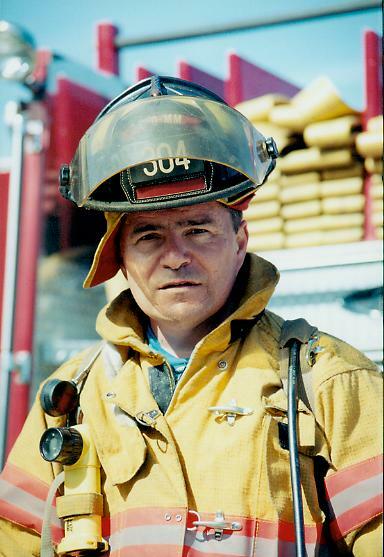 "Howie" joined the Onset FD at age 15 in 1970 and was a member for 43 years, serving as Chief for the past 16 years. He also served as a member of the Otis FD, Wareham FD, and DCR District 2. 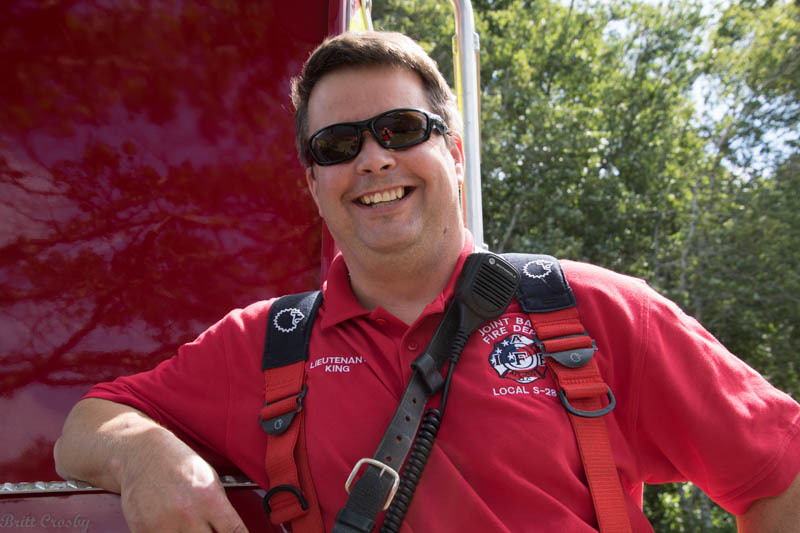 He was highly respected and will be missed not only by his family and the Onset FD, but by many others across the state who saw him as a leader, friend, and example of dedication to service. RIP Chief. Visiting hours will be on Friday October 11 and a Funeral on Saturday October 12, 2013. Deputy Phil Simonian has been made acting Fire Chief in the absence of Chief Walker. 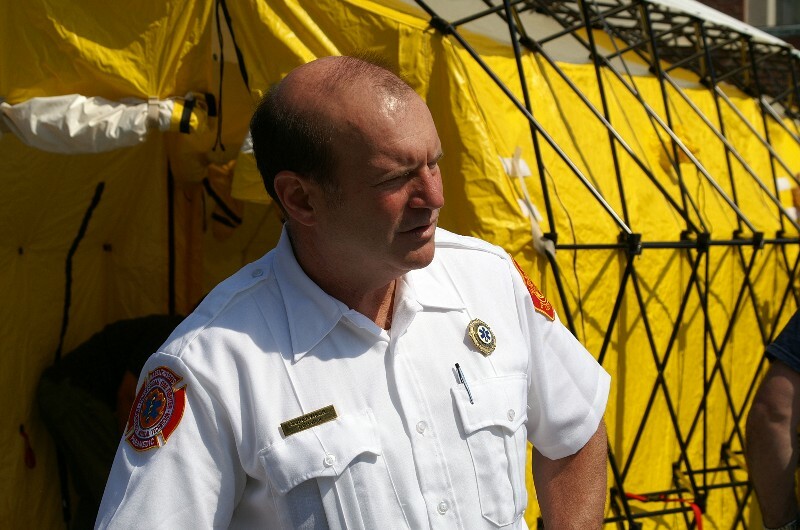 Onset Fire Chief Howard Anderson will retire Sept 8, 2013. A party will be held at the Elks in Wareham from 4-8 PM. Tickets $35. 43 Years of Service! Middleborough FD suffered the LODD loss of one of their own on July 22, 2013 when 50 year old FF David Brier passed away from an apparent heart attack. He was a 10 year veteran of MFD. Fire Chief Michael Walker is said to be retiring soon as well. 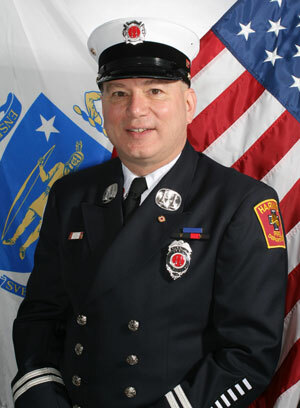 Fire Chief Glen Olson has announced his pending retirement in October 2013 as Chief of the Eastham FD. He will have 33+ years in fire service., 14 as Chief. Deputy Chief Phil Field Retired July 15, 2013 after 39 years with COMM FD. the last 3 as deputy. The new deputy Byron Eldridge, long time Captain was sworn in later that day. Congrats to both. 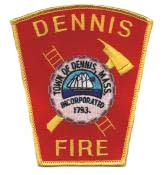 Dennis recently hired 4 additional firefighter/paramedics to enable the assignment of an ambulance at Dennis Station 2 on the north side of town starting this summer. Chief George Baker has announced his pending retirement Sept 20, 2013. Captain / Paramedic Kate Hanson retires effective July 2, 2013. New COMM Fire Chief Michael Winn took over from Chief Farrington June 28, 2013. Congratulations to Chief Winn and the COMM FD! 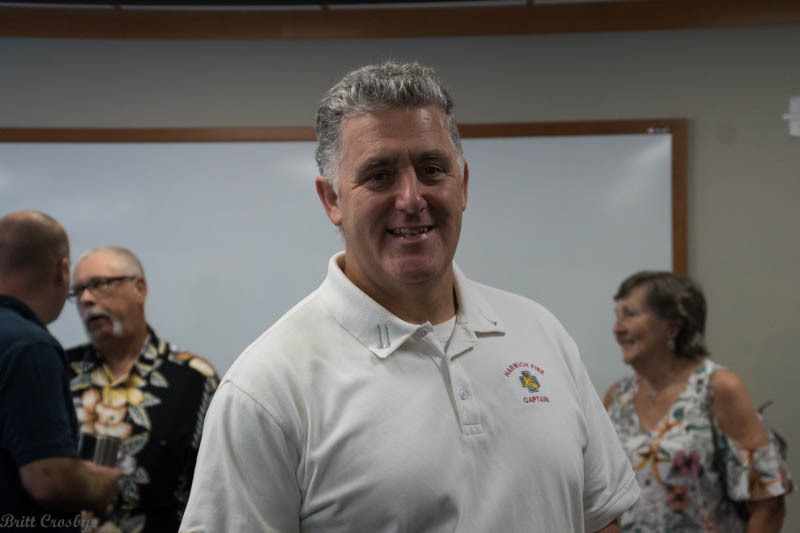 Chief John M Farrington has retired after 40 years as fire chief. Administrative Assistant Kathy Loveridge has retired after 28 years. Deputy Chief Phil Field is set to retire July 15, 2013. 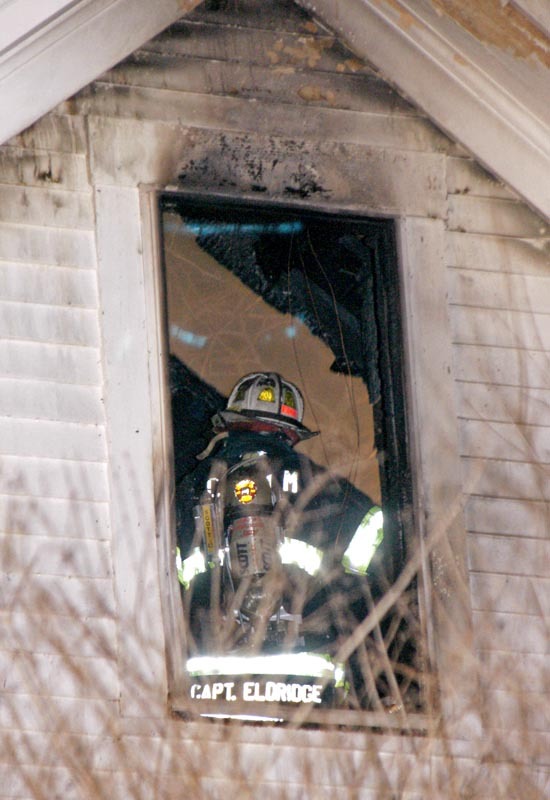 Hopes to fund a new fire/police headquarters failed to pass town meeting and election funding in spring 2013. Barnstable has promoted the four shift officers from Lieutenant to Captain. Congratulations to Captains Edward Guilford, Richard Pfault, Richard Ogonowsky, and Chris Beal. 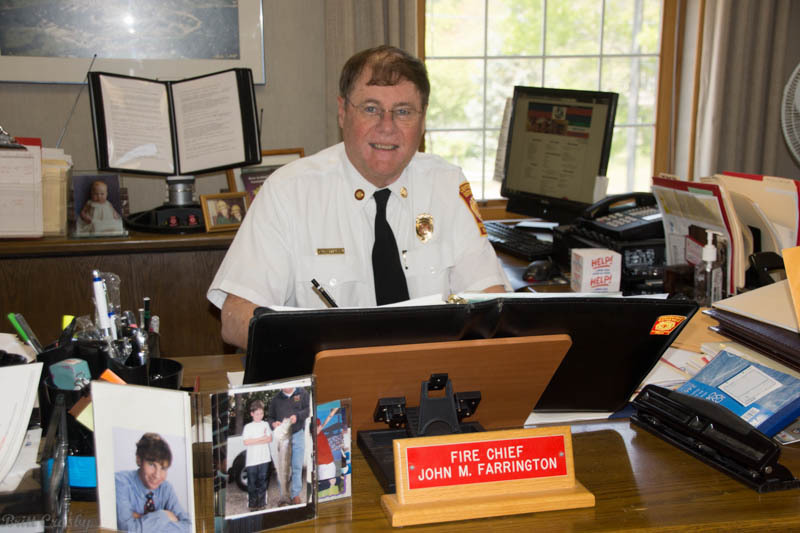 Chief John M. Farrington will be retiring at the end of June after 40 years as fire chief of the COMM Fire Department, and more than 47 years total service with the department. He was one of the original EMTs being trained in 1972.During his tenure the COMM FD advanced from a 2 station call department with a couple permanent men doing less than 1000 calls a year to a 3 station, fulltime professional department with nearly 60 employees doing nearly 4000 calls a year. He is the senior chief on the Cape. 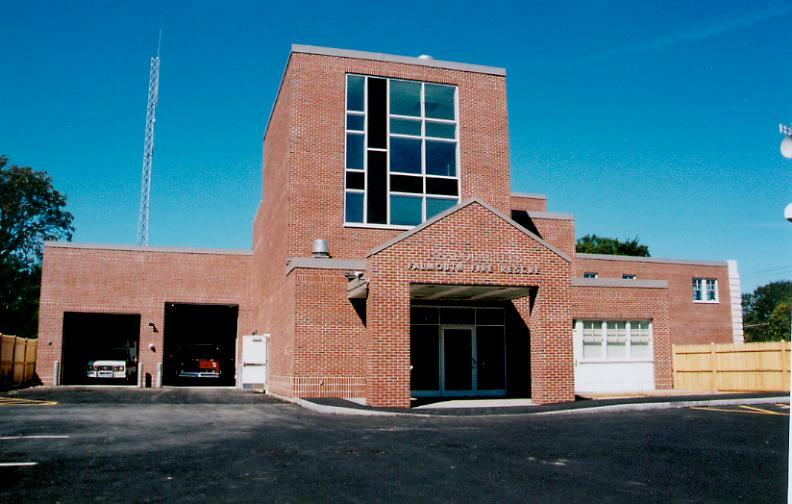 Harwich Fire Department will become the 10th Cape Fire Department to be dispatched by the Barnstable County Sheriff's Department Communications center dispatch. 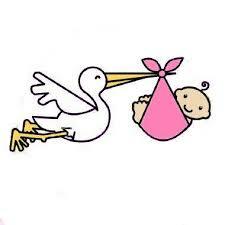 Expected April 15, 2013. The Town of Plymouth is now being serviced by Brewster Ambulance for 911 EMS calls. The town had previously been served by AMR for a number of years. Effective March 31, 2013. Capt Mike Caruso has retired after many years with the YFD. Tom Lundquist has been promoted from Lieutenant to Captain. Joe Mullin has been promoted to Lieutenant. Retired Falmouth Fire Chief James F. Rogers, age 85, passed away on Feb 27, 2013. Chief Rogers joined the Falmouth FD in 1942, became fulltime in 1949, was promoted to Deputy in 1955, and Fire Chief from 1978 to 1986. Chief Rogers son Glen also achieved the rank of Deputy in Falmouth and currently serves as Chief in Manchester by the Sea FD. at Chapman Cole & Gleason, 475 Main St, Falmouth center. at Church of Messiah, Church St., Woods Hole. 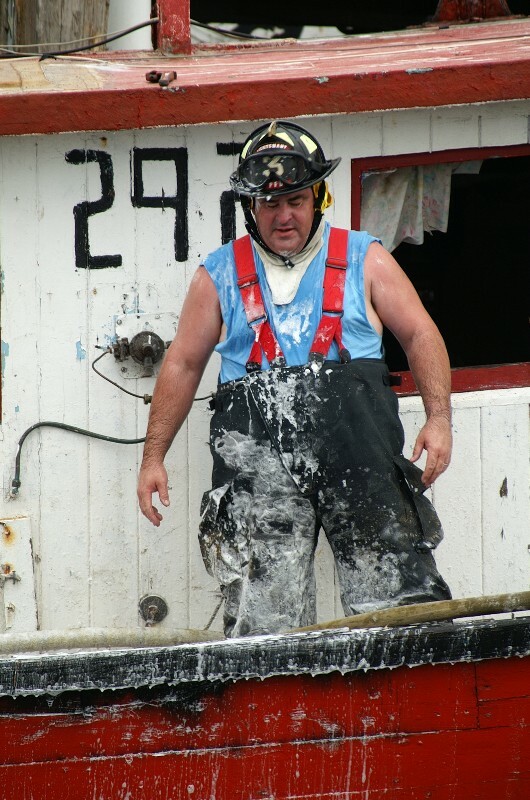 Wellfleet Fire Chief Daniel Silverman will retire Feb 28, 2013. 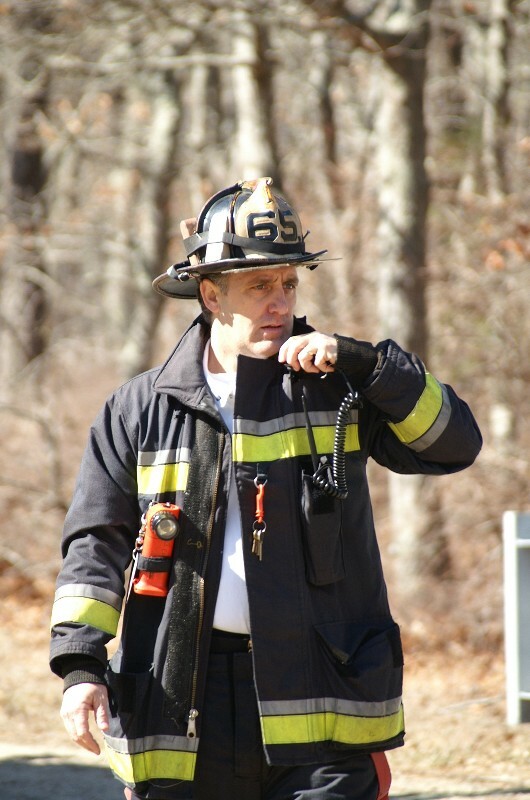 He joined Wellfleet FD in 1982 and became chief in 2006. Congrats! The new Chief Richard Pauley Jr. will take over at that time. on January 23, 2013 at age 52 from cancer. Jimmy dispatched for Barnstable County for 12 years. He worked the midnight shift for much of his career. He was recognized as CIEMSS EMS Dispatcher of Year 2007. His professionalism and confident voice will be dearly missed. Information on services will follow. at the Doane Beal & Ames Funeral Home, 729 Route 134, South Dennis, MA. at Our Lady of the Cape Church, 468 Stoney Brook Road, Brewster, MA at 11 am. will be in Oak Ridge Cemetery in South Dennis. The new "Narrow Band" radio frequencies have been programmed into radios are are already being used in anticipation for the mandatory change over on January 1, 2013. Here on the Cape we had previously used Med 2, Med 4, Med 5, Med 7, and Med 8 for CMED communications. New channel assignments utilize Med 2-N (narrow), Med 3-N (narrow), Med 4-N (narrow), med 7-N (narrow), and Med 8-2 (narrow "secondary"). It is a little confusing, but essentially twice as many potential CMED channels now exist, but rather than renaming them all in order, a set of new channels has been inserted between the old channels and the band width of each channel has been narrowed. For more, check out my radio page. Dec 21, 2012. 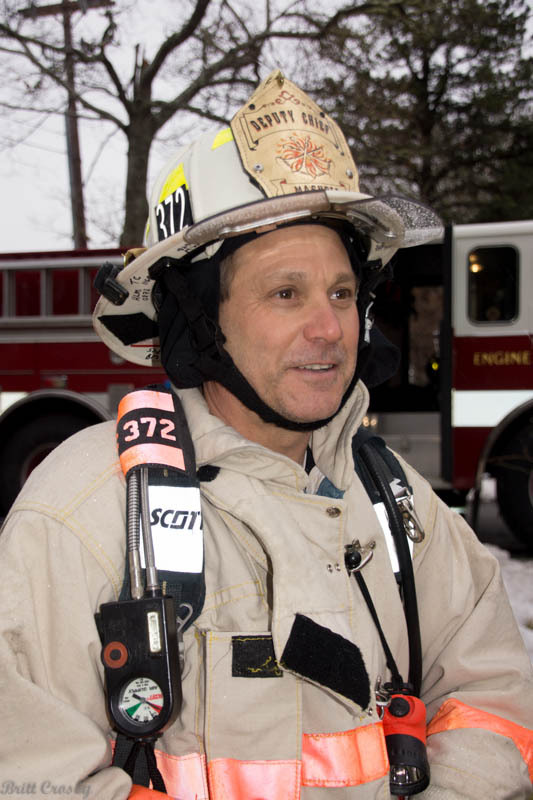 Wellfleet Fire Chief Daniel Silverman will be retiring at the end of February 2012 after serving as chief since 2006. 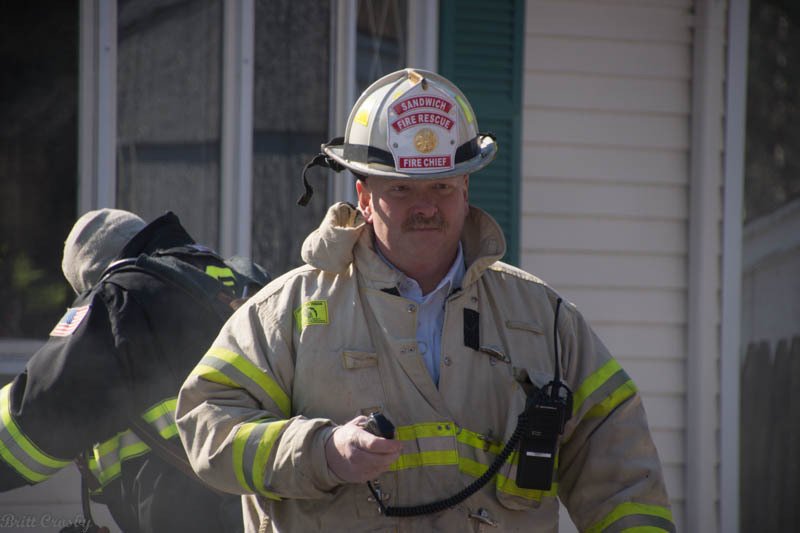 Wellfleet has offered the position of Fire Chief to Richard J. Pauley Jr. who has most recently served as Fire Chief in West Boylston, MA. Falmouth Deputy Chief Glen Rogers (left) has been selected as the new Fire Chief for the Manchester-By-The-Sea Fire Department in Essex County, MA. Congrats and best wishes to Deputy Rogers (son of past Falmouth fire chief James Rogers) who has been a member of the Falmouth FD for many years, advancing thru the ranks to Deputy. Also congratulations and best wishes to EMS Officer Joseph Dehnick (right) upon his retirement from the Falmouth FD effective 10-11-12. Joe served Falmouth FD for over 24 years and prior to that served with the Otis AFB fire dept. Former call Deputy Chief and long time member of the Brewster Fire Department Fred Hooper passed away in September 2012. Congratulations to Geof Deering, newly promoted to Captain. Cancer relief fund will be on Saturday May 5, 2012. Orleans Captain Clayton Reynard has retired after many years with Orleans. Congratulations to him and best wishes in his retirement. 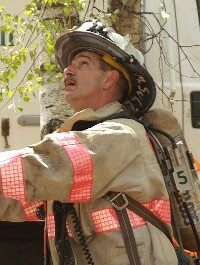 Geoff Deering is serving as acting Captain. Congrats to BSO BCI CIO Neil McGonagle on his retirement. April 2012. Wellfleet FD is the latest to be dispatched by the Barnstable County Sheriff's Department. WFD came online March 26, 2012. They had been dispatched by the Wellfleet PD since established. The New Deputy Chief Thomas Rullo started recently. Welcome to Cape Cod! Retired Oak Bluffs Fire Chief Nelson Amaral passed away on January 17, 2012 at the age of 86. He joined the OBFD at age 14 and served 56 years, the last 35 as Fire Chief. Congratulations to Eastham Captain / Paramedic Jennifer Smith on her 1/2/12 retirement! 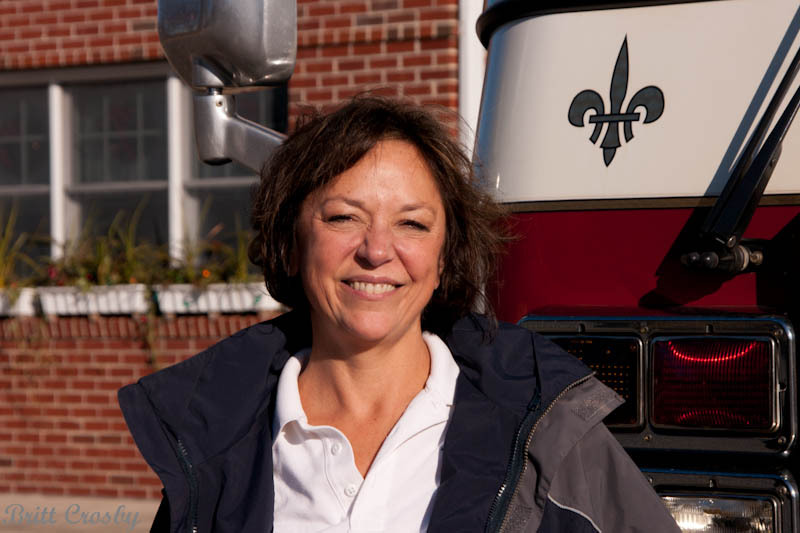 Jen joined the Orleans / Eastham Rescue in 1978 on call. In 1982 she joined the Eastham Fire Department where she has served as a paramedic, as well as a Lieutenant and Captain in her 33 years. Party planned January 21, 2012! 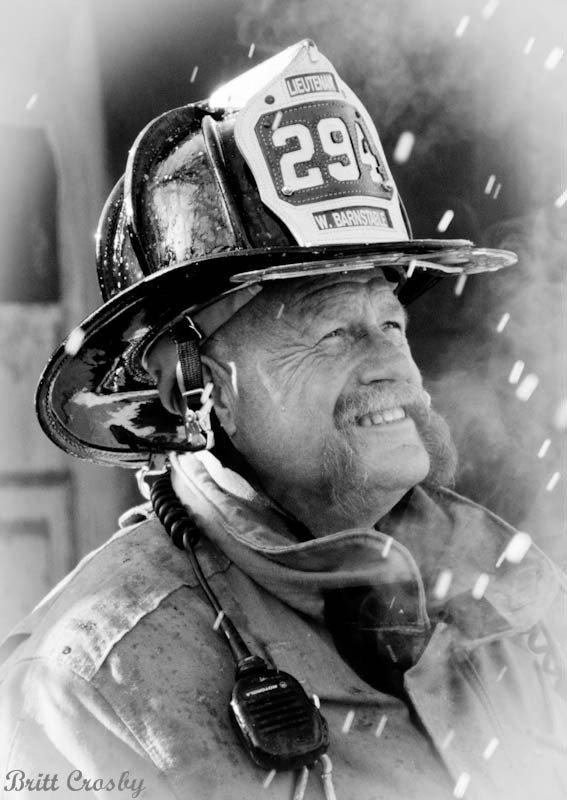 HFD Regrets to announce the passing of retired Captain Bruce C. Young Sr. on Dec 17, 2011 at age 77. 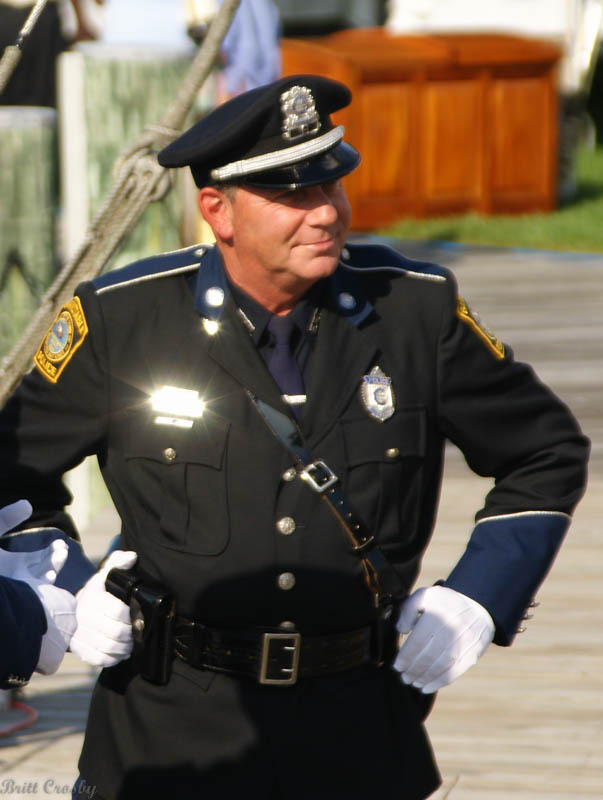 Wake for Capt Young Wed. Dec 21, 2011 4-7 at Morris, O'Connor & Blute Funeral Home, 678 Main St, Harwich. Funeral Thurs Dec 22, 2011 at 11:00 at Pilgrim Congregational Church, 533 Rte 28, Harwich Port. 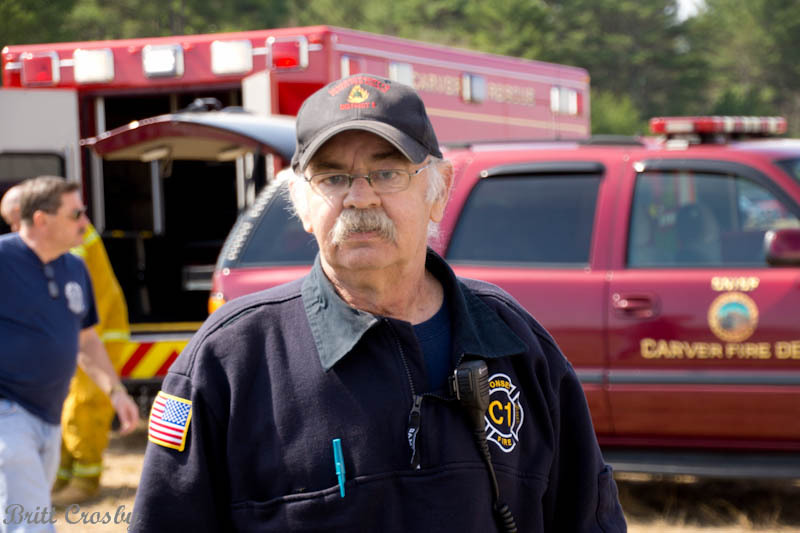 One of the pioneers of EMS on Cape Cod passed away on Oct 28, 2011. It is with deepest regrets that the HYFD announces the sudden and unexpected passing of recently retired Hyannis FF Dana W. Clough, age 60, on October 19, 2011. 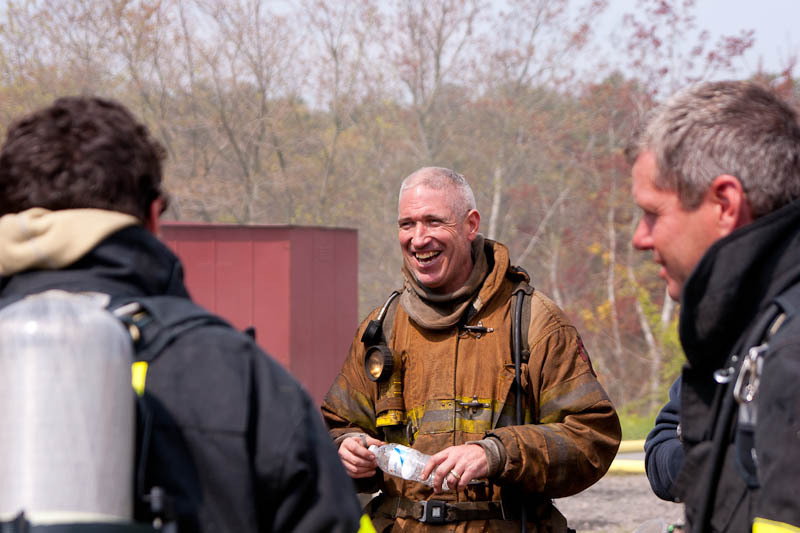 FF Clough retired just 7 months ago on March 19, 2011 after 36 years with the Hyannis FD. 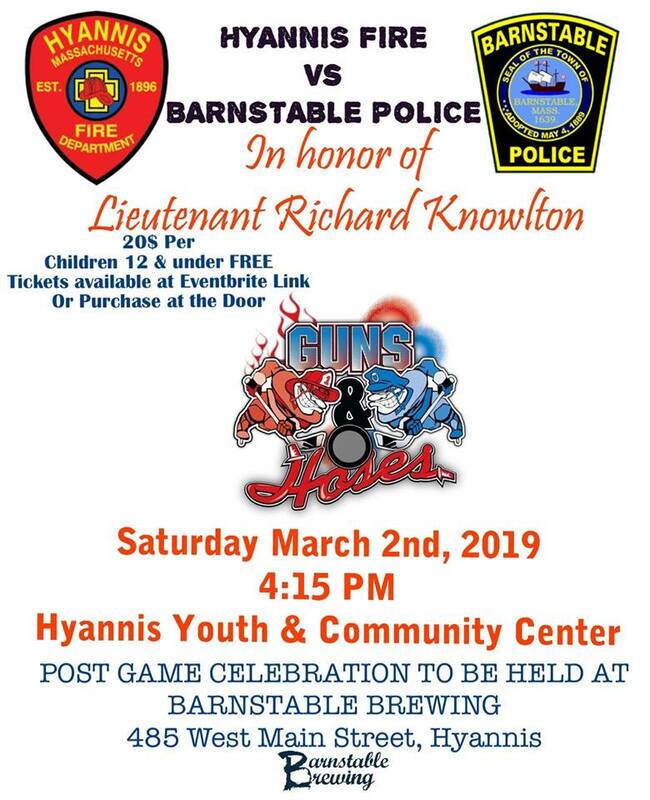 His father served many years as the Chief in Hyannis and Danny's son, Ryan, is a firefighter/paramedic with Hyannis (currently serving in Afghanistan). A brother, Glenn Clough served as a Captain at COMM FD. Our sympathies go to Danny's family, friends, and co-workers. Oct 19, 2011. Deputy Chief Norman Clarke will become the next Harwich Fire Chief on November 18, 2011, with the retirement of Chief Flynn. 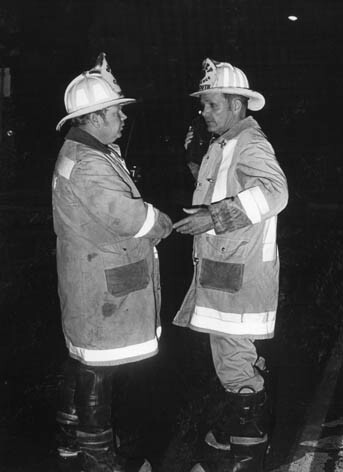 Both Flynn and Clarke joined the Harwich FD together in 1977 and worked their way through the ranks. Clarke served as Captain for 14 years and as Deputy for the past 4 years. Congratulations to him. The new Deputy Chief will be Captain Kent Farrenkopf. 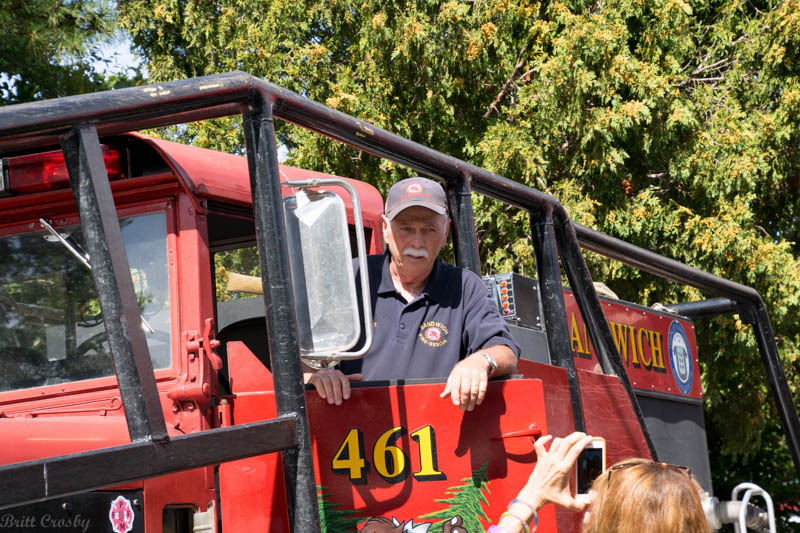 Harwich Fire Chief William Flynn has announced his retirement effective November 18, 2011. Chief Flynn joined the Harwich FD in 1977. He became a paramedic and worked his way through the ranks to the rank of fire chief in July 2007. In addition, Chief Flynn has been active in the CIEMSS. Congratulations to him. 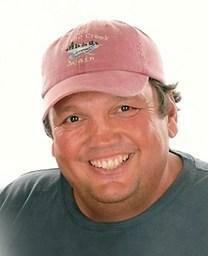 Former Barnstable Police Officer James M. Dunn, age 58, passed away on September 29, 2011 after a long illness. Officer Dunn was a good friend and will be greatly missed. 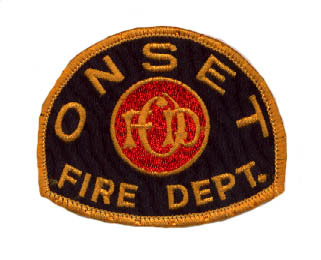 COMM FD regrets the passing of retired Firefighter C. Ernest (Ernie) E. Bunker on September 27, 2011 at age 67. FF Bunker was one of the original C-O FD permanent firemen hired in 1966. He was a charter member of Local 2346. After his retirement from the FD he worked extensively with the Red Cross. Recent promotions and assignments as follows. 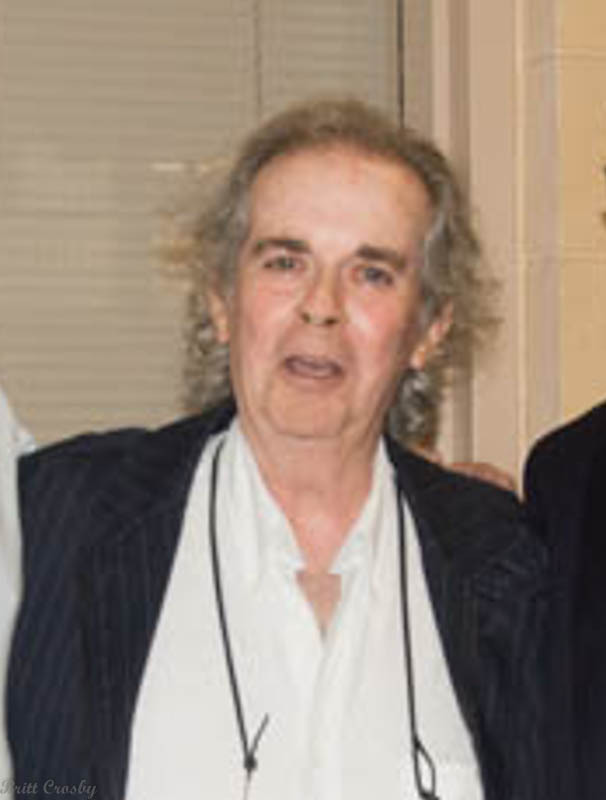 age 69. Captain Tyldesley joined Harwich FD in 1977. Services were held on April 14, 2011. 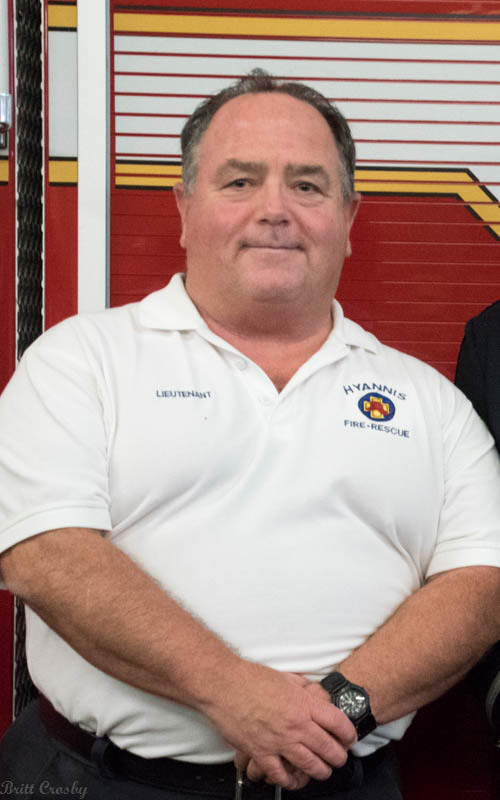 Regrets to announce the passing of retired Firefighter Vincent "Vinny" Harrington, a member of the volunteer, call, and permanent Sandwich Fire Departments serving more than 38 years. He was the first permanent firefighter hired by Sandwich and a founding member of Local 2196 IAFF. Vinny passed away after a long battle with cancer on March 28, 2011. Wake will be Sunday March 3, 2011 from 3:00 - 7:00 at Nickerson Bourne Funeral Home on Route 6A in Sandwich. The funeral will be Monday March 4, 2011 at 11:00 hours at the funeral home, with burial to follow at the Town Cemetery on Route 130. 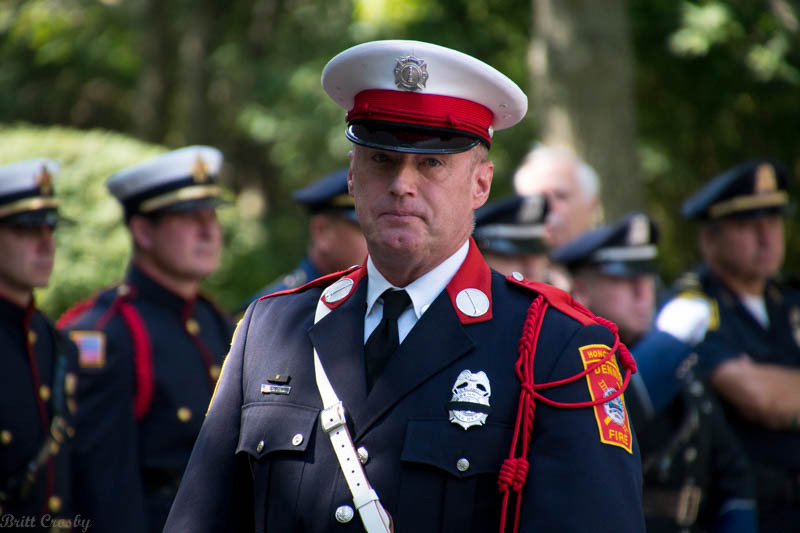 West Barnstable Fire Department regrets to announce the passing of retired Deputy Chief Craig S. Pye at age 57 on February 25, 2011 after years of illness. Deputy Pye joined the fire department in 1969 and served for 40 years, retiring in 2009. Visiting hours will be held from 4 to 6 p.m. Tuesday, March 1, 2011, at the Doane, Beal & Ames Funeral Home, 160 W. Main St., Hyannis, MA 02601. A funeral service will be held in the funeral home at the end of the visiting hours. In lieu of flowers, memorial donations may be made to the West Barnstable Fire Fighters Relief Association, P.O. Box 456, West Barnstable, MA 02668; or Hospice and Palliative Care of Cape Cod, 765 Attucks Lane, Hyannis, MA 02601. Hyannis Firefighter Dan Clough will be retiring in March 2011 after more than 30 years with the Hyannis Fire Department. FF Clough comes from a firefighting family. His dad was long time Hyannis Fire Chief Glen Clough. His brother Glen retired as a Captain from the COMM Fire Department and his son Ryan is currently a Hyannis FD Firefighter/Paramedic. Congrats and many happy, healthy years to you Danny! Congratulations to Administrative Assistant Debbie Abbott upon her retirement from the Eastham FD having served the past 18 1/2 years. She also served Orleans FD for 12 years. Deputy Chief Sheldon Hamblin will be retiring in February. A party is being planned for February 12, 2011.
at age 82. Chief Farrenkopf was one of the early Hyannis fulltime firefighters and served as Captain, Deputy, and Fire Chief retiring in 1990. 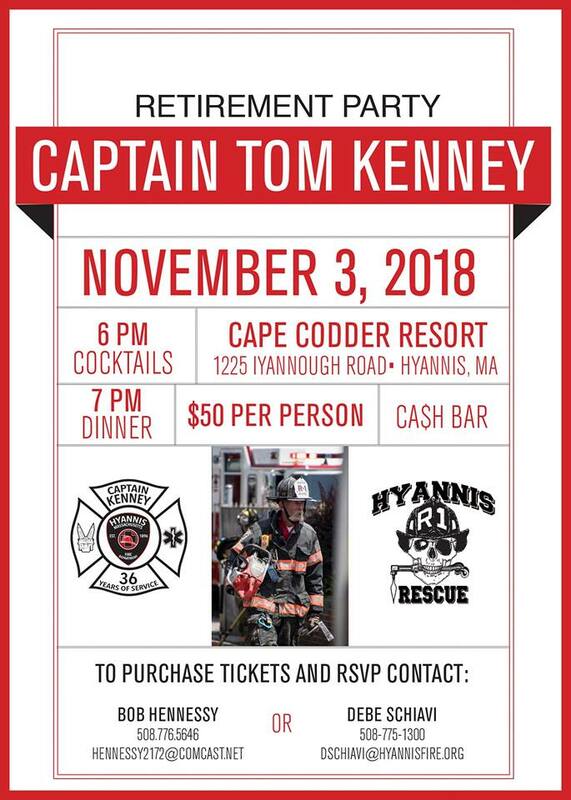 He was the father of current Captains Eric and Craig from Hyannis, Capt Richard Farrenkopf of Dennis FD, and Captain Kent Farrenkopf of Harwich FD. Wake is Sunday Jan 9, 2011 from 1600 to 2000 hrs. Deputy Chief Robert Kelleher is retiring effective 11-12-10. 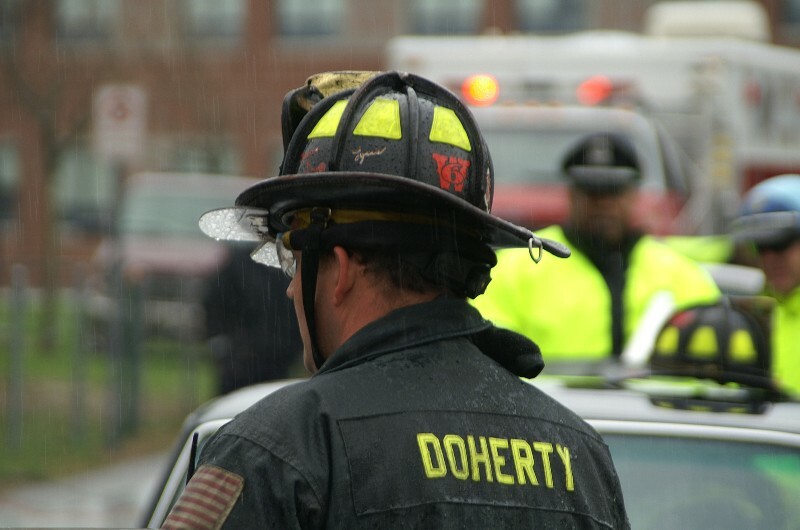 Deputy Kelleher served YFD for many years serving at all ranks, including Acting Fire Chief and has been a leader in the Mass District 1 Hazardous Materials Team since its inception. Best wishes to Bobby in his retirement. Taking his place will be Deputy Chief Phil Simonian. Phil served at various ranks at YFD most recently serving as Captain. Congratulations. Lt. Paul Holmquist is retiring. Several officers have been out on medical leave including Captain Alan Boles, Lt Rob Christianson, and Lt. Bob Reardon. With the recent retirement of Fire Chief Paul Brodeur, a number of promotions and reassignments have been implemented. Serving as Acting Fire Chief is Deputy Mark Sullivan. Serving as Acting Deputy is Captain Mike Small. Congratulations to newly promoted Lieutenant Eric Sabatinelli. Wake: Monday Oct 11, 2010 Doane Beal and Ames, Route 134 in South Dennis from 1600-1900 hrs. Regrets to announce the passing of retired Firefighter / EMS Officer / Paramedic James W. Silva on Sept 22, 2010 at age 59. 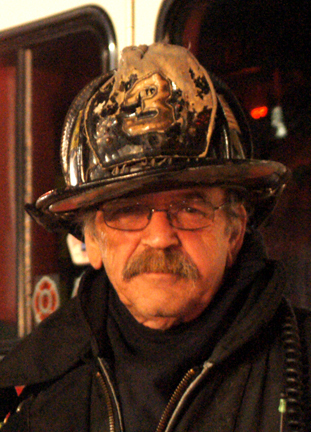 Jimmy served as a member of the Sandwich FD since 1974, retiring in 2005. He was Sandwich's first EMS officer. Wake on Sunday 9/27/10 from 3-7 at Nickerson Bourne Funeral Home, 154 Route 6A in Sandwich. The funeral will be at Nickerson Bourne on Monday 9/27/10 at 1000 hours with burial to follow at Sandwich Town Cemetery. Congratulations to Eric Sabatinelli, promoted to Lieutenant Sept 2010. 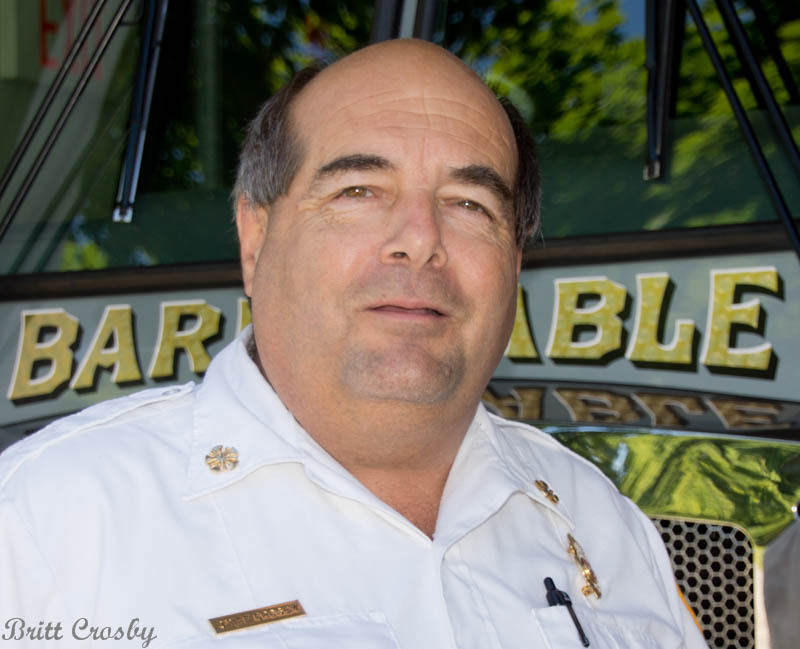 Captain Paul "Umack" Cabral, a member of the Barnstable and Dennis Fire Departments for 44 years will be retiring in October 2010. Guests welcome to stop bye and wish him well on Sunday Oct 3rd. Best wishes to him. 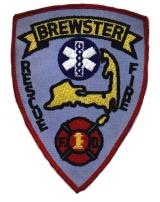 The new Brewster Fire Department Chief Robert Moran is expected to begin duties on October 1, 2010. Chief Moran comes from Englewood, NJ. He replaces Chief Roy Jones who retired April 30, 2010 after serving as Chief for 29 years.. Former Dennis FD Chief Paul "Buffy" Tucker has been serving as interim chief. Lt Richard Sargent promoted to Captain Group 1. Captain Phillip H. Field Jr promoted to Deputy Chief effective Sept 6, 2010. Lisa Albino promoted to Captain. 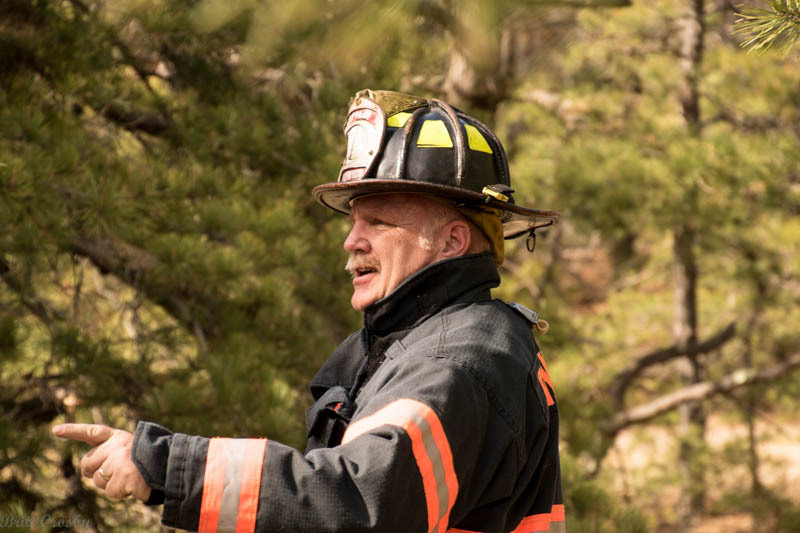 Deputy Chief Craig Whiteley has announced his upcoming retirement. 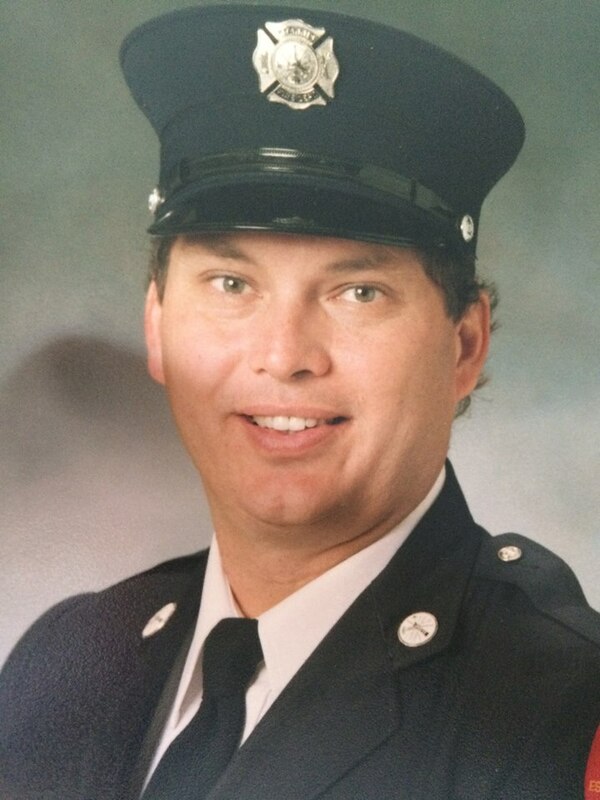 Deputy Whiteley was one of the first permanent firefighters at C&O, was one of the first Cape EMTs and paramedics, served as a Captain, and was selected as the departments first fulltime Deputy chief in 1989. 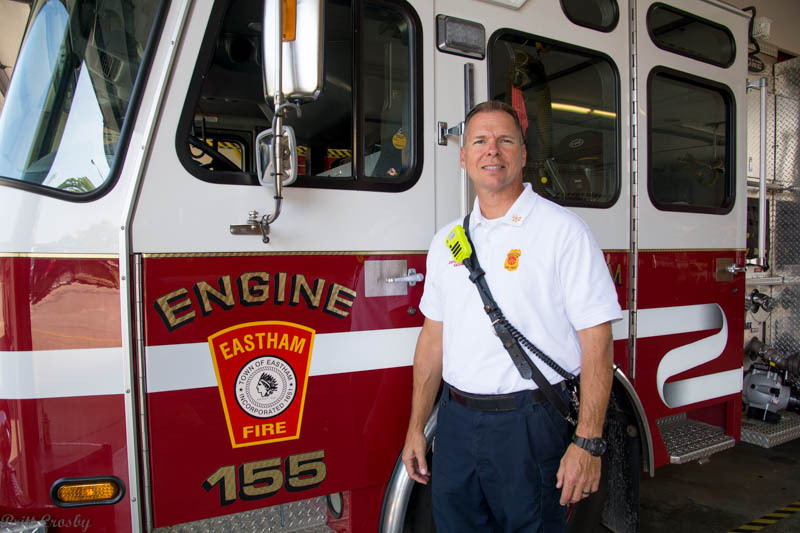 Captain Brian Edmunds of the Eastham Fire Department has retired after serving Eastham since 1979. Capt Edmunds was a founding member of L2975.July 2010. Long time Harwich FD dispatcher Alice Bonat has retired. July 2010.
on May 19, St Joseph's Church Kingston, MA. chief Roy E. Jones III who retired April 30, 2010. 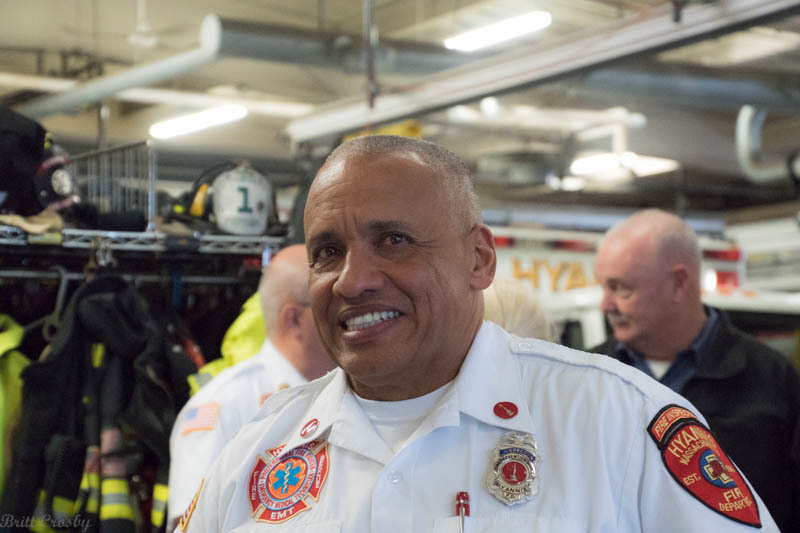 Long time Brewster Fire Department Chief Roy Jones III is retiring. A party will be held on May 14, 2010 to celebrate and roast the chief. Chief Jones served as Chief for 29 years. Benefit for Muscular Dystrophy. OPEN to the public. $10 admission. 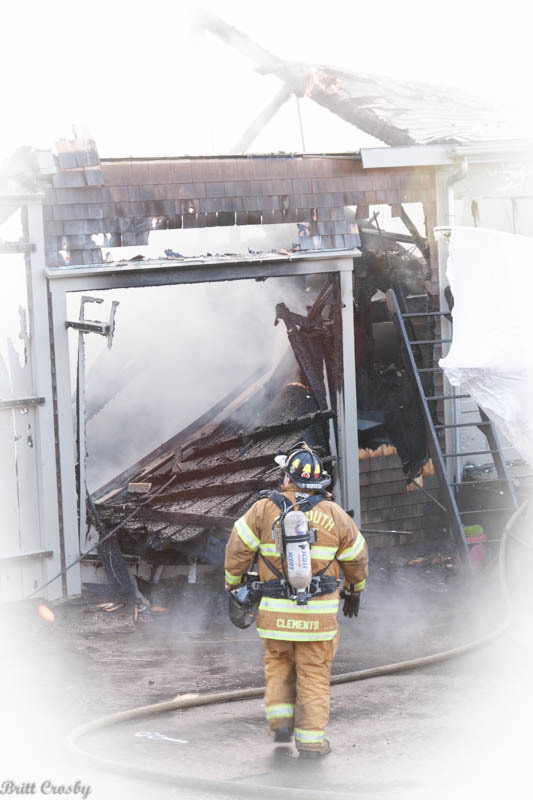 A tragic fire has taken the life of an off duty volunteer firefighter in West Tisbury. 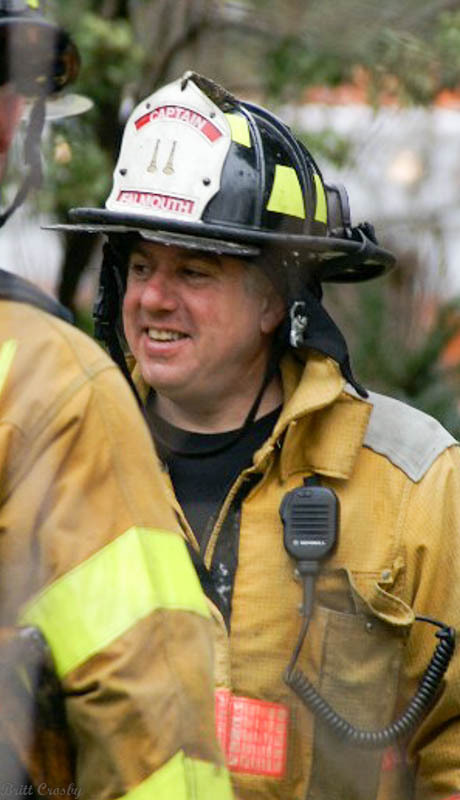 Daniel E. Prowten, age 63, a 30 year member of the West Tisbury Fire Department, who had served as a Lieutenant for over 20 years, was killed when a fire destroyed his home around 0515 hours on Saturday January 30, 2010. 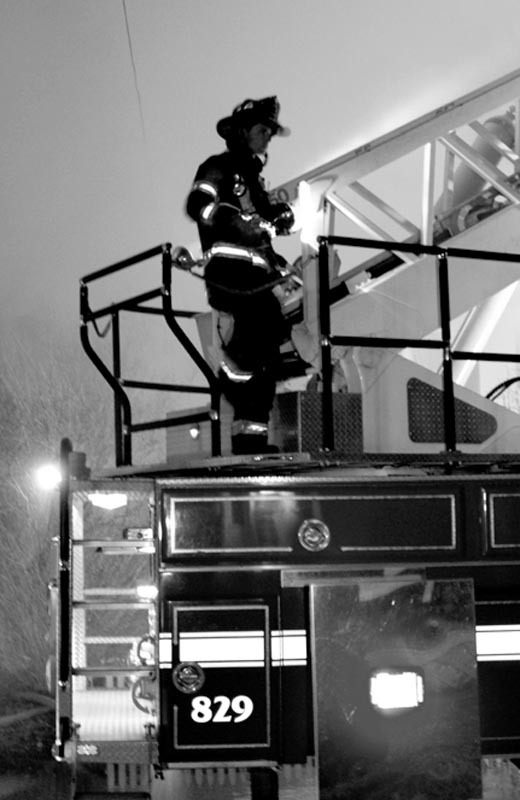 West Tisbury was assisted by other island towns extinguishing the fire in frigid temperatures. Regrets to announce the passing of retired COMM Firefighter/Fire Prevention Officer Glen Wilcox, 56, on January 23, 2010. Glen joined COMM in 1975 as a call firefighter. Served as a dispatcher, paramedic, firefighter, and retired as a fire prevention officer. Glen retired in 2005 due to health issues. Recently announced the retirement of EMT Brenda Nailer. Brenda served loyally for more than 20 years. Congratulations Brenda. Jan 14, 2010. COMM Regrets to announce the passing of retired Firefighter Frank P. Williams Sr.,84, on Dec 21, 2009. Frank was a long time member of COMM, serving as both a call and fulltime firefighter. He was also one of the early CIEMSS paramedics and was dedicated to teaching CPR for decades and served on the firefighter association scholarship committee. A memorial will be held on Monday Jan 11, 2010 at 1000 hrs in Centerville. Is Pleased to announce the promotion of FF Michael Grossman to Fire Prevention Officer. 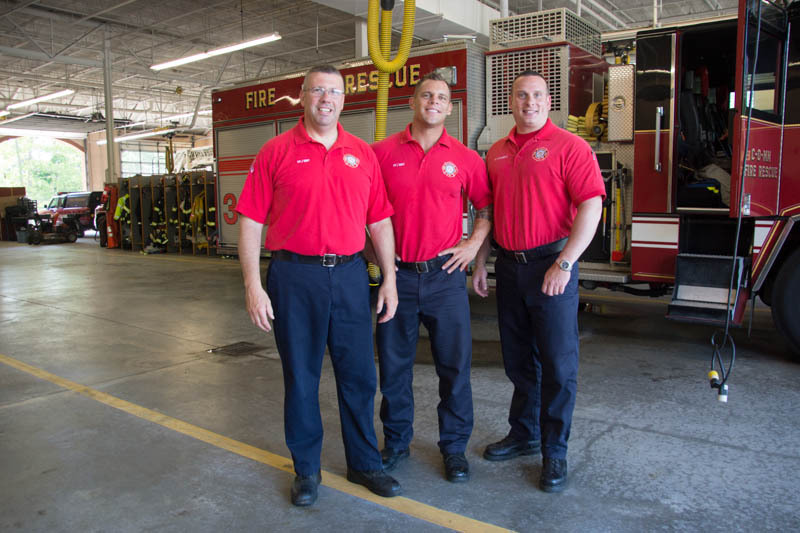 Plymouth Fire Department has some new leadership. Deputy Chiefs Lamb and Enos both recently retired. The new Deputies are Deputy Donald Brown (C2) Admin and Deputy Michael Young (C3) Operations. Battalion Chiefs are now BC1 Stanley Eldridge, BC2 Kevin Hurley, BC3 Kevin Murphy, and BC4 Daniel Braley. BC5 (Training) is currently unfilled. BC6 Fire Prev Gregory Kane. Additional promotions have also taken place. The 2nd Annual MIGHTY MEEHAN 5K RACE is scheduled for Sunday, Sept 13, 2009, from 1000 - 1700 hours at the West Dennis Beach. The race is 3.1 miles. For more contact bob@mightymeehan.com. 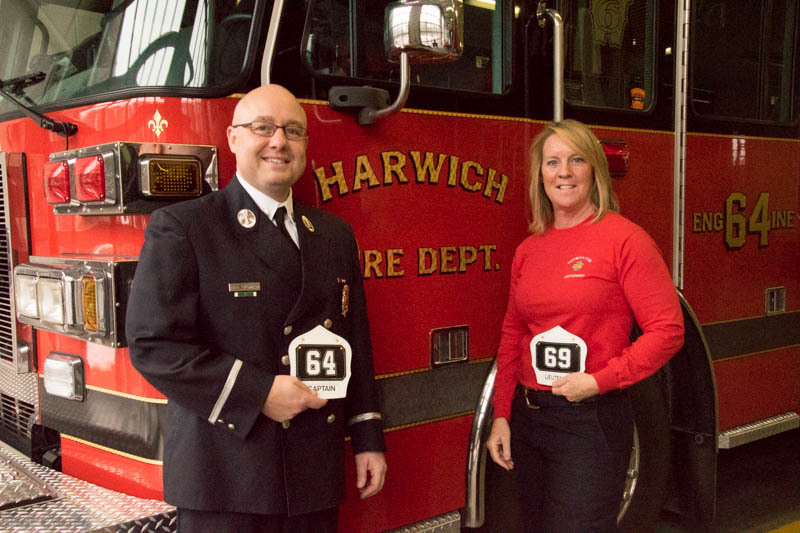 Congrats to Harwich Firefighter/Paramedic Justine Walorz and COMM Firefighter/Paramedic Michael Judge. Both competed in and completed the 192 mile Sturbridge to Provincetown PAN MASS CHALLENGE race recently. The event raises money for the Dana Farber Cancer Institute. It was the first time either have raced. Regrets to announce the passing of retired call Captain Edward Braley on June 12, 2009. Capt. 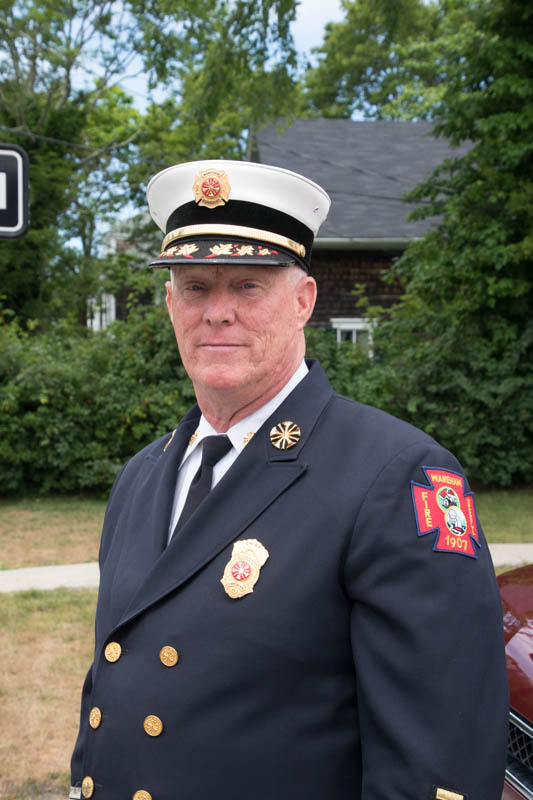 Braley served as a member of the Bourne Fire Department for 50 years, 25 of which as Captain at the Monument Beach Sta 2. COMM FD regrets to announce the passing of two former call firefighters. Lester 'Let' Silva was on the Centerville roster for many years during the 1970s and 80s. John Pina, father of Hyannis Firefighter Barry Pina, and one of the founding members on the Marstons Mills roster when that station opened in 1975, both passed away on Jan 28, 2009. Jan 28, 2009. Hyannis Fire Department has promoted William Rex to Captain of Group D replacing recently retired Captain Joe Cabral. Kevin Black has been promoted to Lieutenant on Group A. Also see new Hyannis Local 2172 Website. Hyannis Captain Joe Cabral retired on Nov 19, 2008 after 36 years of service. Congratulations. Robert Kelleher has been appointed acting fire chief as of November 10, 2008 with the pending retirement of Fire Chief C. Randal Sherman. Military Reservation Fire Department protecting the 22,000 acre area. Story. 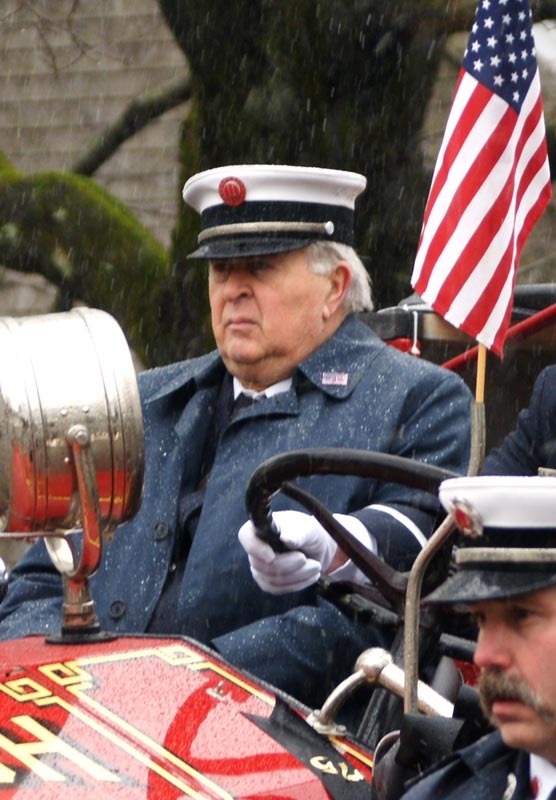 Regrets to announce death of long time P-Town Fire Department member and former Fire Chief Clement S. "Klem" Silva who passed away on Aug 31, 2008. Chief Silva was one of the founder members of Lower Cape Ambulance and was known for driving the ambulance to Cape Cod Hospital with his wife Ursula in the back with the patients. Arrangements to follow. For those who follow Tim Caldwell's awesome Cape Wide News, that up until recently has been on the CapeCodToday site... you should take note that Tim's coverage has temporarily moved. The new site is located at http://home.comcast/net/~n1riw/capenews.htm. Tim is looking for another carrier for his news. Stay tuned. Orleans has officially promoted Anthony Pike as Deputy Chief....no joking! Aug 2008. Effective July 1, 2008, the (4) COMM Senior Privates have been promoted to Lieutenant. The Senior Private positions have been eliminated from the contract. 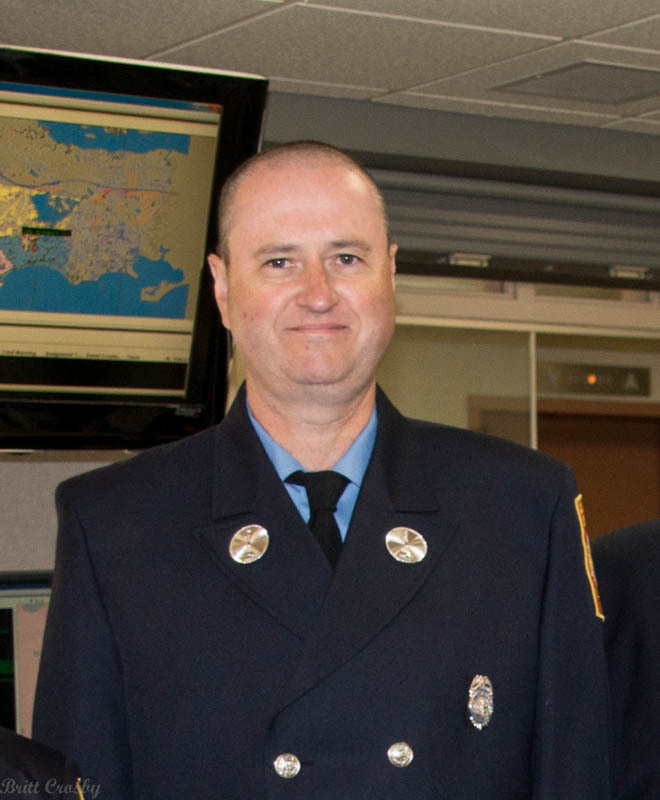 Congratulations to the new Lieutenant David LeBlanc (Group 2) who has replaced the retired Lt. Danny Spencer. Ticket for red sox raffle, food and silent auction. Deputy Chief Brian Davis has been appointed as Acting Fire Chief with the retirement of Chief E. Thomas Prada. 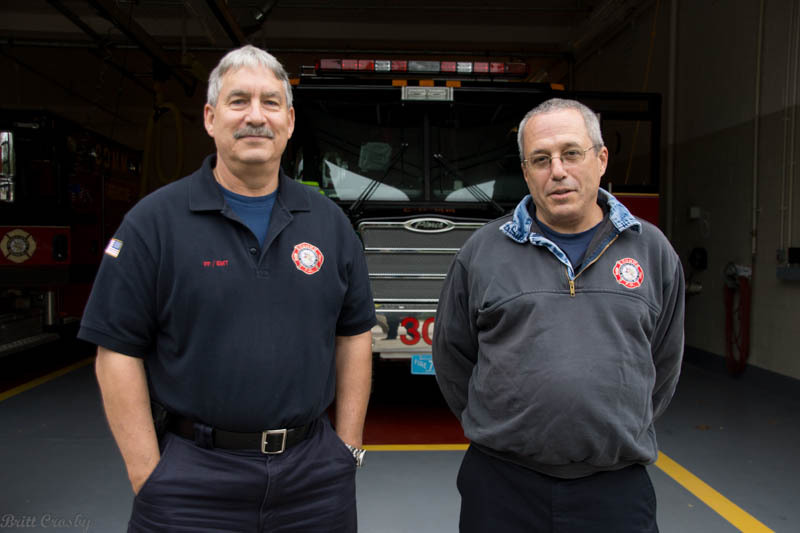 The Chief and Deputy at Middleborough FD retired in 2007. Serving as the acting chief and administrator has been the Police Chief Gary Russell. 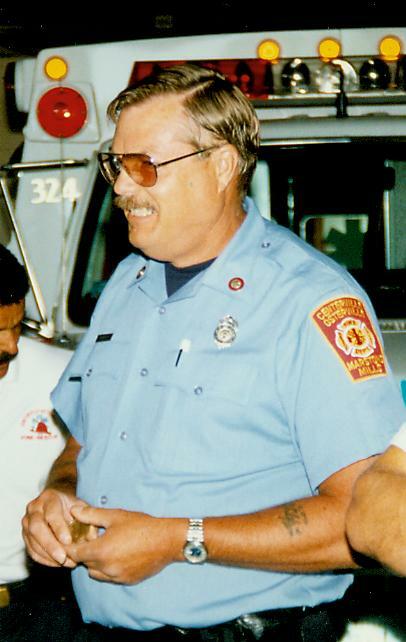 Retired call Deputy Fire Chief John B. Farrington, age 82 passed away on March 29, 2008. Deputy Farrington was a member of the fire department for 32 years and was the father of Fire Chief John M. Farrington. A memorial service is planned for Saturday April 5, 2008 at St Peters Church in Osterville at 1300 hours. Lower Cape is looking for (1) EMT and (1) Paramedic. Contact via Provincetown FD or Lower Cape Ambulance. Otis announces that Jackson Emery has been promoted from Captain to Assistant Chief. Brett Childs has been promoted to Lieutenant. Asst Chief Training William Maciorowski has left Otis for another position. 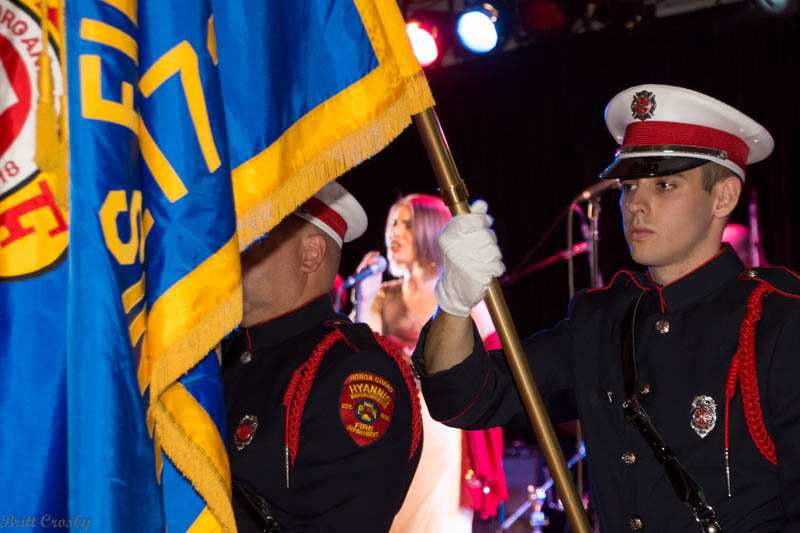 WEST DENNIS –Turlough E. Meehan, infant son of Dennis firefighter Phelim Meehan and his wife Amanda-Clare, passed away on December 18 after his valiant battle with acute lymphoblastic leukemia. His wake will be held on December 27 at Hallett Funeral Home, 273 Station Avenue, South Yarmouth, from 3 to 6 p.m. 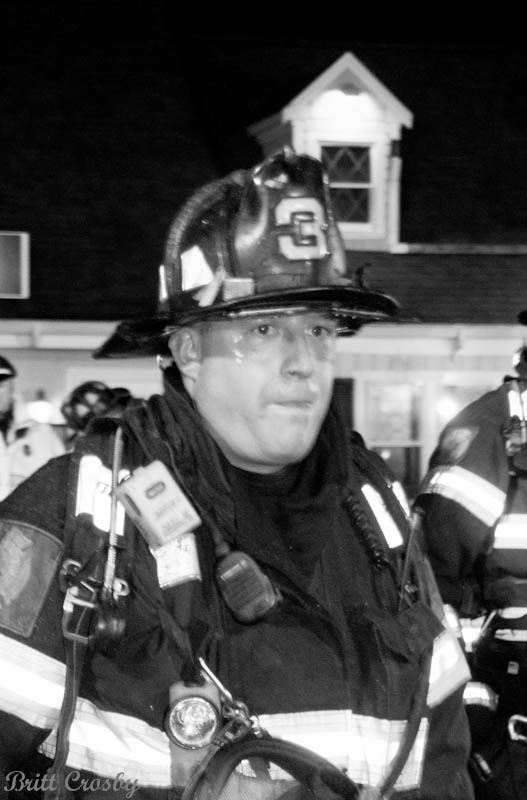 The funeral will be held on Friday, December 28, at St. Pius X Church, 94 Station Avenue, South Yarmouth, at 10 a.m.
Wake, Thursday December 27 The Dennis Fire Department invites fire and police personnel to join them at the wake on Thursday to pay their respects to Turlough with a walk-through at approximately 6:15 p.m. All personnel are requested to wear Class A dress uniforms and meet for assembly at the Station Avenue Elementary School across the street from the funeral home at 5 p.m. Funeral, Friday December 28 On Friday, uniformed personnel are requested to assemble at the church’s Youth Center (blue building next to the church) at 9 a.m. to receive instructions from Deputy Donlan. Please park in the larger lot east of the church. This will allow the funeral procession to park in the smaller lot next to the church. Following the funeral, guests are invited to Chapin’s Restaurant, 85 Taunton Avenue, Dennis. The family requests that uniformed personnel change into civilian attire before arriving at Chapin’s. In lieu of flowers, donations may be made to the Jimmy Fund in memory of Turlough Meehan. Donations may be made by mail or phone to: Dana-Farber Cancer Institute 10 Brookline Place, 6th Floor Brookline, MA 02445-9924 800-52-JIMMY (54669). 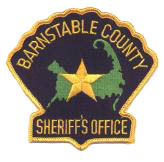 - Barnstable County Sheriff's Department dispatchers began dispatching for Otis Fire in December 2007. The BSO county dispatch center is located in the Otis Fire Station. BSO now dispatches for 7 fire departments including Barnstable, Bourne, Brewster, Mashpee, Orleans, Otis, and West Barnstable. - Plymouth Fire Department new fire chief Edward Bradley, Dec 1, 2007. - West Barnstable Fire Department Senior Private Robert Crocker retires after 32 years of service to WBFD. 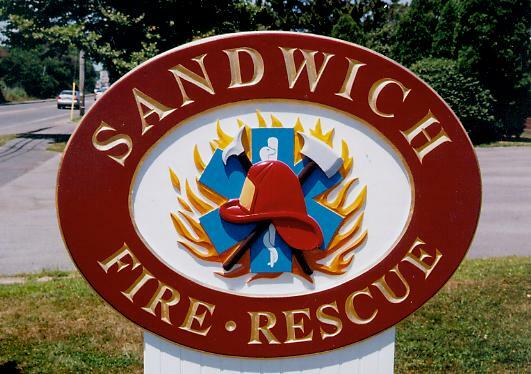 - Sandwich Fire Department has announced some promotions. Lt. Scott Ames has been promoted to Captain. FF Sean Butler and EMS officer Jason Viveiros have been promoted to rank of Lieutenant. Congratulations guys! - Sandwich Fire Department also recently lost a well known member of the department. 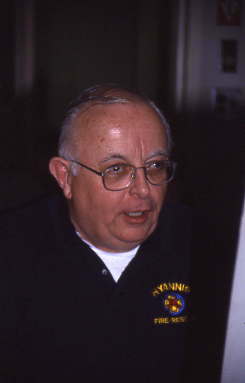 Richard E. Canning Sr. had been a member of the Sandwich Volunteer Fire Department for many years, serving as a Lieutenant and Fire Commissioner. 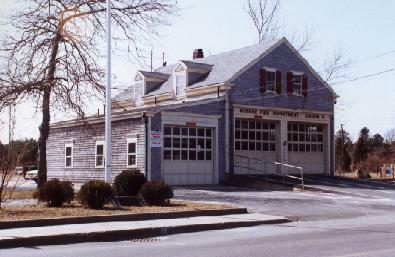 Mr. Canning owned a gas station and the garage at that station (a building moved from Otis) served as the first East Sandwich Fire Station for a period of years. Mr. Canning passed away Oct 3, 2007. - Plymouth County Pipes and Drums is organizing and looking for anyone who may be interested in joining. - Sandwich Fire Department regrets to announce the death of Lt. David J. Boles on Sept 8, 2007. Wake at Corpus Christi Church in Sandwich on Sept 13. Funeral at Corpus Christi Church on September 14th @ 1030 hrs with burial to follow and Sandwich Town Cemetery on Route 130. - Plymouth Fire Chief James Pierson is planning to retire this fall after 33 years with the Plymouth FD. Story. 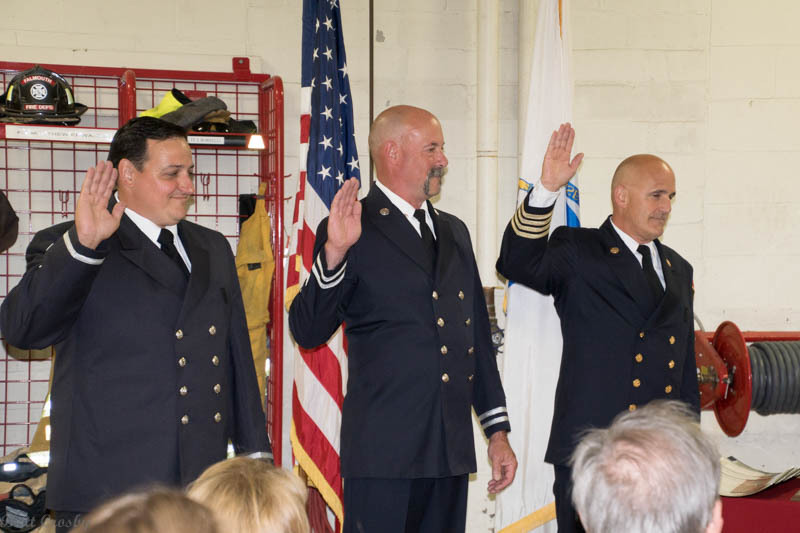 - Harwich Fire Department recently promoted Joseph Mayo to Captain and Michael Mason to Lieutenant. These promotions fill vacancies created by the recent promotion of Capt Norman Clark to Deputy. Congrats to all. Aug 19, 2007. 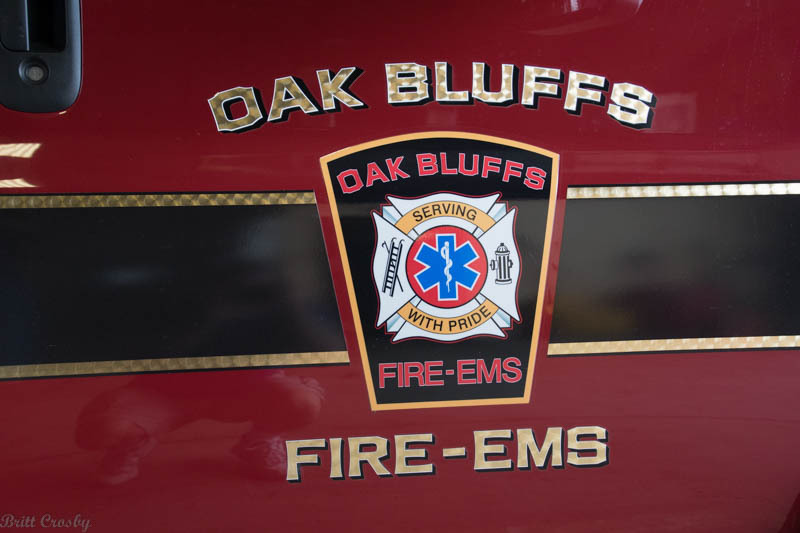 - Oak Bluffs Fire Department has a new Chief. Peter Forend was appointed chief taking over from the retiring long time chief Dennis Alley as of July 1, 2007. August 6, 2007. 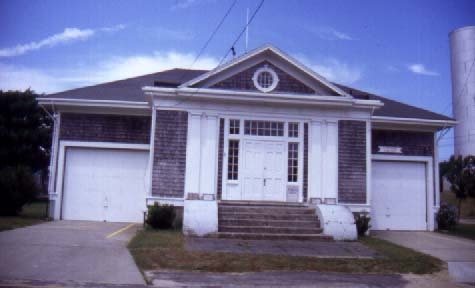 - Barnstable County Communication Center moved into Otis facility on 07-11-07. 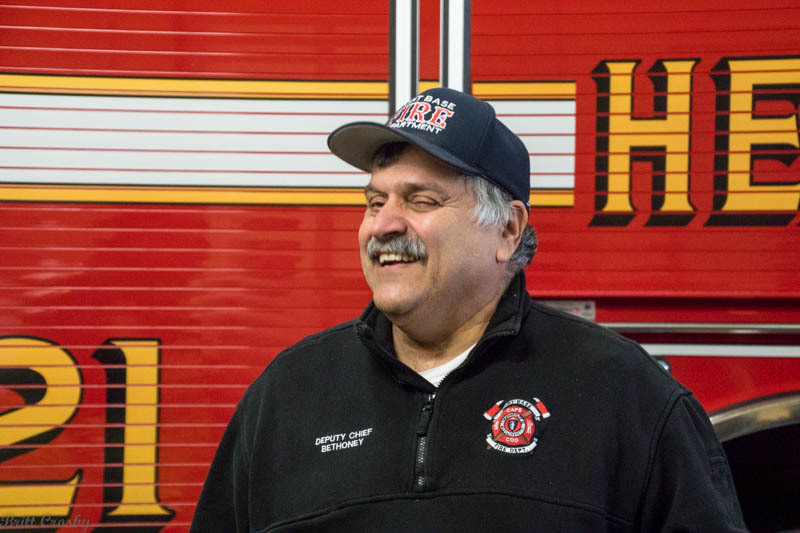 - Dennis Fire Department promoted Robert 'Vito' Marselgia to Captain. Captain Marselgia has been a member of DFD since 1984 and had been a Lieutenant prior to promotion. He replaces retired Captain David Rodriguez. Congratulations to the new Captain. 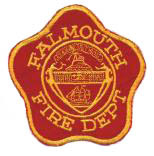 - Falmouth Fire Department reports they had 5,665 runs is their fiscal year ending June 30, 2007. - Chatham Fire Department has created 4 Lieutenant positions. The following have been promoted to these positions as of July 1, 2007. Group 1 Lt Nelson Wirtz Car 381A. Group 2 Lt David Ready Car 382A. Group 3 Lt Katrina Hansen Car 383A. Group 4 Lt Violet Fellman Car 384A. This makes a Capt & Lieutenant on each group. Congratulations to all. 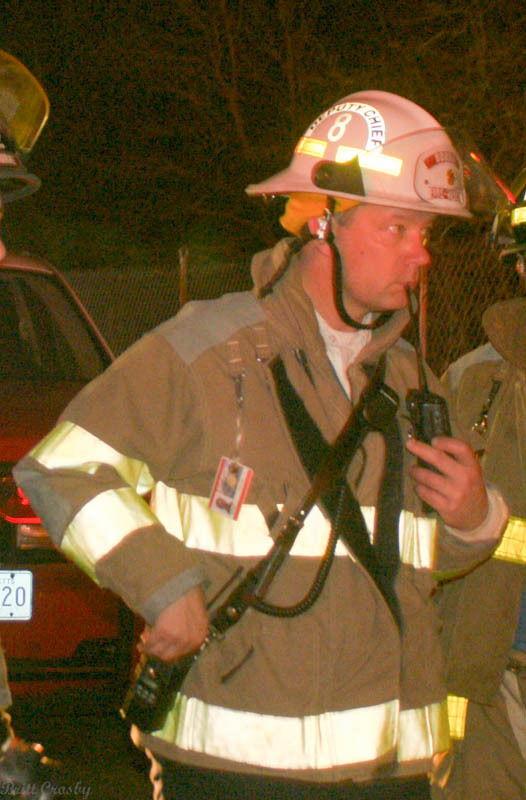 - The new Harwich Fire Chief William L. Flynn Jr. was sworn in on June 29, 2007. Chief Flynn takes over from Chief Remillard. Bill has been a member of the Harwich FD for many years serving in all capacities from firefighter, paramedic, to Captain and Deputy. Congratulations to Chief Flynn and the Harwich FD. - Yarmouth Fire Department has promoted Robert Kelleher to the rank of Deputy Chief. 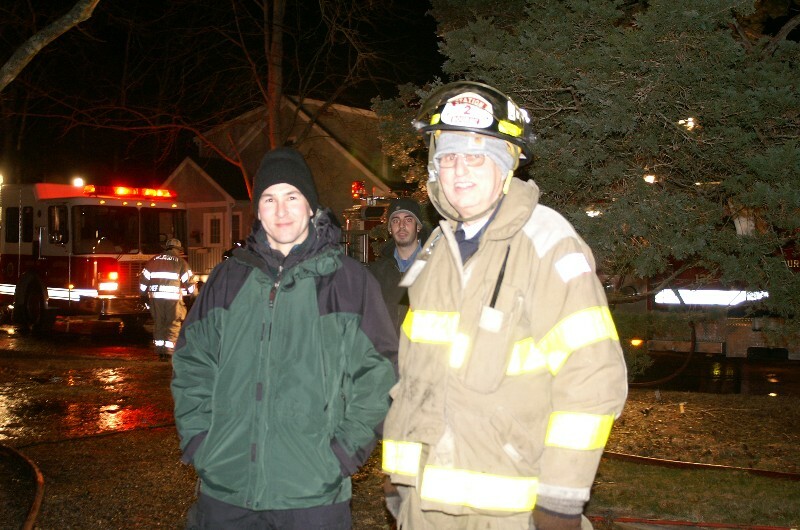 Kelleher, a long time member of the YFD had been a shift captain and most recently Captain / Fire Inspector. Deputy Kelleher replaces Deputy Peter Raiskio who passed away on 2/14/07. 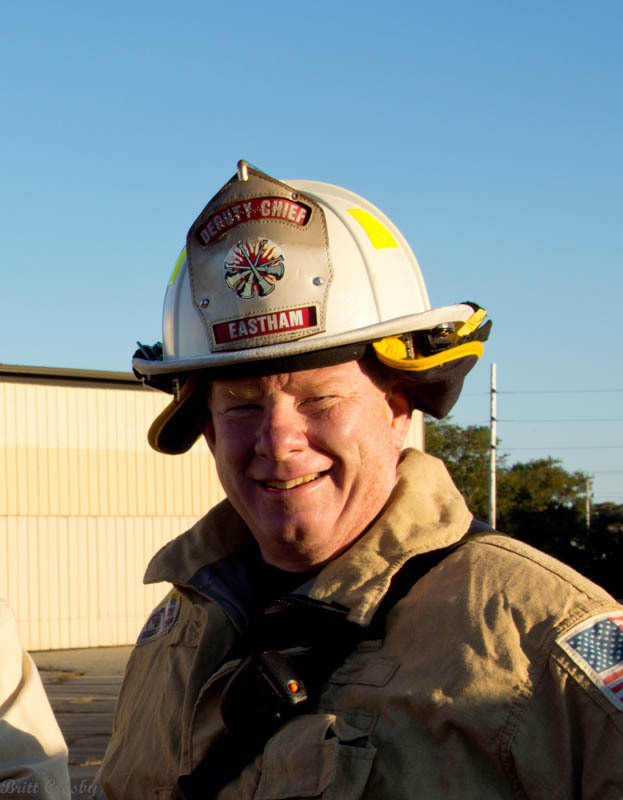 - Otis Fire Department - Chief Timothy Stephenson has announced his imminent retirement. Chief Stephenson has served Otis and Barnstable County for many years. Best wishes to him in his future endeavors. No announcement on his replacement. Mar 15, 2007. 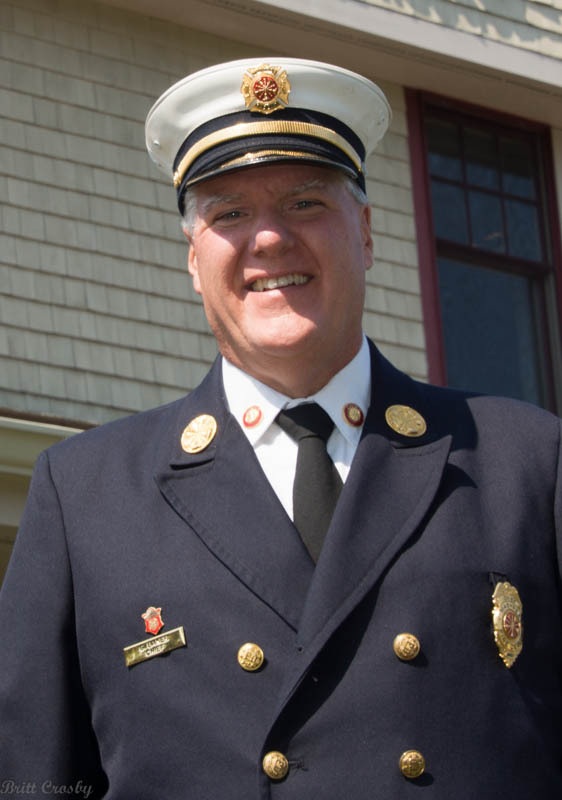 - From Nantucket FD, Edward Maxwell has been appointed Deputy Chief. Jan 2007. - Some sad news to report 12/7/06. 1. Robert "Bob" Black Jr, age 71, Ret. 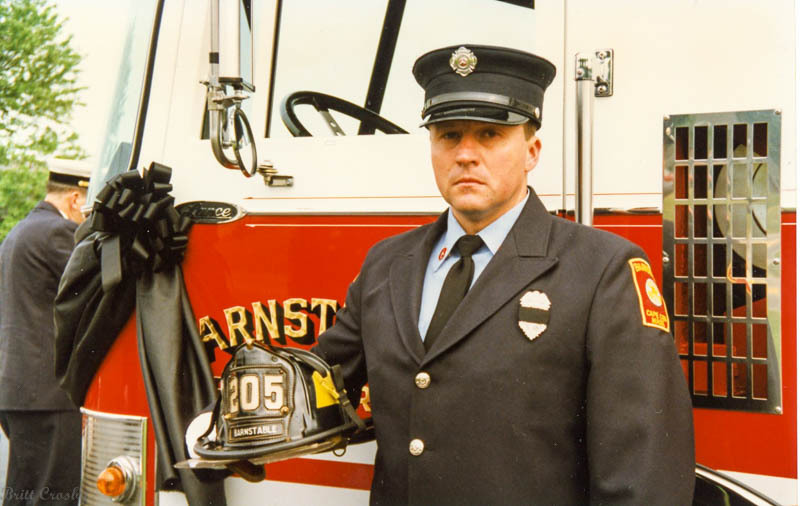 Capt & Paramedic, West Barnstable Fire Dept passed away on Dec 4, 2006. Capt Black was a long time member of the WBFD, serving as the first Captain of their rescue squad when formed in 1973 until his retirement in 1982. He was in the first paramedic class held on the Cape and was one of the first paramedics in Massachusetts. 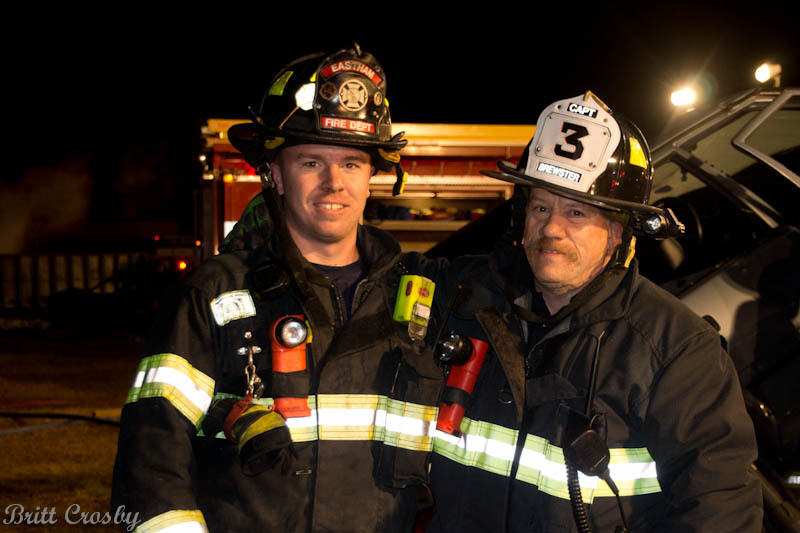 His son Robert Black III is presently a Captain / Paramedic on Sandwich FD and his grandson Rory is presently on WBFD. A memorial service will be held at John Lawrence Funeral Home is Marstons Mills on Sat Dec 9, from 2-4. Donations to WBFD Ambulance fund or firefighters Relief Association. 2. Cleveland Bernard "Bernie" Jones, age 80, Ret Chief, Sandwich FD (1960-1965) passed away on Dec 2, 2006. Chief Jones was a military veteran as well. 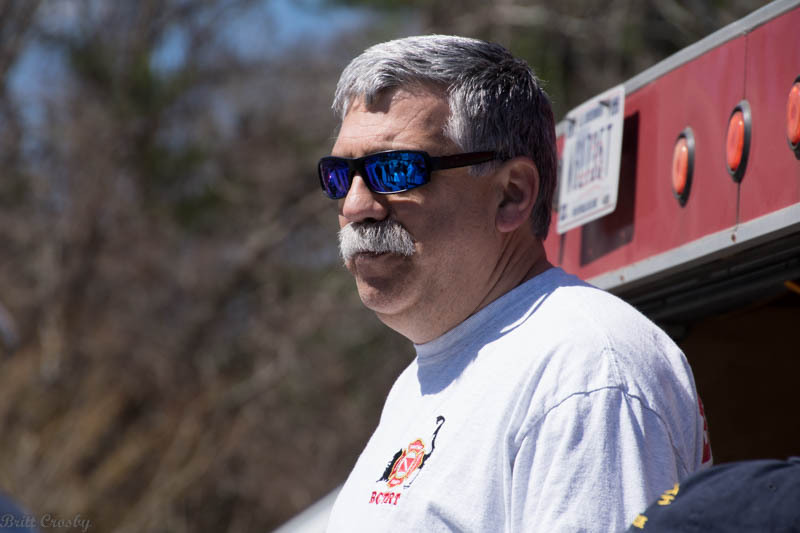 His son on-law Keith Lehmann recently retired from Sandwich FD. Visiting hours Friday Dec 8, 4-8 PM at Nickerson-Bourne Funeral Home, Rt 6A Sandwich. Funeral Sat Dec 9, 1:30 PM at Corpus Christi Parash, 324 Quaker Meetinghouse Road, East Sandwich. Donations Sandwich Prof Firefighters or Amer Cancer Society. 3. William D. "Sparky" Donovan, age 96, long time member of Sandwich Fire Dept and rescue squad passed away on Nov 19, 2006. Mr Donavon had a very interesting career working for the Army Corps of Engineers overseeing the marine traffic through the Cape Cod Canal for 52 years. He had a wonderful photo collection of nearly every ship that passed through the canal during his tenure. 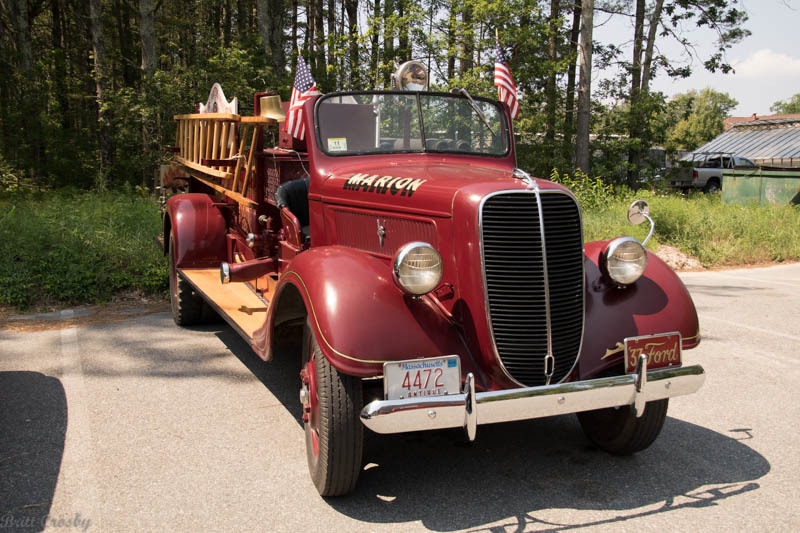 He was gracious in helping me with some great pictures of the early Sandwich apparatus and rescue vehicles that I used in my book "Cape Cod Firefighting" in 2003. - Bourne Chief Charles Klueber will be retiring on January 1, 2007. He is presently using his time and Deputy Chief David "Skip" Kingsbury will be sworn in as Acting Chief Nov.13, 2006. 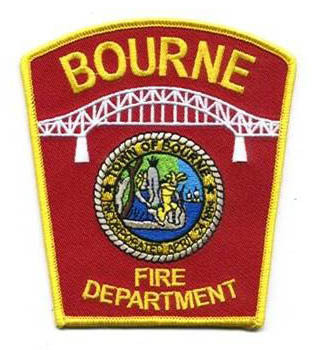 Bourne is civil service and a chief's list will be utilized in the spring to select a fulltime chief. 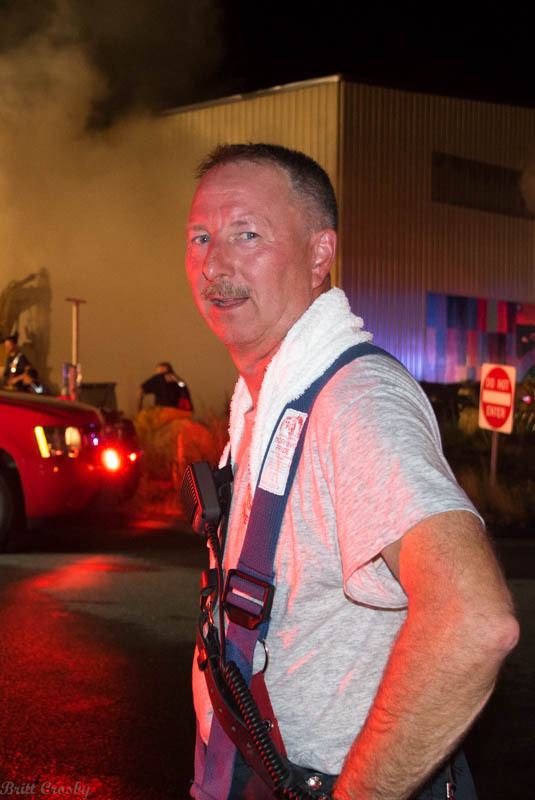 - COMM FD has announced the retirement of Master Mechanic Karl Sulkala. Karl was a member of the West Barnstable FD from 1966 to 1979, serving a number of years as the Deputy Chief in WBFD. He spent 4 years in the Air Force 1970-74 working on Crash Trucks. 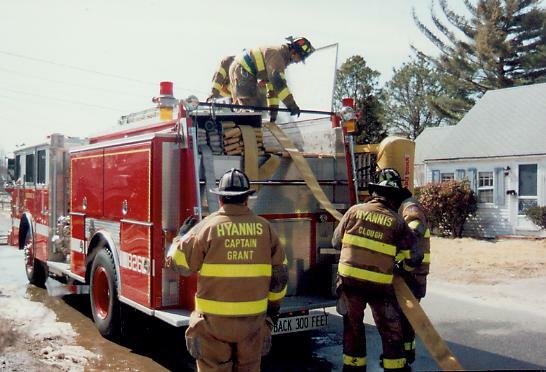 Karl joined the Hyannis FD from 1979-1985. From 1985 to 1988, he was a member of the Sandwich FD. In 1988, he joined the COMM FD and has served as a firefighter and master mechanic until his retirement Aug 21, 2006. 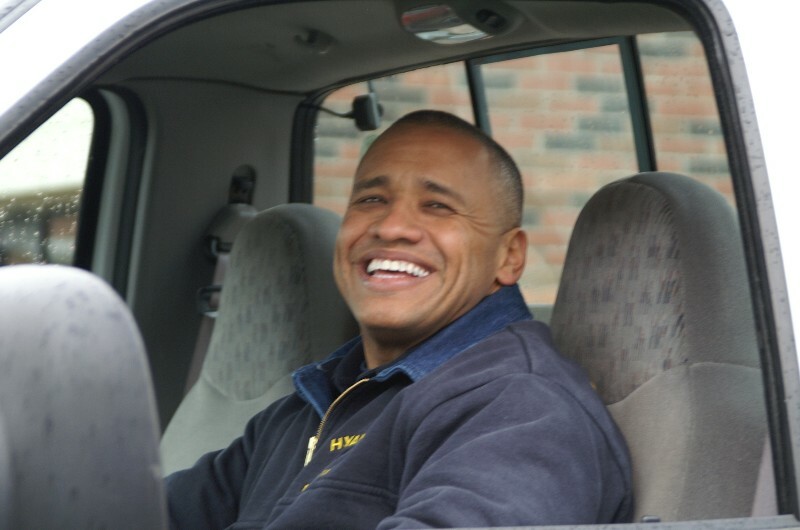 Karl has performed mechanical duties for several other departments and is well known across the Cape fire department community. He is expected to continue to be involved to various degrees in the fire service including delivering brand new fire apparatus and probably fixing things when needed. We would like to wish Karl a happy, healthy retirement, CONGRATULATIONS, and thanks for your 40 years of service to Cape Cod fire departments. - COMM FD has also announced the appointment of Lt./Paramedic Richard Scherbarth as the department's new fulltime EMS Officer. Lt Scherbarth has been a member of COMM FD since 1985. 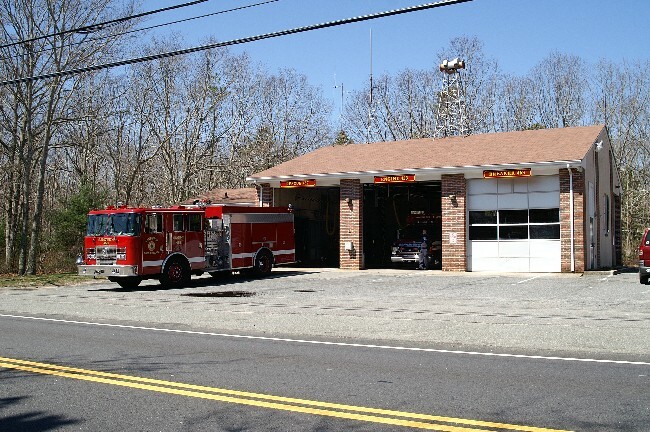 - Sandwich FD has added a radio frequency.... 484.825 186.2. The new channel supports two way communications backup to the 800 mhz trunking system. - A new DRC District 1 Forest Fire Warden has been named. Joshua Nigro will begin duty on April 24th. 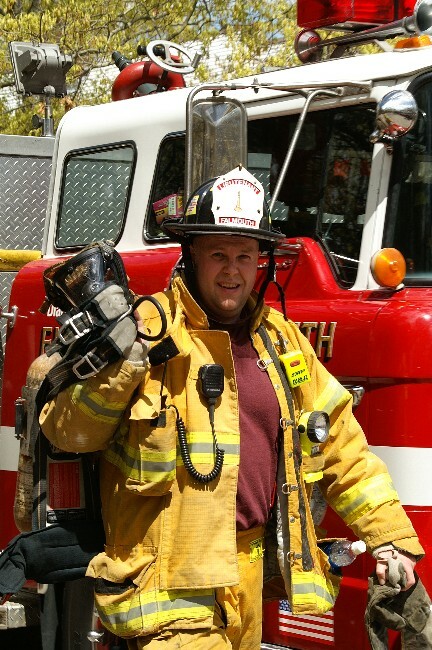 He is from Needham, MA and began his fire service career with Malden Emergency Center R2. He worked in District 14 DEM for a few years. He has also served in the US Army 59th MP co. with 2 tours in the mid east. 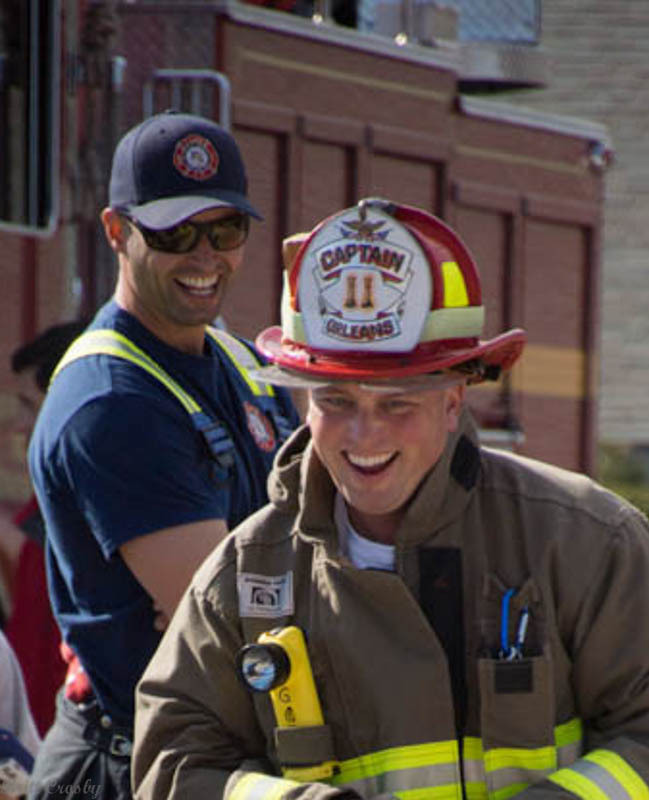 He has most recently been with a wildland fire crew out of El Paso County, Colorado as a Captain. He will assume District 1 Fire Warden duties for the Department of Recreation and Conservation at Shawme Crowell State Forest covering the Cape & Islands. Welcome aboard. 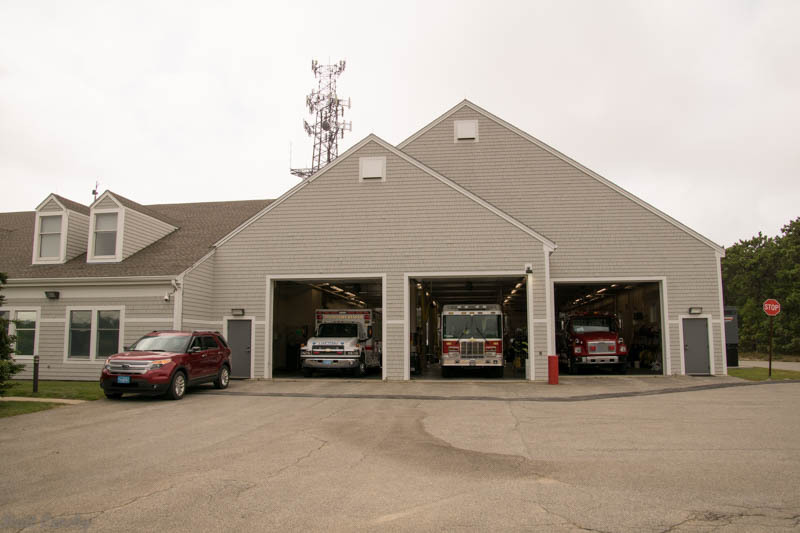 - Barnstable Fire Department has announced the end of its "Call" fire department. 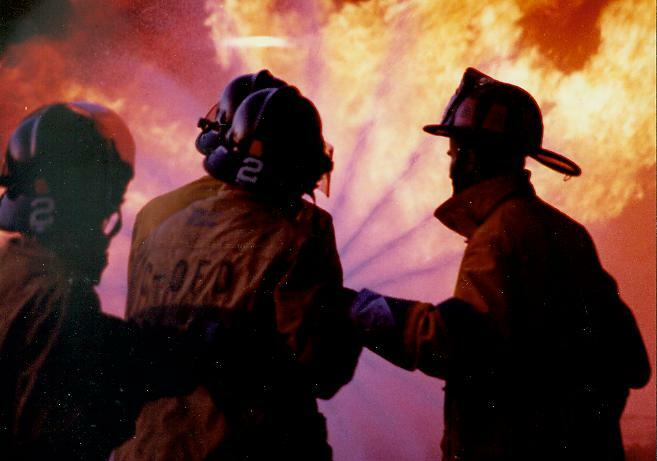 The Chief stated that the required training and insurance costs, and a poor overall response to alarms led to the decision. Barnstable thus becomes the latest to rely completely on fulltime personnel. The Sandwich Fire Department faced the same move last year. A number of personnel let go from both departments joined the West Barnstable Fire Department that still maintains a large, active call department. - Provincetown Fire Department regrets to announce the passing of retired Fire Chief James F. Meads. Chief meads passed away on Jan 9, 2006 at age 80. He joined the Provincetown FD in 1953 and was a founding member of the Ptown Rescue Squad. He served as Chief from 1983 to 1994. Services are to be held on Friday Jan 13. 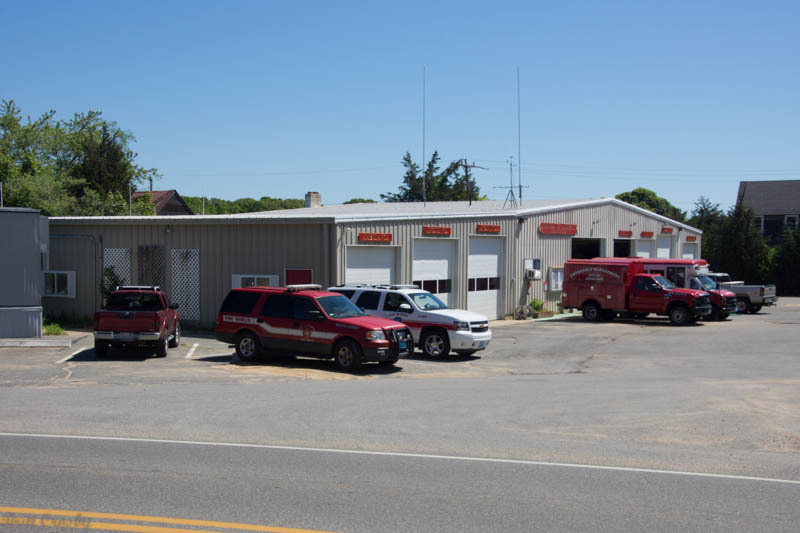 - Wellfleet Fire Department is interviewing 5 finalists for the position of Fire Chief with the retirement of Chief Alan Hight. 123005. 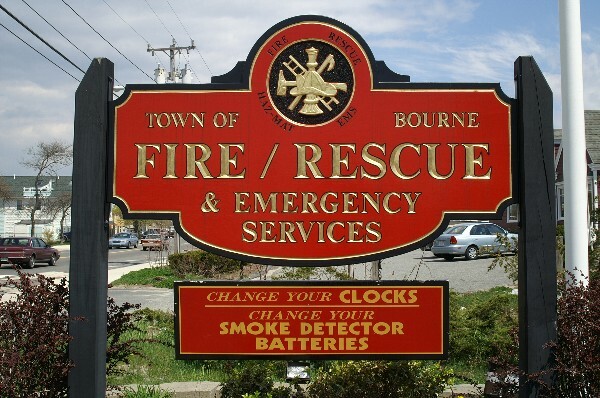 - West Barnstable will begin 24 hour staffing January 1, 2006. The recent hiring of two paramedics will enable WBFD to have one firefighter/paramedic on duty 24/7 with additional personnel on days. WBFD has also recently made some promotions and reorganized groups. 123005. 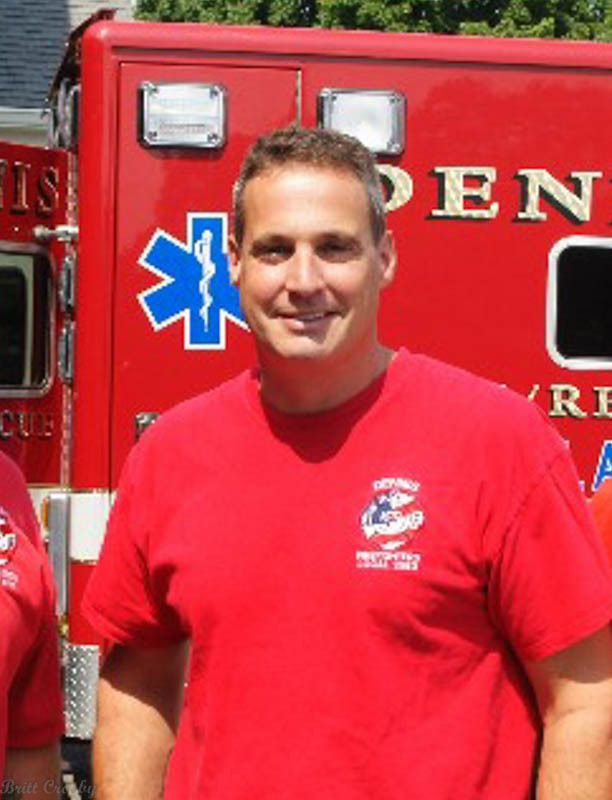 - Falmouth Firefighter & Paramedic Alden Cook has retired effective October 1, 2005. Alden has been a very active member of the fire - ems service on the Cape with leadership roles in CIEMSS, Inc. Best wishes to Alden in his retirement. 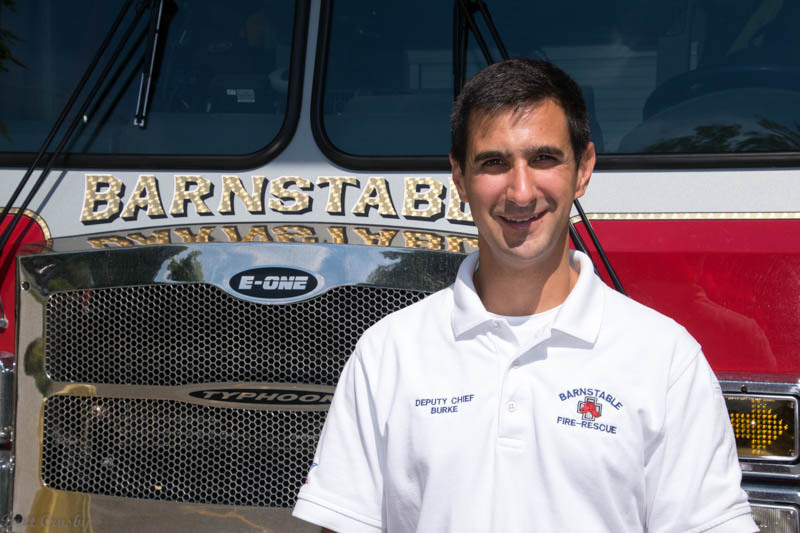 - West Barnstable Fire Department has announced the appointment of Captain Joseph Maruca to Chief of the West Barnstable Fire Department. The appointment came at the Prudential Committee Meeting on September 21, 2005. Congratulations to the Cape's newest Chief. - Retired Harwich Fire Chief Robert A. Peterson passed away September 18, 2005 at 1712 hours. open 24/7 unless there is sufficient manpower on duty. - Harwich Fire lost (4) Firefighter / Paramedics and (2) dispatcher to layoffs in May 2005. 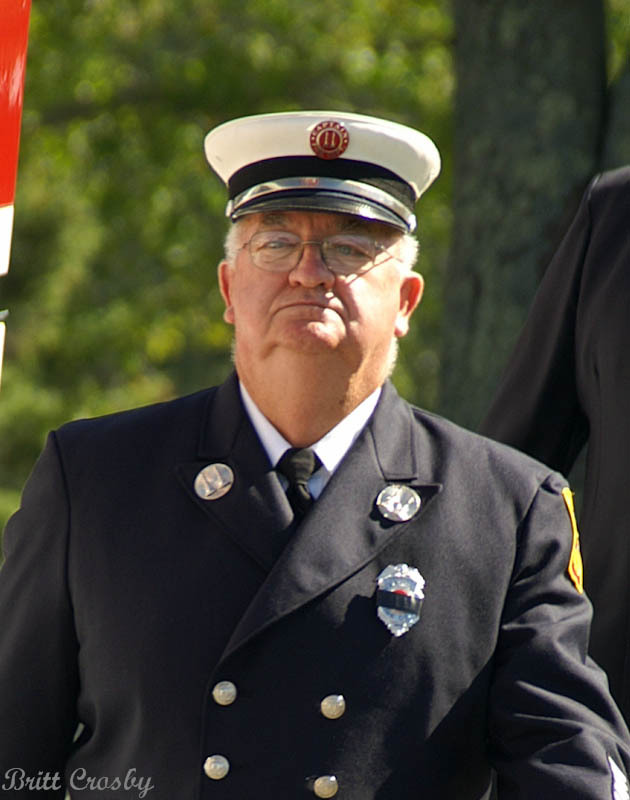 - West Barnstable Fire Chief John P. Jenkins retired on March 12, 2005 after 32 years as Chief. Deputy Chief Craig Pye acting chief. 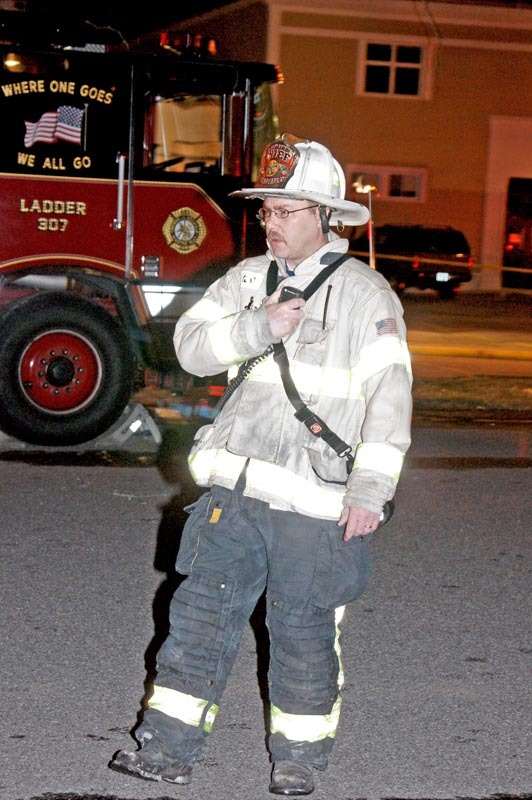 - New Chatham Fire Chief Michael Ambriscoe Jan 2005. - New Dennis Fire Chief Mark Dellner Jan 2005.